The Islamic State's rise to the status of one of the most sophisticated designated terrorist groups ever to exist has been accompanied by an unprecedented level of ingenuity, adaption and brutality on the battlefields it engages in across Syria, Iraq and abroad. Exploiting the lack of security after the withdrawal of U.S. troops from Iraq in 2011 and making smart use of the power vacuum in Syria it effectively hijacked the revolution's original goals. The Islamic State would quickly present itself as a threat like no other – not only to Syria and Iraq, but to the entire world. 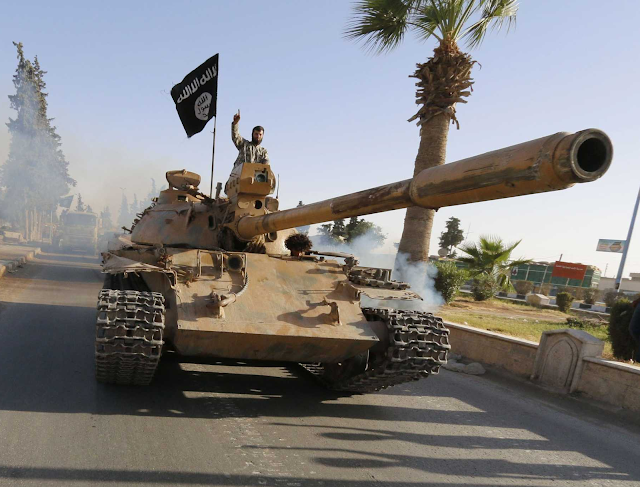 At the forefront of the Islamic State's sudden metamorphosis from a militant group in Iraq to a self-proclaimed caliphate controlling large swaths of land in Iraq, Syria and across the globe is its ability to quickly adapt to the various situations encountered on the battlefield, its ingenuity in coming up with appropriate adaptations and their enthusiastic execution of said adaptations. The sudden change in the scope of warfare the Islamic State's rise brought to Syria and Iraq would be a shock to those caught up in it, and could only be contained through the massive influx of manpower, weapons and perhaps above all, airpower. This massive force aimed at the destruction of the Islamic State would be pitted against a self-proclaimed caliphate that hadn't seen an equivalent since the fall of the Islamic Emirate of Afghanistan in 2001, positing itself as a power that could engage its enemies in both guerrilla and conventional warfare. The huge amounts of weaponry captured by the Islamic State allowed it to directly challenge stronger foes on the ground which, despite the constant threat of precision-guided strikes against its assets, included the deployment of large numbers of heavy weaponry during operations in both Syria and Iraq. 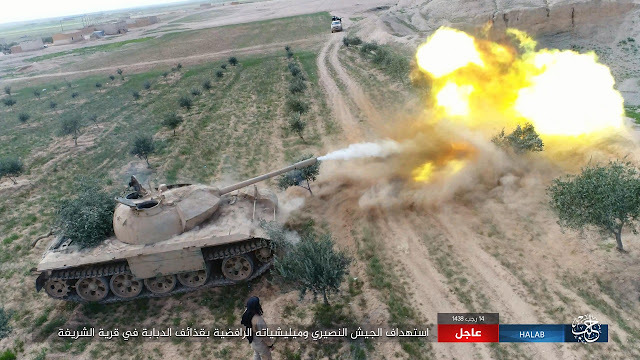 The use of armoured fighting vehicles in these operations is no exception, with the Islamic State having captured and operated more than 200 tanks and around 70 BMPs in Syria alone, making it the second-largest operator of armour behind government forces. 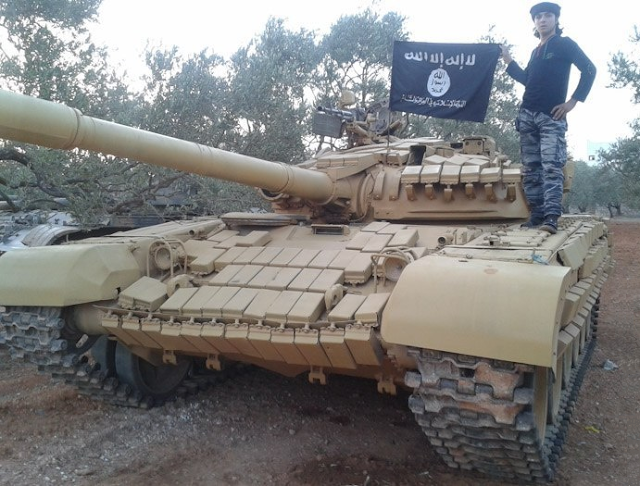 While practically all of the many rebel factions wrestling for control over Syria have operated armoured fighting vehicles (AFVs) at some point during their existence, only the Islamic State would deploy armour on such a large and organised scale, even surpassing the militaries of many established nations states in amount and quality of its equipment as well as tactics employed. 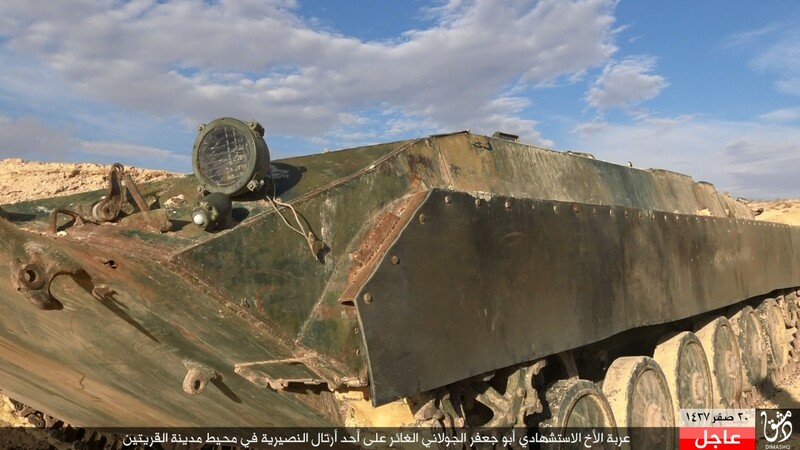 In an effort to provide technical support for this fleet of AFVs, several Wilayats (governorates) throughout the Islamic State established armour workshops for repairing and modifying vehicles for future use on the battlefield. While every governorate has workshops tasked with producing up-armoured vehicle-borne improvised explosive devices (VBIEDs), only a handful of Wilayats have a meaningful industry capable of repairing and modifying armoured fighting vehicles. 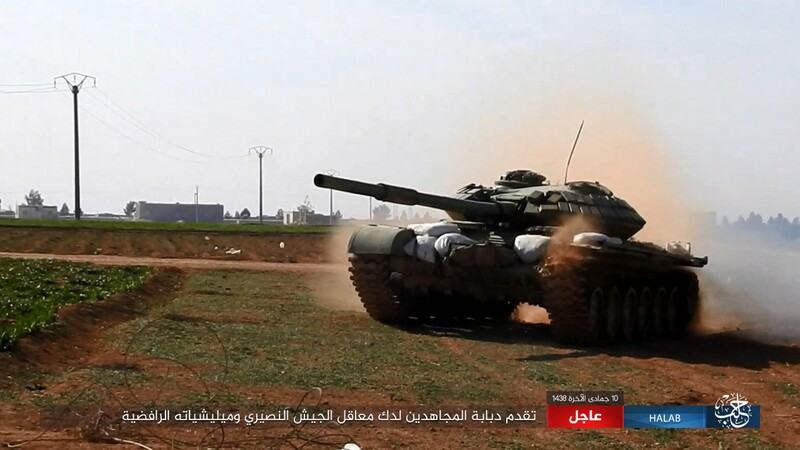 In Syria, two major workshops would be established,:'The Workshop' located in Wilayat al-Raqqa (Raqqa) and another (Armour in the Islamic State, the DIY works of Wilayat al-Khayr) in Wilayat al-Khayr (Deir ez-Zor). This article will cover the works of the 'Workshop of the Tracked' in Wilayat al-Raqqa, better known as 'The Workshop'. 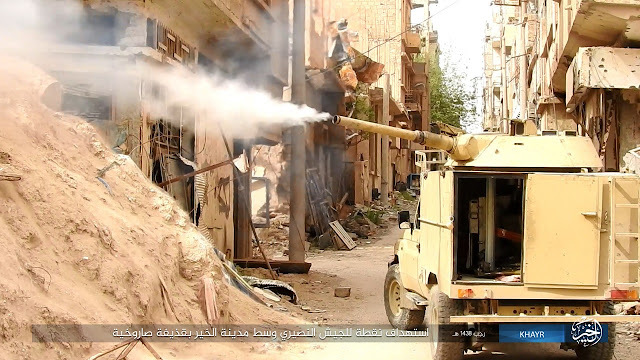 While the Islamic State is well known for operating all kinds of contraptions for use on the battlefields in Iraq in Syria, ranging from earthmovers modified for the role of vehicle-borne improvised explosive devices (VBIEDs) to simple up-armoured civilian vehicles crude in appearance, the attention some of these monstrous contraptions have received has given the Islamic State the reputation of solely operating such vehicles and being incapable of utilising more conventional weaponry. Not only is this stereotype incorrect, the often heard arguments doubting the effectiveness of Islamic State's armour in the face of precision-guided airstrikes are also greatly exaggerated. 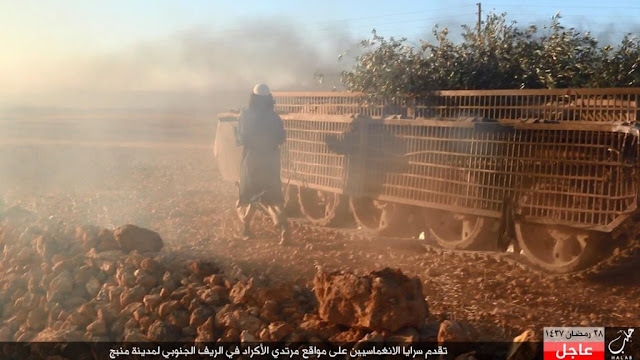 Despite intensive efforts by the Coalition and to some degree the Russian Air Force at degrading the Islamic State's heavy weaponry throughout Syria and Iraq, the Islamic State was freely able to operate AFVs on most Syrian fronts it has been fighting on since the commencement of Coalition airstrikes in late September 2014, with only little risk of being targeted. Large numbers of these armoured fighting vehicles were in fact products of 'The Workshop'. 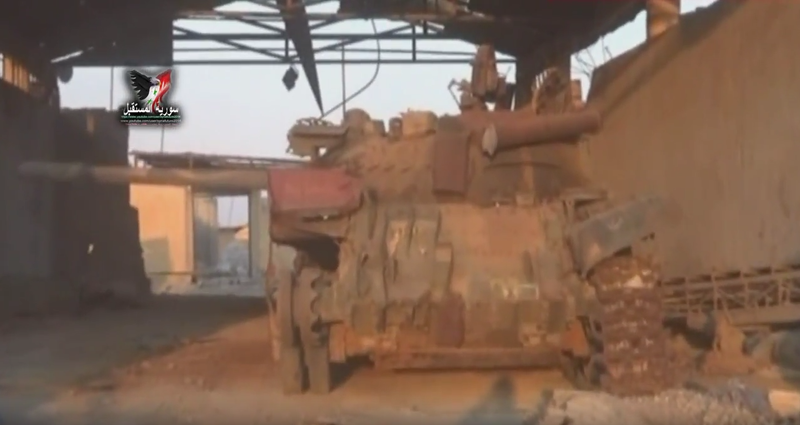 'The Workshop' is the second-largest armour repair workshop to have existed in Syria, but in terms of activity could very well have been the single most active in the country. Since its inception in the summer of 2014, 'The Workshop' is believed to have overhauled and upgraded over 150 armoured fighting vehicles before its demise three years later in June 2017. 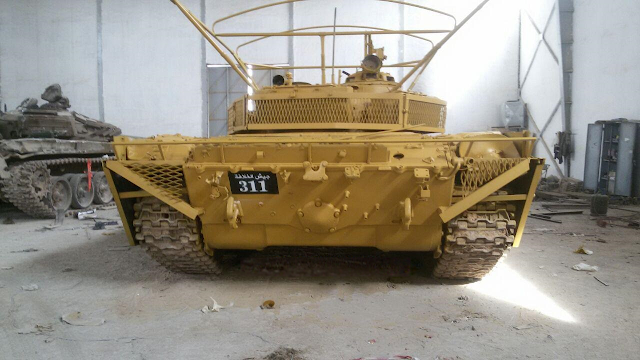 This number accounts for more than half of the Islamic State's inventory of tanks and BMPs it operated since 2014, a testimony to the scale of the Islamic State's efforts aimed at overhauling and upgrading AFVs for future use on the battlefield. 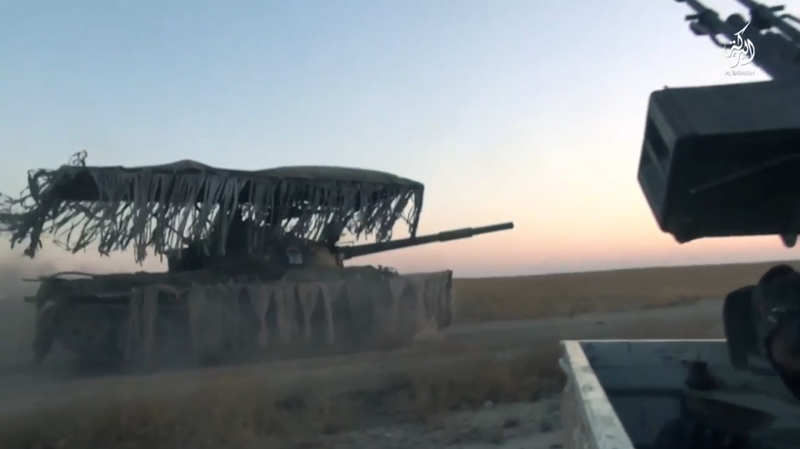 The facility would perform a wide variety of overhauls and upgrades on nearly all types of armoured fighting vehicles in use with the Islamic State, ranging everything from installing multi-spectral camouflage on tanks to the up-armouring of AFVs and even constructing modular turrets for installation on four-wheel drive vehicles such as the Toyota Land Cruiser. While located in Wilayat al-Raqqa, its products would show up throughout the whole of the Islamic State, including Wilayats in Iraq. 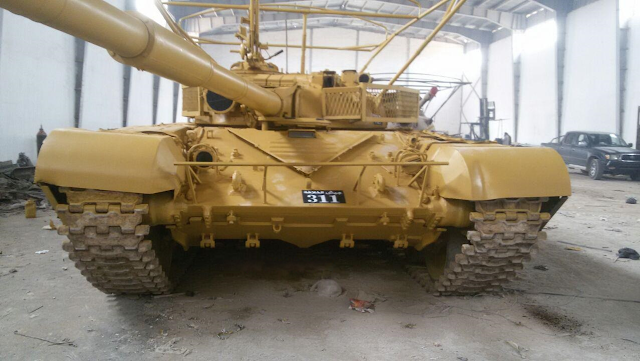 Indeed, several ex-Syrian T-55s overhauled at 'The Workshop' could be seen in action during the Islamic State defence of Mosul, and would later be captured by Iraqi forces. 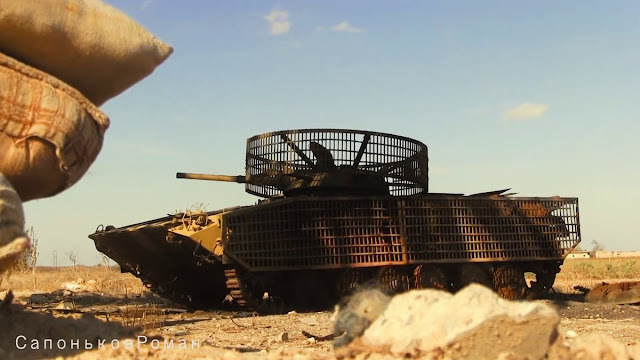 In addition to providing an overview of the projects undertaken by 'The Workshop' since its inception in 2014, this article will also follow the life of some of the Islamic State fighters who operated the upgraded armoured fighting vehicles in combat throughout Syria. 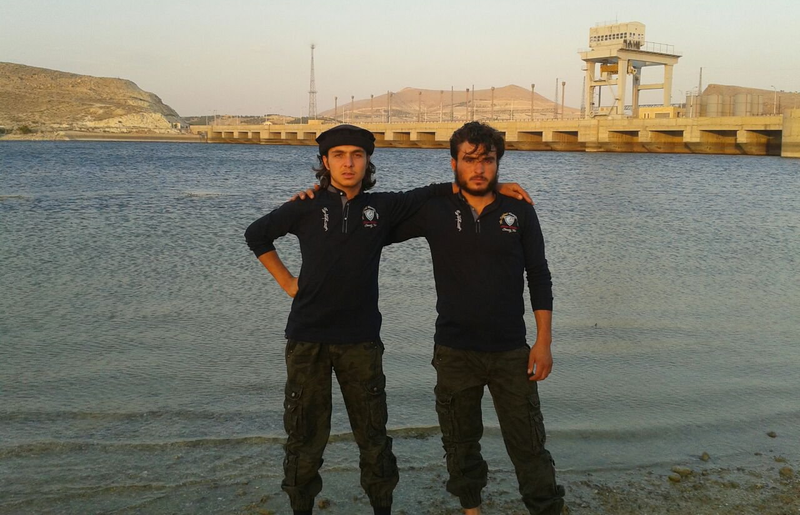 The photos showing the fighters' daily life in Syria present an interesting look into the surreal life of an Islamic State fighter, which includes everything from spending time with friends and family to taking detailed photographs of bodies after mass executions and beheadings. The wealth of personal images taken by these Islamic State fighters would also allow the author to pinpoint the exact location of 'The Workshop', both a testimony to open source intelligence (OSINT) and operations security (OPSEC), the latter of which clearly ignored by the Islamic State fighters working out of 'The Workshop'. This goes to show the importance of OPSEC during wartime, where one image can make the difference between being targeted or escaping detection. 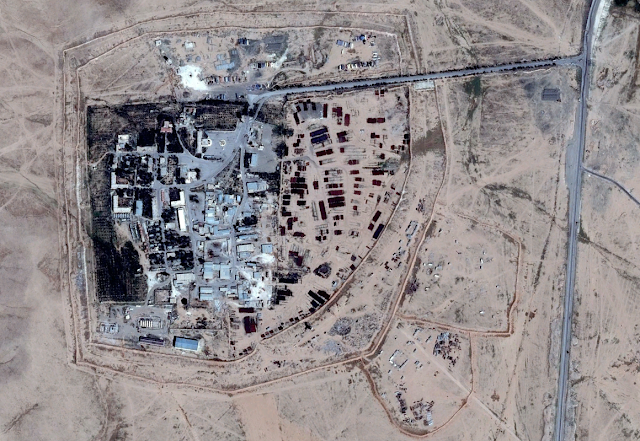 The location of 'The Workshop' first became apparent in June 2016 after images taken inside the armour repair workshop could be used to geolocate the structures seen in the images, which ultimately corresponded with a facility located just fourteen kilometers Southwest of Tabqa airbase: the Thawrah Industrial Facility and Workers' Housing. This facility was originally built as a housing complex and support facility for the many oilfields located in this region, and would provide the Islamic State with the perfect location for the establishment of an armour repair workshop. Although the location of 'The Workshop' had already been discovered, the constant stream of additional information and images that allowed for an ever more comprehensive article on the facility unfortunately led to its delay for over a year. Interestingly, it appears the location of 'The Workshop' has thus far eluded most analysts, despite the fact that it received its fair share of attention over a year ago. 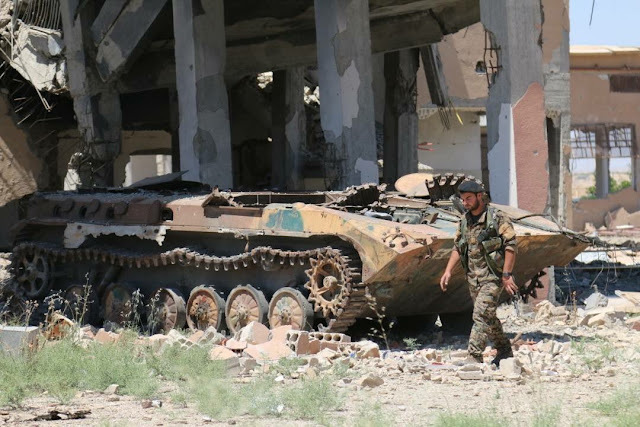 On the 2nd of June 2016, regime forces launched the disastrous 'To Raqqa' offensive with the aim of establishing a foothold in the Raqqa Governorate. 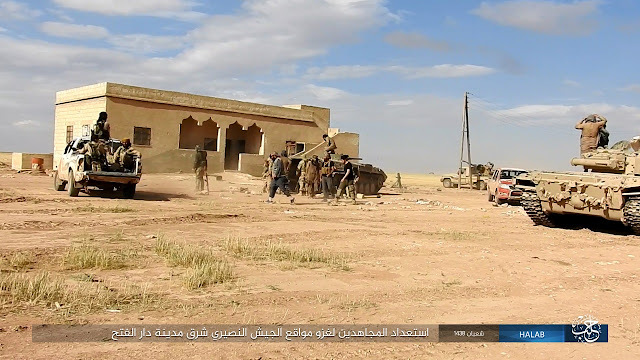 Advancing along a narrow stretch of road, regime forces quickly reached the Safiya crossroad before heading North, eventually reaching 'The Workshop', which was likely already abandoned by the Islamic State before its capture. 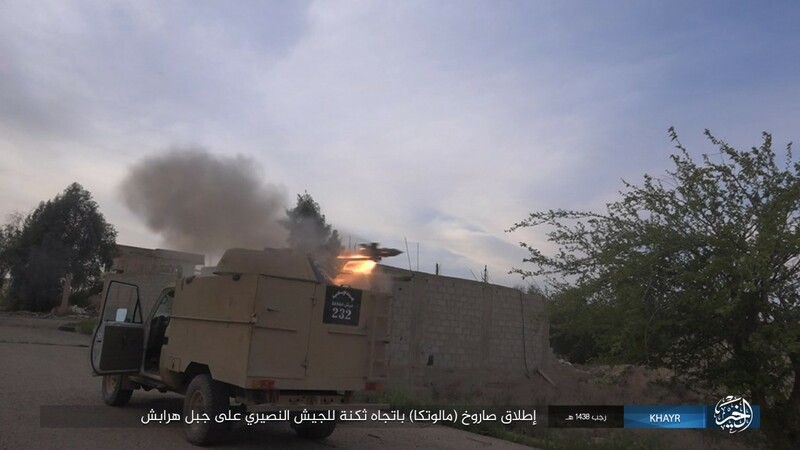 Despite reaching its location without any major setbacks, a sudden Islamic State counterattack quickly recaptured 'The Workshop' and reversed all gains that had been made by regime forces in the previous days, ultimately allowing it to return to normal operations. 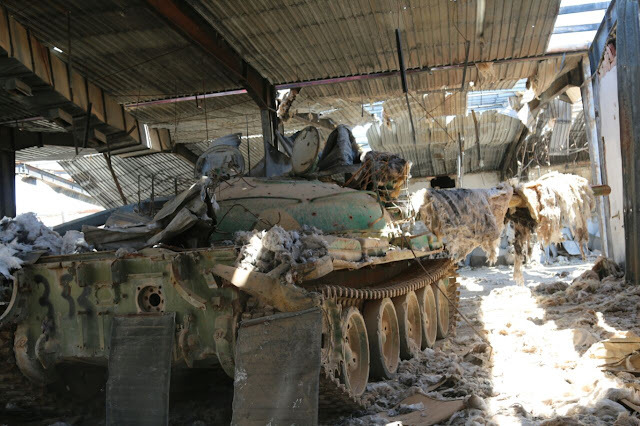 Much to the authors' surprise, and despite the obvious presence of several tank wrecks cannibalised for spare parts in 'The Workshop' itself, it appears that even regime forces were completely unaware of the nature of the facility they had just captured. 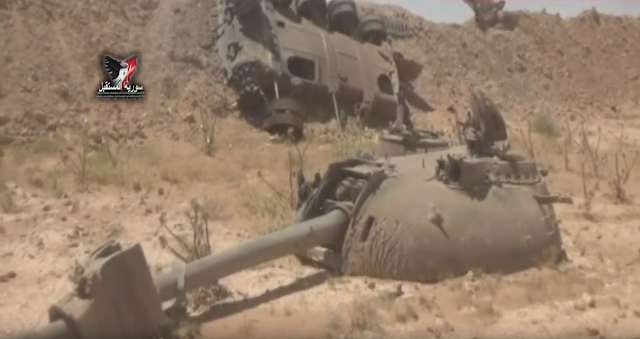 To add insult to injury, Amaq News Agency even released footage of the partial remains of two T-72M1s cannibalised for spare parts located in 'The Workshop' after the fighters of the Islamic State had recaptured the facility from regime forces. 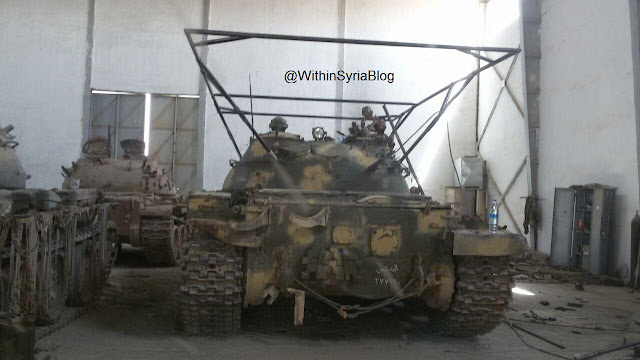 While it appears that nobody knew the exact whereabouts of 'The Workshop', it is certain that the Coalition was already aware of the facility as of the 30th of August 2016, when an airstrike targeted a BMP-1 that was in the process of being converted to a VBIED in the largest structure of the facility, resulting not only in the destruction of the BMP-1, but also of the whole building. 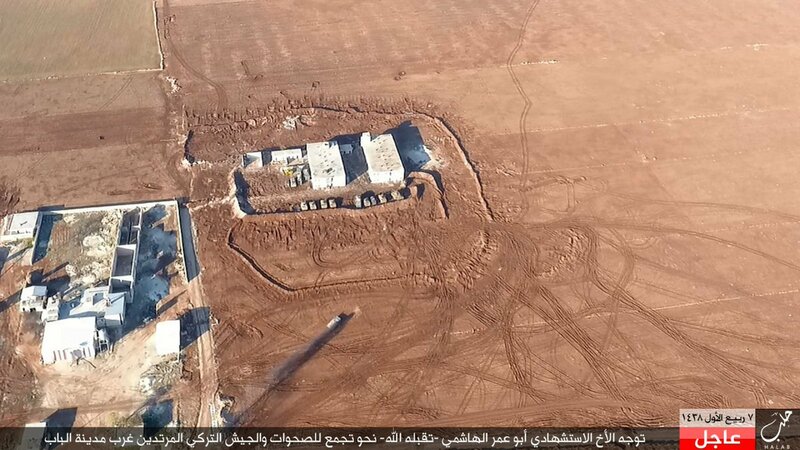 Satellite imagery obtained from Terraserver already reveals heavy damage to two other structures on the 24th of August 2016, but it remains unknown if this was the result of the fighting between the Islamic State and regime forces here in June or another Coalition airstrike. 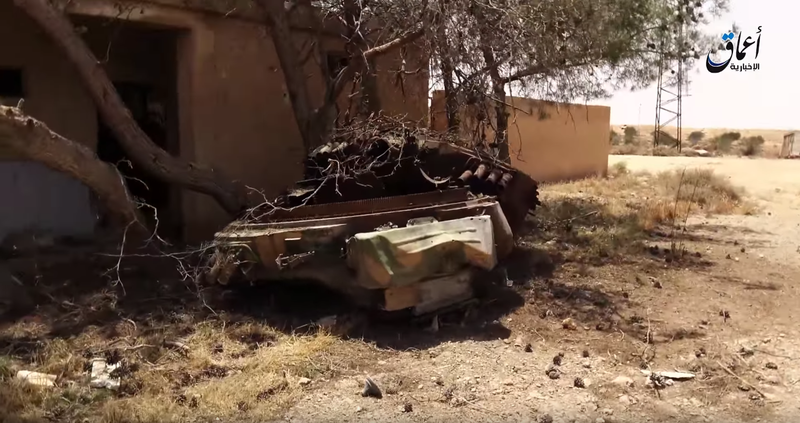 Despite the fact that the Coalition struck 'The Workshop' on the 30th of August 2016, it remains unknown if they were ever fully aware of the exact nature of the facility, possibly only striking the BMP because it was discovered by accident. 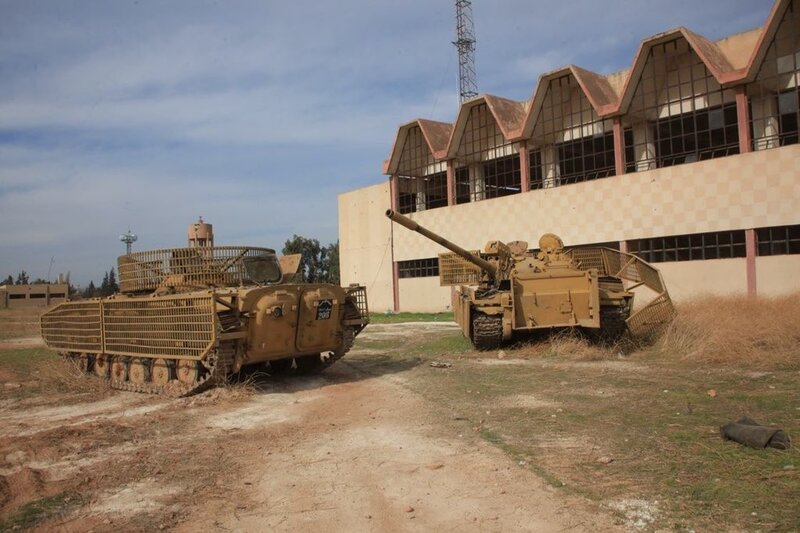 While one could argue that Coalition intelligence should have been able to identify this facility early on with the amount of resources it possesses, the fact that more than 150 armoured fighting vehicles could be overhauled and upgraded here seems to directly contradict this possibility. While regime forces not only captured the facility, but would also be presented with large numbers of photographs taken inside 'The Workshop', it is likely that the sheer inefficiency of the Syrian military apparatus prevented any action to be taken against it. What is certain however is that 'The Workshop' was able to carry out its work unhindered by airstrikes for over two years. Indeed, despite having been captured by regime forces and being struck by the Coalition in a timespan of just several months, work is believed to have continued at an even faster pace than before. 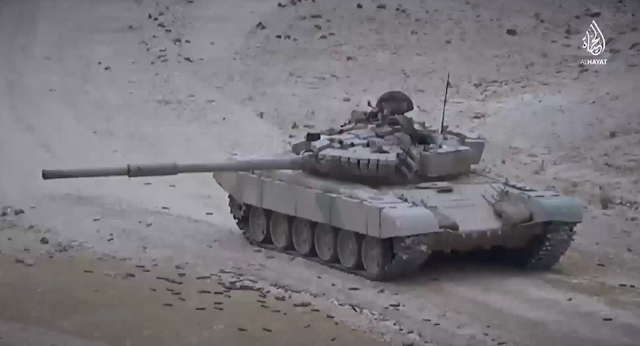 Due to the simplification of several of its designs, the past year would allow 'The Workshop' to overhaul and upgrade the largest number of tanks since its inception in 2014. 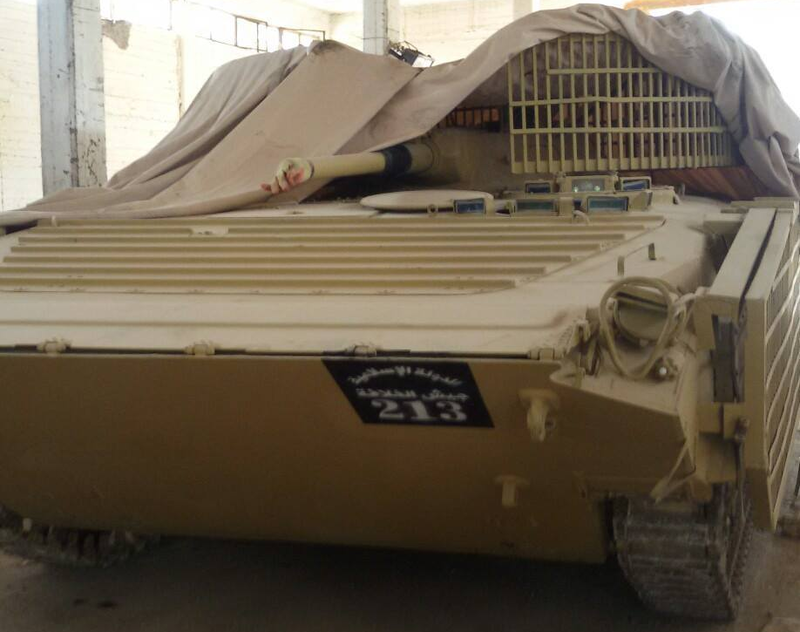 The delegation of at least a part of the work to newly set-up armour repair workshops in Wilayat al-Raqqa can't be excluded however. Although the location of 'The Workshop' might seem randomly chosen, it is highly likely that the Thawrah Industrial Facility and Workers' Housing was chosen for the strategical location it occupies. 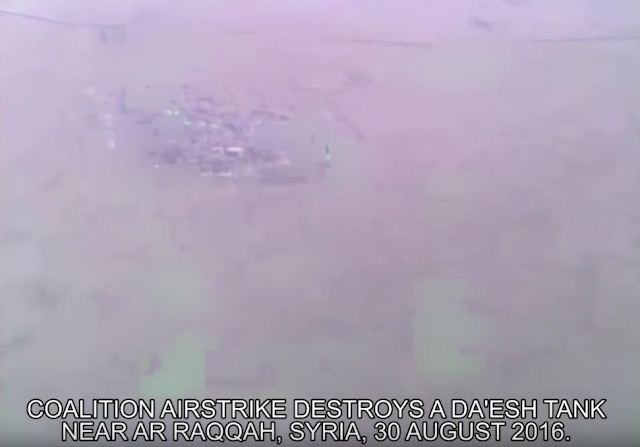 Situated just South-West of of Raqqa, it was located at a seemingly deserted spot in the desert, one that would not attract much attention from the Coalition's aerial assets. 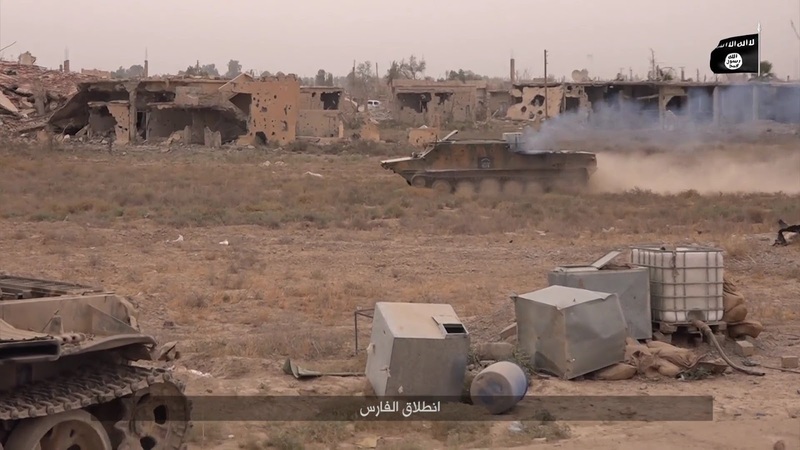 Its central location and close proximity to Raqqa was also ideal for sending armoured fighting vehicles to the various fronts the Islamic State was fighting on without having to risk detection by driving through Raqqa. While a lack of airstrikes against 'The Workshop' allowed the Islamic State to continue using large amounts of armoured fighting vehicles on the front, it is important to note that although airstrikes would surely have crippled the 'The Workshop' for a short period of time, it could have easily moved elsewhere shortly afterwards. 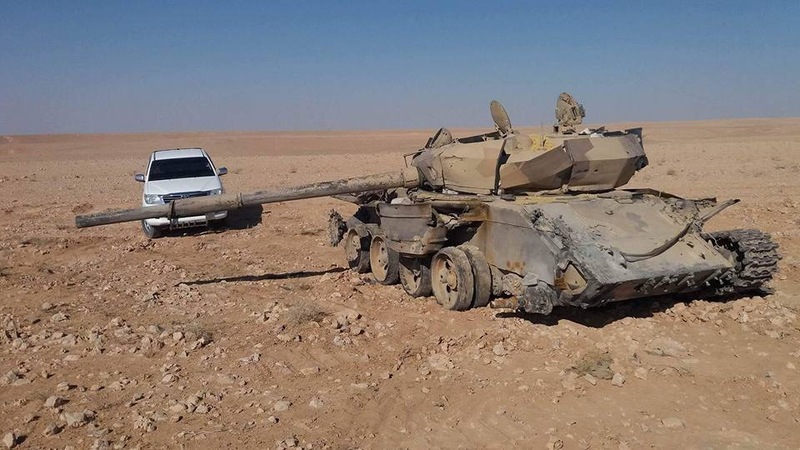 It is certain however that intensive aerial reconnaissance around Tabqa could not only have prevented 'The Workshop' from delivering overhauled vehicles to its operators, but also from receiving AFVs to overhaul and upgrade in the first place. It was initially believed the quick advances made by the Syrian Democratic Forces (SDF) around Tabqa would ultimately result in the capture of the 'The Workshop'. Surprisingly, the SDF halted their advance just a few kilometers away from the facility. As quiet as 'The Workshop' came into being and remained during its operations, the now abandoned facility would eventually be recaptured by government forces in early June 2017, just short of three years after its initial inception. Almost completely unreported during its three years of service, 'The Workshop' was to remain wholly uncovered by the media despite its significant impact on the course of the Syrian War. 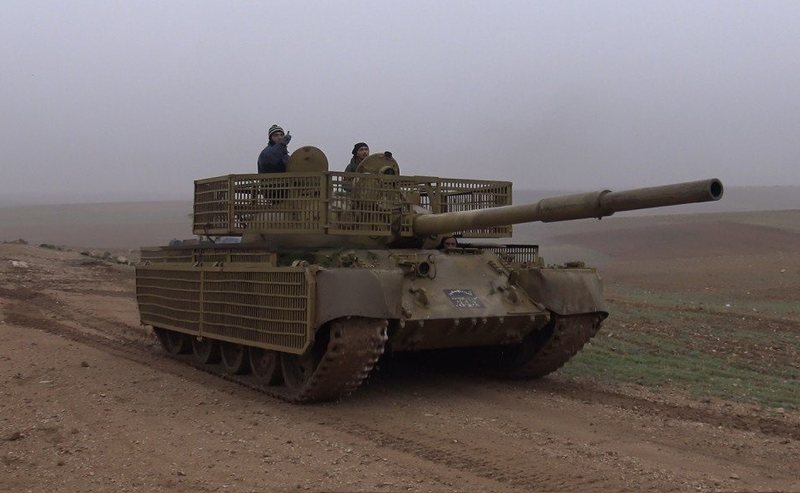 The story of the actual tanks overhauled and upgraded by 'The Workshop' begins on the 26th of January 2014, when a convoy of vehicles belonging to what was then still named the Islamic State of Iraq and al-Sham (ISIS) made its way through Northern Aleppo. 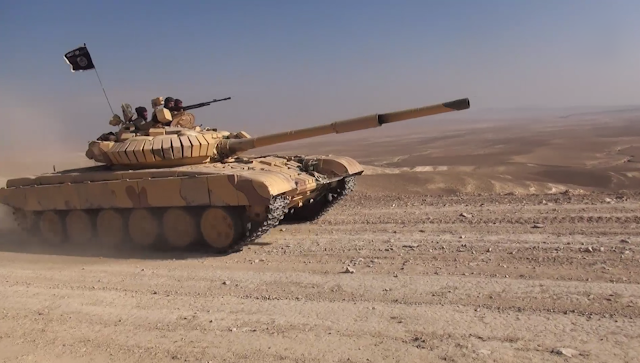 Although featuring little in terms of heavy armour, the T-72AV leading the convoy would later provide the first hint that the Islamic State had begun performing upgrades on its tanks and other armoured fighting vehicles. More interestingly, it gave us a first look at an Islamic State unit that would participate in nearly every major Islamic State offensive throughout 2014. It is believed that experience gained with this particular unit would later lead to the establishment of several other such units, which will be referred to as سرية المهام الخاصة - 'Platoon of Special Tasks' in this article. Sometimes (incorrectly) referred to as جيش الخلافة - Jaish al-Khilafa (The Caliphate Army), the Platoons of Special Tasks would be responsible for nearly every major Islamic State offensive conducted in Syria since 2014. 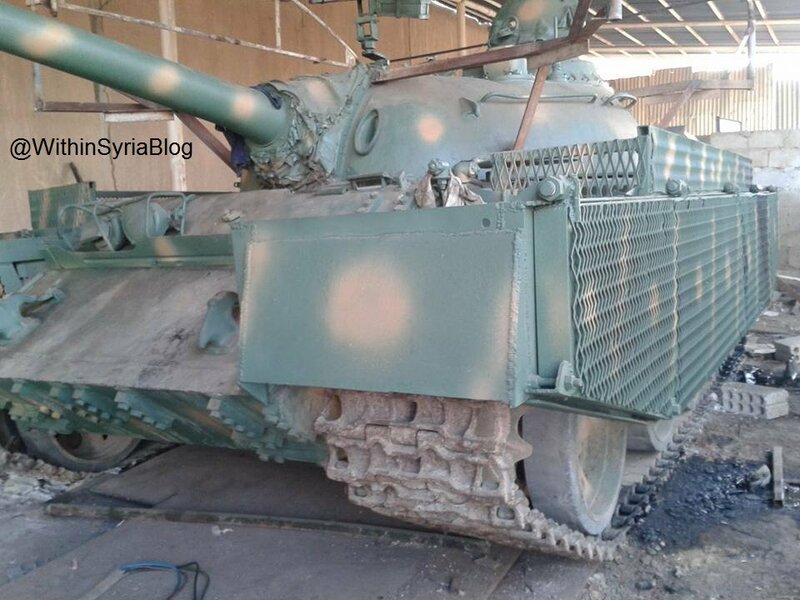 It would take only a few weeks before this T-72AV would be photographed again, this time after having been modernised by 'The Workshop'. This is believed to be the one of the first tanks to have underwent significant modifications at this facility, which included a complete rearrangement of its explosive reactive armour and a new coat of paint. 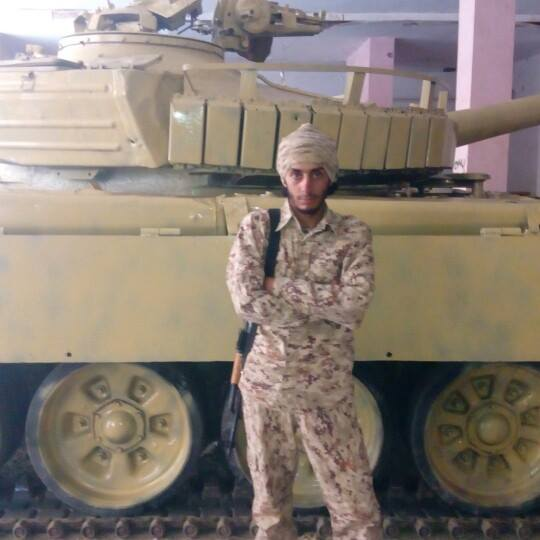 These photos would also give us a first look at some of the personnel manning Islamic State armour: Abu Hamza al-Khalidi and Abu Omar al-Mansouri (alternate names made up for this article), both of which serving in the كتيبة الدبابات - 'Tank Battalion'. 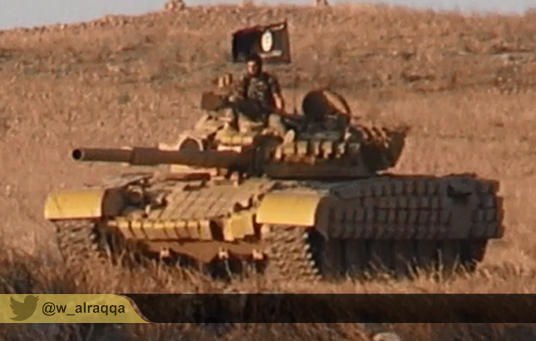 The same tank would reappear only a short time later at Raqqa's grain silos, located in the Northern part of the city. 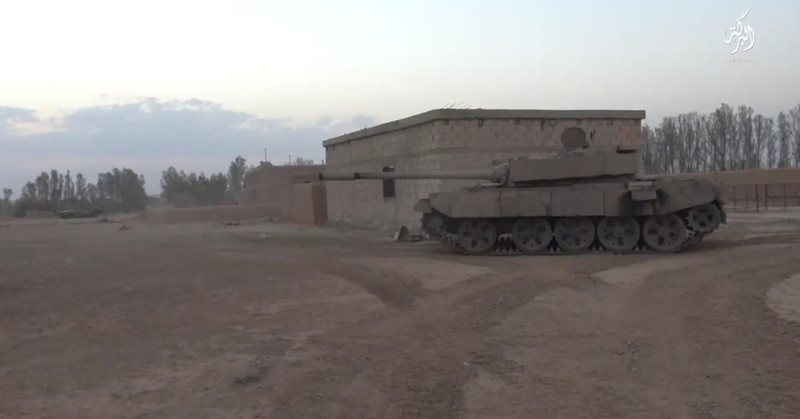 This facility previously served as a base for the 'Tank Battalion' and 'Platoon of Special Tasks', but any presence of armour near the grain silos soon became impossible due to extensive Coalition efforts to seek and destroy Islamic State fortifications in the city, which would ultimately also result in the targeting and destruction of the nearby warehouses by Coalition airstrikes. Despite playing no role in the overhauling and upgrading of Islamic State armour, this facility was misidentified as 'The Workshop' on several occasions however. 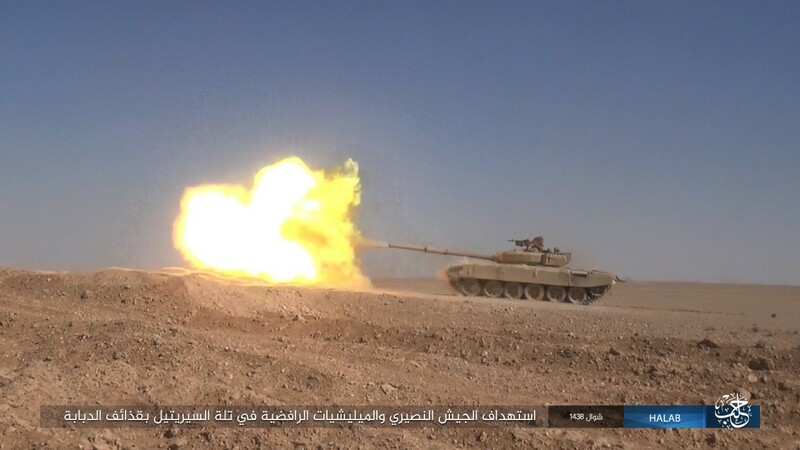 The grain silos also served as the main rally point from where Islamic State forces made their way to Ayn Issa in a bid to capture Brigade 93 in early August 2014, which also included the T-72AV. This offensive would eventually result in the capture of the base on the 7th of August. Of interest is the damage that occurred to the row of of explosive reactive armour bricks installed on the lower glacis plate, which must have occured as the tank was transported from 'The Workshop' to the grain silos. 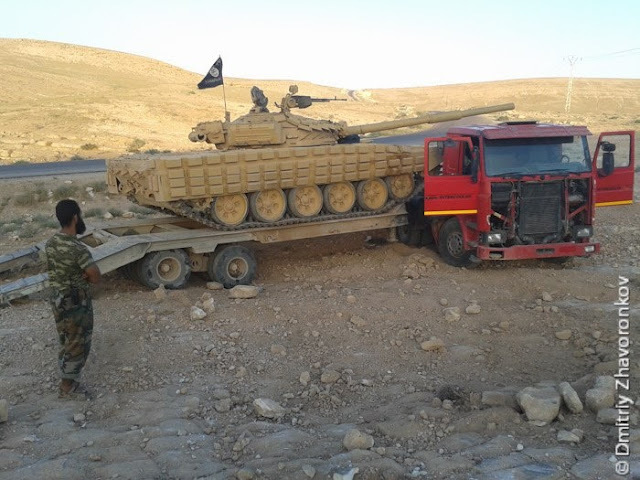 The by now all too familiar T-72AV being loaded onto its trailer. Interestingly, the normal dense arrangement of Kontakt-1 explosive reactive armour (ERA) on the side skirts was switched for a more evenly distributed array of ERA. The placement of Kontakt-1 on the rear mudguards is notable, as it serves little to no purpose in terms of increased protection and could instead have been placed on real weak spots, of which the T-72 knows all too many. 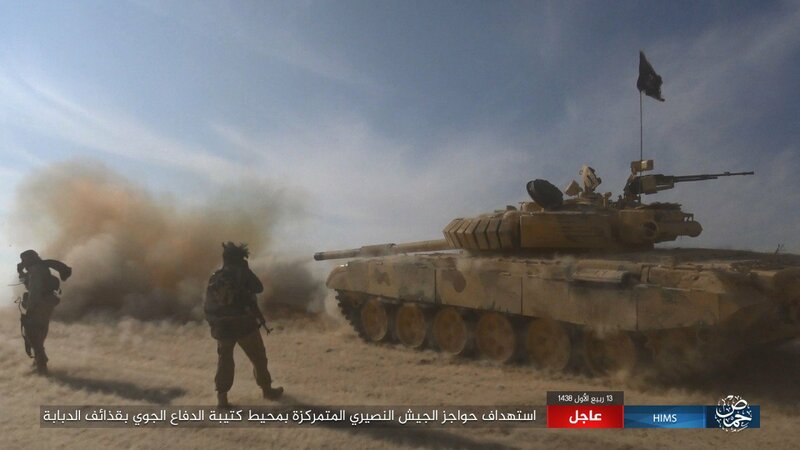 Images released by the Islamic State after it captured the isolated Brigade 93 would also show the T-72AV again, which took part in the offensive along with several other tanks of the 'Tank Battalion'. 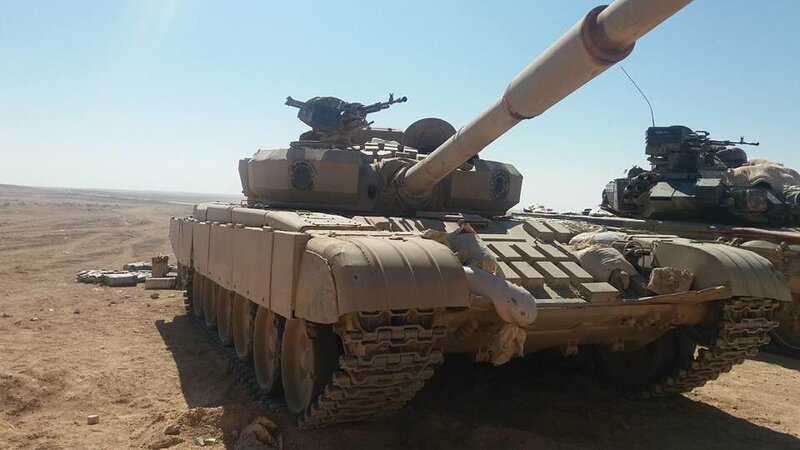 Despite being the first public sighting of the tank in its new configuration, no further images or footage of the T-72AV was shared by Islamic State media in the months after the offensive. This for reasons that would soon become evident. The sad remains of the T-72AV after being hit by presumably two projectiles, with the subsequent fire resulting in the definitive destruction of the tank. 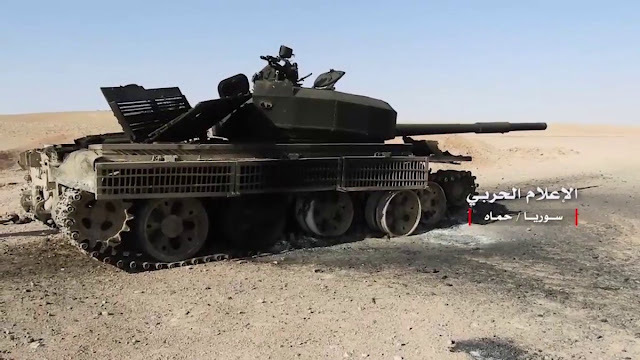 Ironically, one of the projectiles fired at the tank appears to have hit the front of the turret that was left without explosive reactive armour after it was removed here for installation on the new side skirts. This image was taken by one of the members of the 'Tank Battalion', all of which are believed to have survived the destruction of the tank. 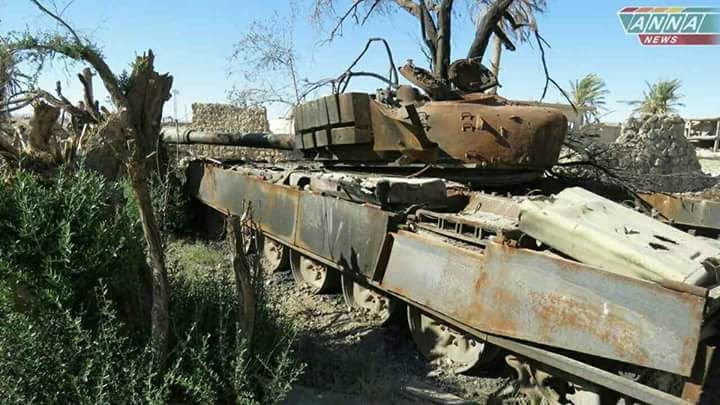 The tracking of the aforementioned T-72AV presented itself as a rare occasion in a conflict that has seen the participation and destruction of thousands of armoured fighting vehicles, and could not have been possible to this extent without the photographs taken by Abu Hamza al-Khalidi. 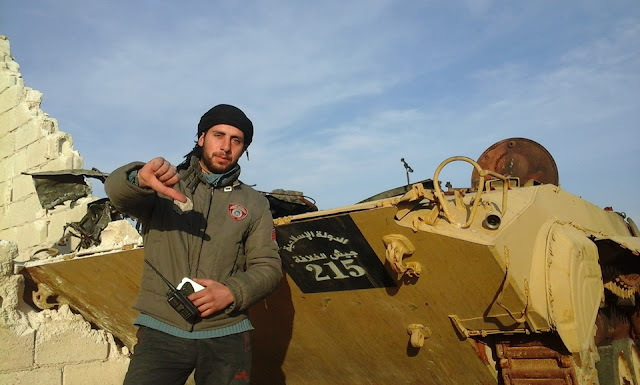 The digital footprints of this member of the 'Tank Battalion' would not only aid the author in identifying the location of 'The Workshop', but would also prove vital in the identification of other members of 'Tank Battalion', the armoured fighting vehicles used by its fighters and their operations throughout Syria. 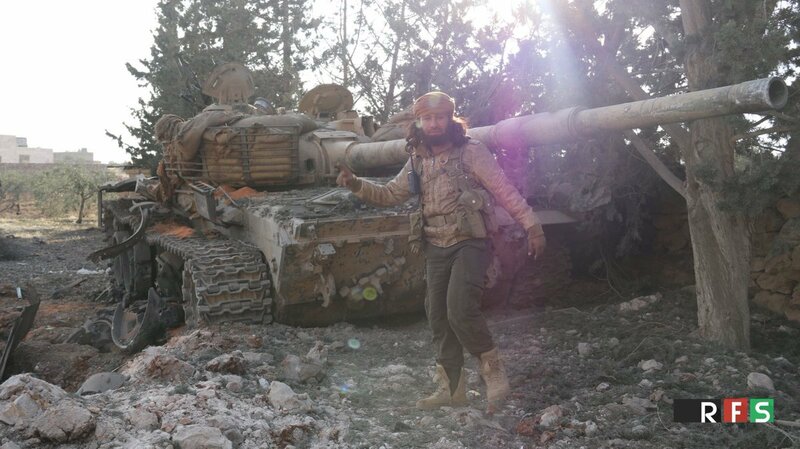 In addition to Abu Hamza al-Khalidi, several other members of the 'Tank Battalion' and technicians of 'The Workshop' could also be identified thanks to their presence on social media. While Twitter had already declared war on designated terrorist groups in 2014, banning the accounts of Islamic State fighters and its supporters, large numbers of Islamic State fighters continue to maintain accounts on various other social media platforms, most notably Facebook. 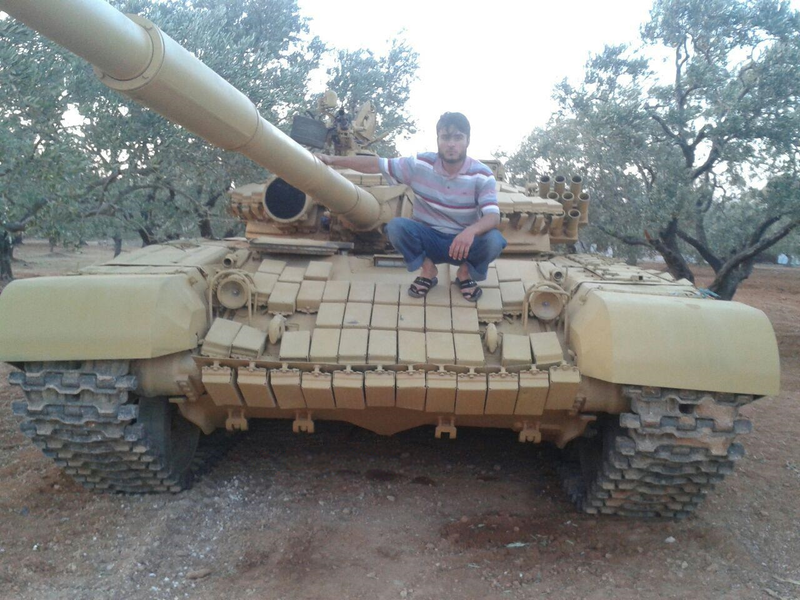 The author made several attempts to get in contact with several of these individuals by posing as a member of a different unit from the 'Tank Battalion' for the gathering of information and photographs of their operations and daily life in Syria, leading to the removal of the account by Facebook on several occasions. Ironically, many of the accounts of the Islamic State fighters in question remain present on Facebook to this day. Although it is extremely likely that foreign fighters played a vital role in running 'The Workshop', their presence here could not be verified. Many of the Islamic State tankers active on Facebook are not only friends with each other, but also with fighters of various other factions fighting for control over Syria. Indeed, most appear to have bonded by their shared passion for armoured fighting vehicles, choosing to ignore whatever religious beliefs and other differences may divide them. 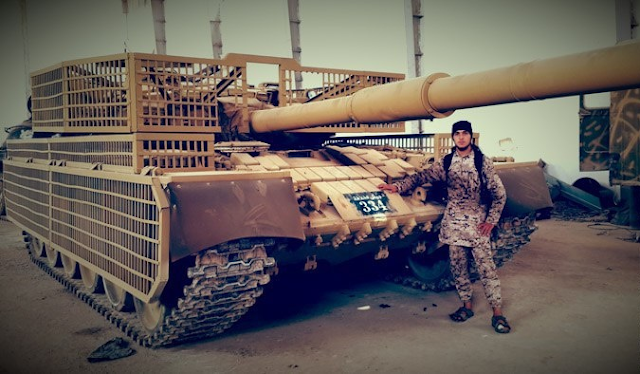 Posing with their tanks, photographing them from different angles and even becoming members of tank enthusiast groups on Facebook, their presence on social media certainly provides for an interesting insight into the life of Islamic State fighters one doesn't get to see often. Back to Abu Hamza al-Khalidi (from here on known as Abu Hamza), whose digital breadcrumbs became of vital importance in researching 'The Workshop'. Although some aspects of his life remain unknown, he is believed to have joined the Islamic State along with Abu Omar when their rebel Liwaa' Dawud brigade defected to the Islamic State on the 8th of July 2014. 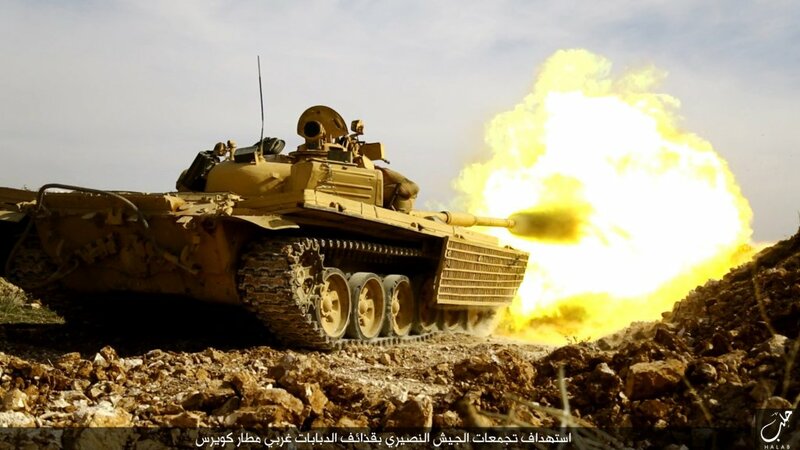 This defection would present the Islamic State with more than a dozen operational armoured fighting vehicles along with their crews, most of which quickly deployed across Northern Aleppo in an attempt to eradicate all other rebel factions in this region. 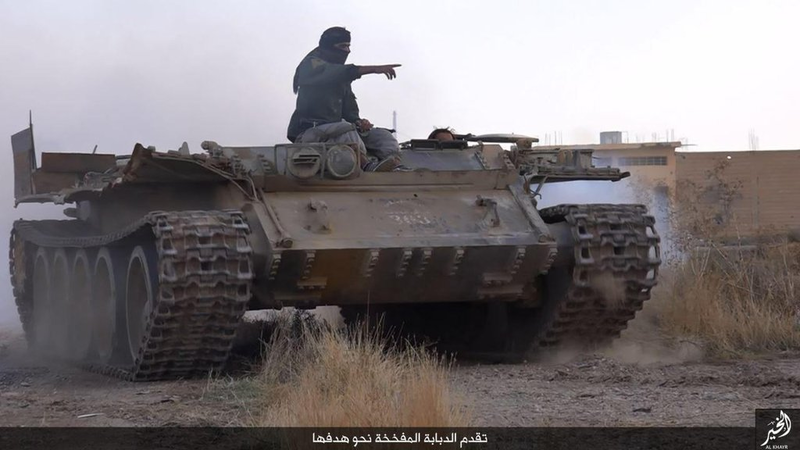 The Islamic State's frequent media releases allowed the tracing of several of these armoured fighting vehicles as the Islamic State captured ever more territory from rebel groups and regime forces in Northern Syria. An example is this T-72 'Ural' of the 'Tank Battalion' deployed to Kweres airbase in a bid to dislodge regime forces defending the airbase. 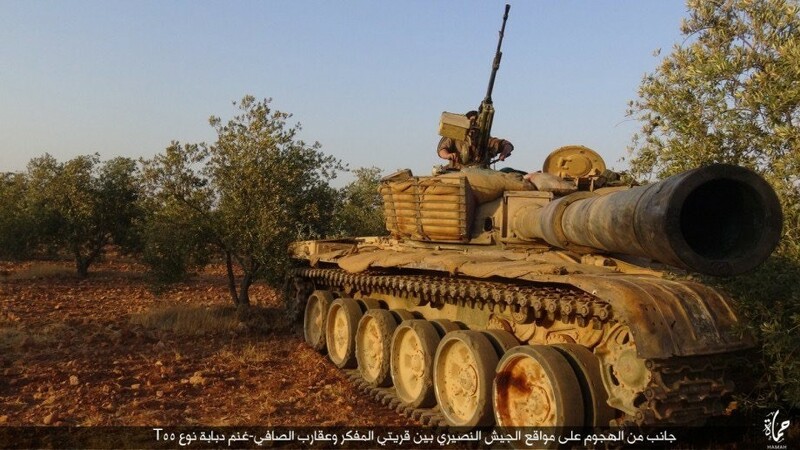 More interestingly, Abu Hamza would also appear in a photo report along with his T-72 'Ural' in the town of Akhtarin, captured by the Islamic State on the 14th of August 2014. Before being photographed in Akhtarin, Abu Hamza is known to have participated in the assault on Brigade 93, where he took several photographs of massacred and dismembered defenders afterwards. 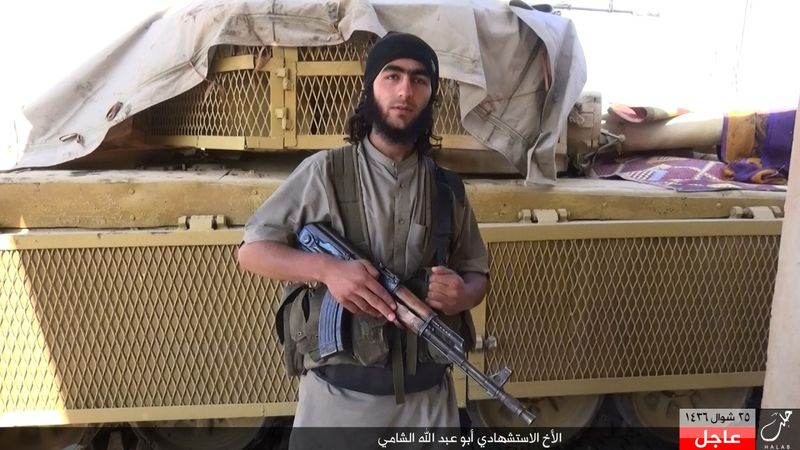 The bodies shown in his photographs could be compared to those seen in official Islamic State images released after the conquer of Brigade 93, and quickly provided a match. His actions on the battlefield in the months that followed remain unknown however, and he would only reappear in May 2015 after the first capture of Tadmur (Palmyra) while inspecting the huge ammunition depots located North of city. While a large number of photographs were dedicated to his interest in military affairs, other images would show Abu Hamza's personal life with his three children, family, friends and other Islamic State fighters, most of whom believed to have been members of the 'Tank Battalion'. Although still at a young age himself, Abu Hamza was already a father of three. When not at the front or 'The Workshop', Abu Hamza spent most of his time in the city of Raqqa, often hanging out with other members of the 'Tank Battalion'. 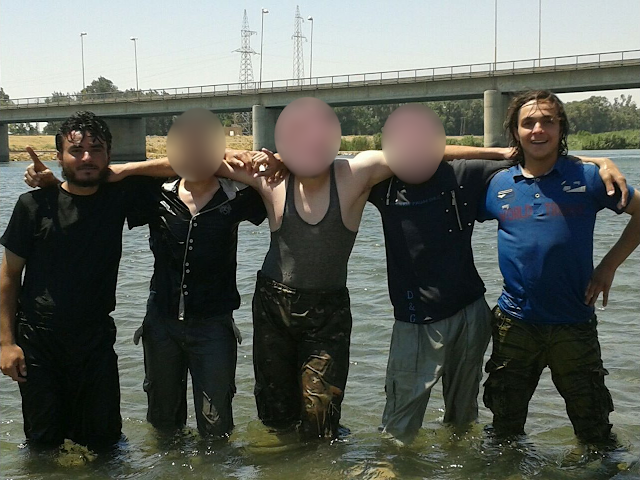 This group of friends would regularly be photographed during their stay in Raqqa, often enjoying time near the Euphrates river or simply enjoying meals in between their time away from the front. The image below was taken near the now destroyed 'New Raqqa Bridge', the exact same location where VICE News filmed a part of their documentary on the Islamic State, which was filmed roughly at the same time. The faces of three individuals are blurred so as not to compromise ongoing research. 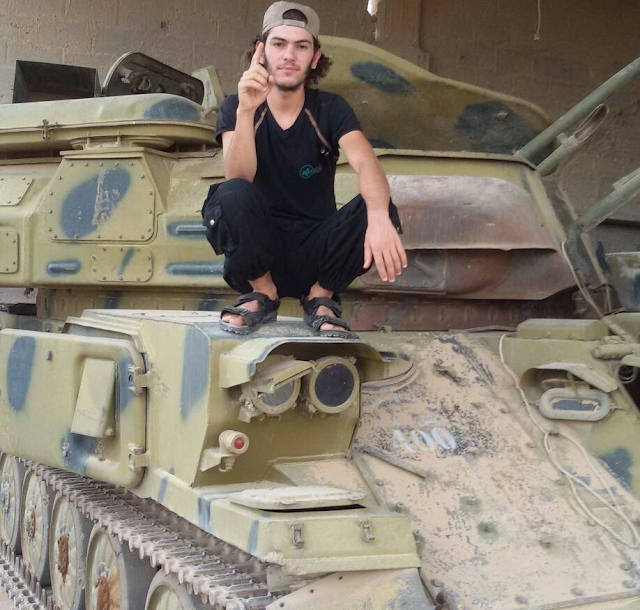 This outright strange contrasting blend of photos of armoured fighting vehicles, decapitated human remains and of precious moments spent with his newborns would continue until Abu Hamza's death on the 10th of August 2015, when he was believed to have been killed along with Abu Omar after fleeing his T-72 'Ural' in a failed attack on Kweres airbase. Unfortunately for the research on this article, most individuals involved with 'The Workshop' have been killed in combat over the past years. 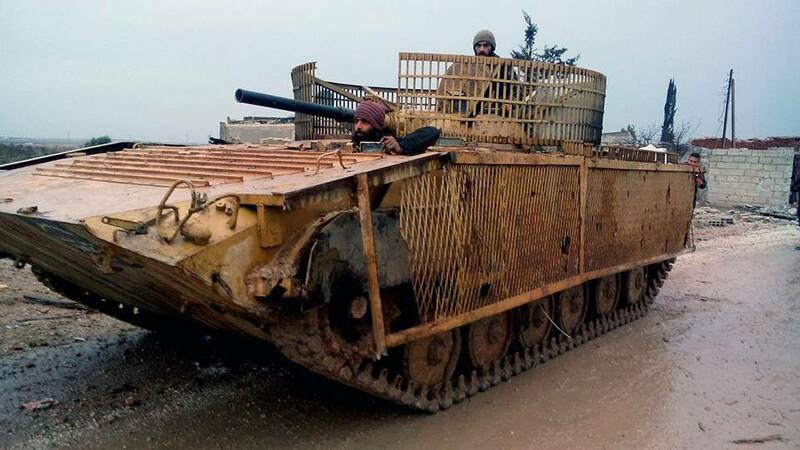 Before going into detail on the actual upgrades performed by 'The Workshop', it is insightful to understand what is currently known about the structure of Islamic State units that used armoured fighting vehicles throughout Syria. 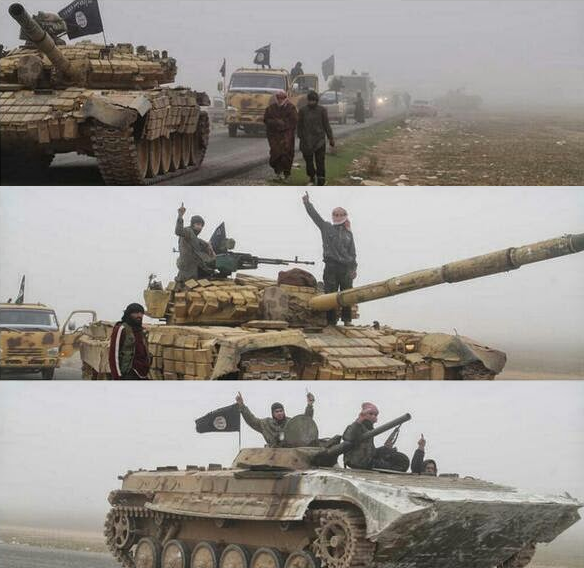 As previously mentioned, many of the Islamic State's tanks were organised into the 'Tank Battalion', which is believed to have been further divided into several units, each with different bases. While it was an independent unit in theory, the 'Tank Battalion' would never go out on its own, with its AFVs instead attached to so-called 'Platoons of Special Tasks' during offensives across Syria. 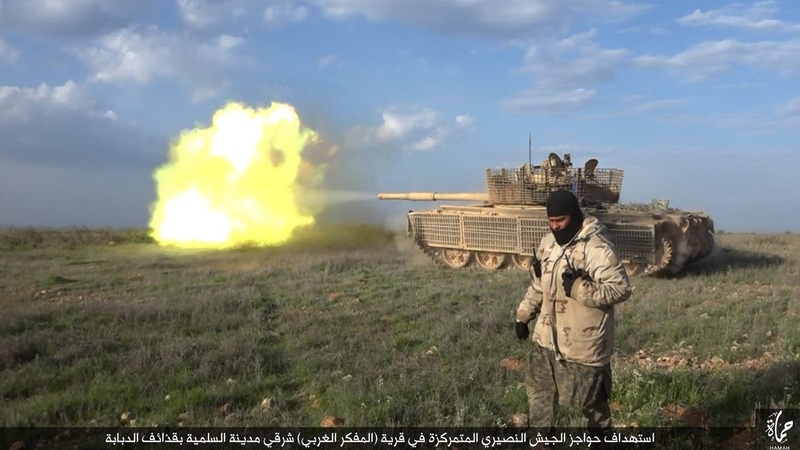 While analysts are still a long way from unravelling the Islamic State's operational structure in Syria and Iraq, it is now commonly accepted that there is a special type of unit tasked with launching offensives across Syria. Sometimes (likely incorrectly) known as 'The Caliphate Army' (Jaish al-Khilafa), these units (known as 'The 'Platoons of Special Tasks' in this article) were the forces responsible for every major Islamic State offensive since 2014, and would make heavy use of armour during its operations. While the foundation for the 'Platoons of Special Tasks' is already believed to have been laid down in early 2014 during the Islamic State's increased presence in Syria, the large influx of foreign fighters in 2014 and 2015 would enable the Islamic State to set up more specialised units to expand the Caliphate across its current boundaries. Instead of directly deploying its new recruits on the frontline, large numbers were held back in Raqqa for enlistment in the 'Platoon of Special Tasks'. 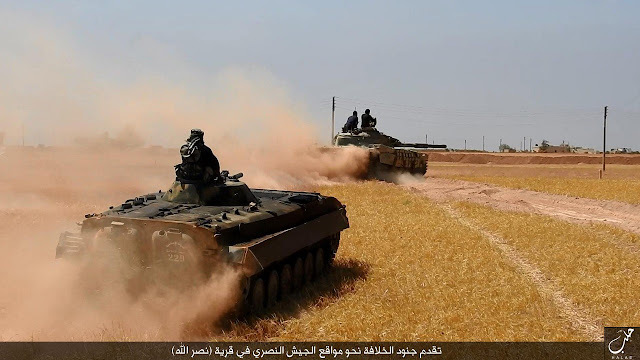 These Platoons are believed to have been more motivated and better trained than regular Islamic State units, likely a result of the fact that a significant portion of its fighters travelled to Syria specifically to join the Islamic State. 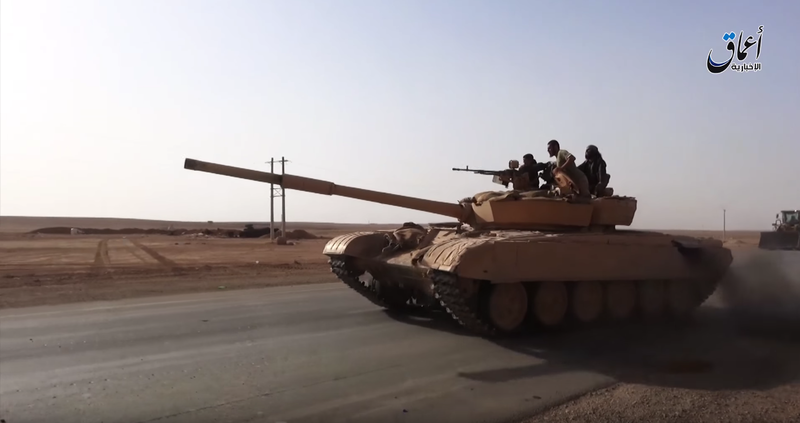 In its normal configuration, a 'Platoon of Special Tasks' would consist of Raqqa-based fighters with several technicals as support, and attachments from the 'Tank Battalion' and artillery units depending on the type of operation. After carrying out their objectives, these units would return to their individual bases awaiting their next mission. This meant that no unit was ever the same, and could consist of several individual components during each operation. 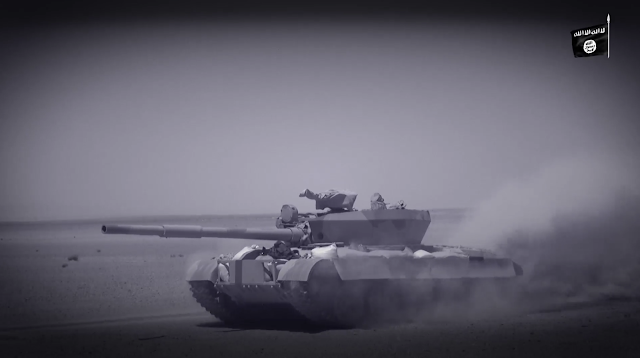 In addition to the 'Tank Battalion', at least three other units are known to operate armoured fighting vehicles in Syria, comprising the فرقة عثمان بن عفان - Othman bin Affan Division, the فرقة أبي عبيدة بن الجراح - Abi Obaida bin al-Jarrah Division and the فرقة الزبير بن العوام - Zubayr ibn al-Awam Division. All three divisions are named after companions of Prophet Muhammad, and served important roles during the times of the Rashidun Caliphate. 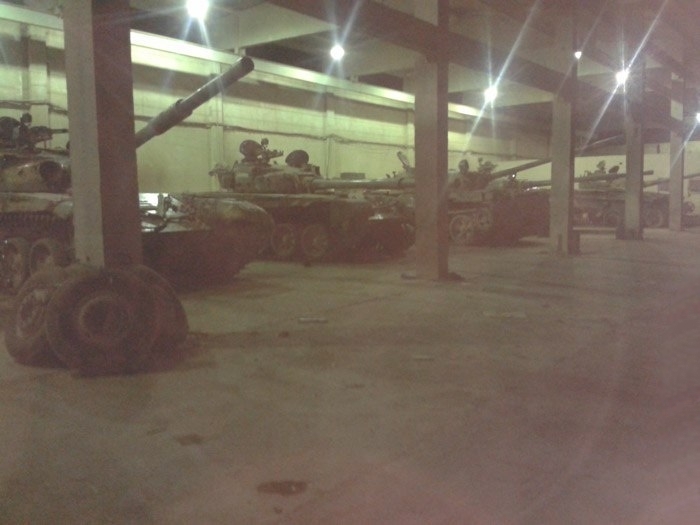 Abu Hamza's unit was initially stationed at 'The Workshop', where its tanks were well hidden in the nearby orchard. However, as the Coalition launched its aerial campaign over Syria and Iraq, the time the tanks spent outside was greatly reduced to minimise chances of detection by aerial assets. This is not believed to have provided any major problem as the many buildings of the facility provided enough shelter for the tanks. The T-72AV 'hidden' in the orchard below is believed to have been one of the tanks that arrived with Liwaa' Dawud and was previously featured in their videos. 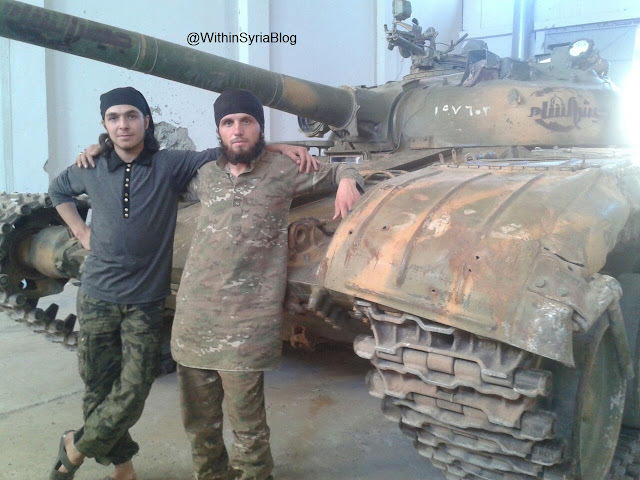 Interestingly, one of the T-72 'Urals' in Abu Hamza's unit donned markings of Jaish al-Sham, which Liwaa' Dawud belonged to before defecting to the Islamic State on the 8th of July 2014. 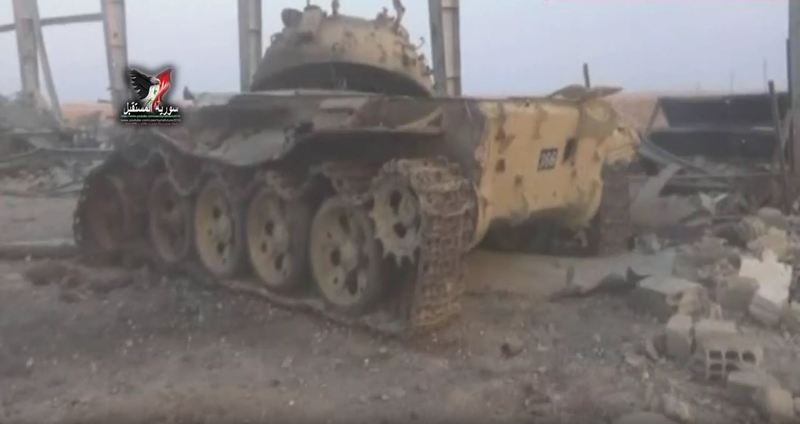 Apparently not worth the effort by its new owners, the markings of Jaish al-Sham were left in place during early operations of the 'Tank Battalion'. Five tanks await their turn for being overhauled and upgraded by 'The Workshop'. 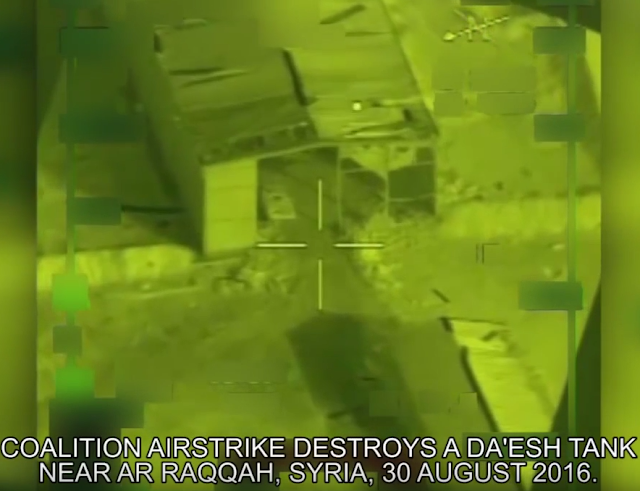 The parking space of the facility provided a somewhat safe hiding place for aerial reconnaissance and was left untouched by Coalition airstrikes over the years. 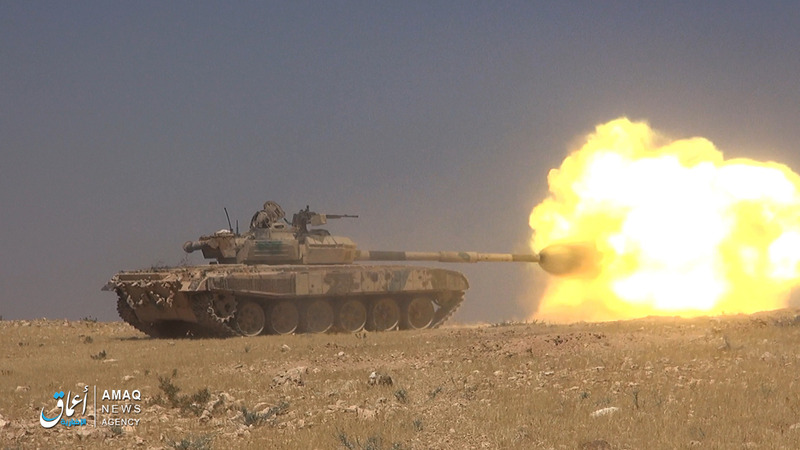 It is however likely that after the commencement of Coalition airstrikes the tanks at the facility were more evenly spread, avoiding the destruction of several AFVs by just one airstrike. The T-72 at the rear appears to have sustained serious combat damage, and would likely end up used as a source of spare parts. Although the largest building of the facility could house several armoured fighting vehicles at the same time, other smaller buildings were also used as workplaces and for storage. The targeting of the largest building on the 30th of August 2016 necessitated moving the whole production line to the smaller buildings, which usually housed just one tank at a time. Some buildings were in fact so small that a larger entrance had to be cut out in order for the tank to drive into the building. In addition to housing 'The Workshop' and a 'Tank Battalion', the Thawrah Industrial Facility and Workers' Housing was also used as an ammunition depot not only for the 'Tank Battalion', but also for the armoured fighting vehicles that were overhauled and upgraded here. After completion of work, these AFVs were loaded with the right ammunition before being sent to their new operators, some of which also believed to have been trained at 'The Workshop'. This further emphasises just how large the scale of the works of 'The Workshop' actually was. A look at some of the tank ammunition present at Thawrah, which includes nearly every type of shell present in Syria. 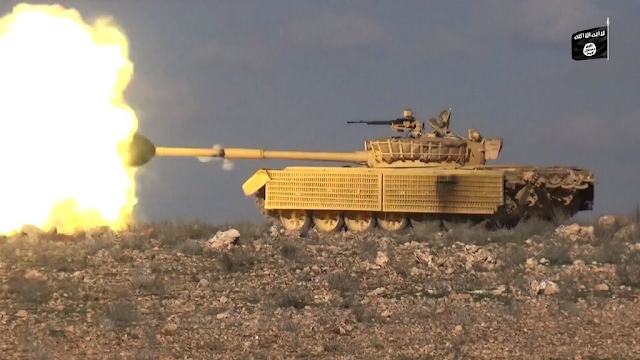 Of interest is the 3UBK10M-1 tank gun round with the associated 9M117M guided missile, together with the guidance device aboard the T-55AM(V) tank known as 9K116-1 Bastion. Only rarely used during the Syrian Civil War, this round was misidentied as an illuminating round by the Islamic State. 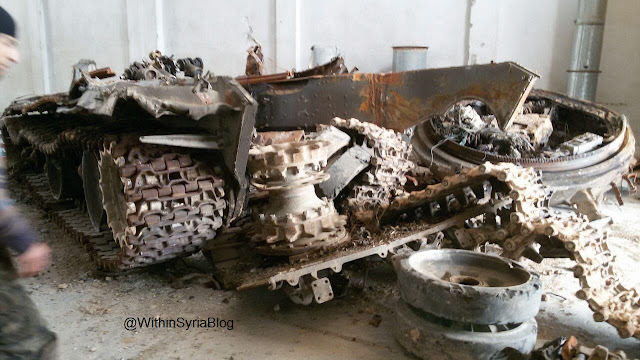 The remains of a battle-damaged T-72AV taken to 'The Workshop' and subsequently completely wrecked for spare parts. As many of these armoured fighting vehicles could be cannibalised for various spare parts, sights or even the cannon for installation on other tanks, transporting damaged or sometimes destroyed tanks became common practise for 'The Workshop'. This also explains the aforementioned presence of the two T-72 turrets filmed by the Islamic State as it recaptured the facility in June 2016. In addition to recycling internal components of AFVs, tanks such as the T-72AV and T-55(A)MV come equipped with explosive reactive armour, intact bricks of which could subsequently be placed on other tanks. 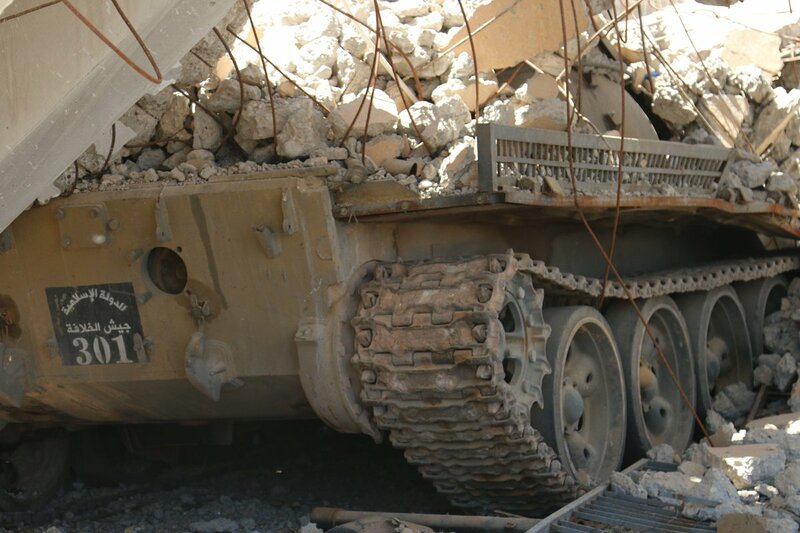 An example of this is the regime-operated T-55(A)MV below, orginally destroyed during the 'To Raqqa' offensive in June 2016 and subsequently taken to 'The Workshop', where it resurfaced after regime forces captured the facility in June 2017. 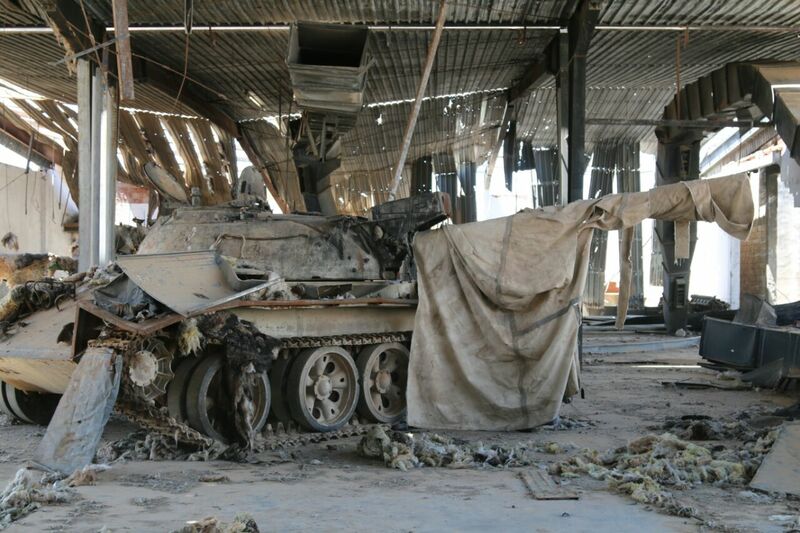 The tank has been completely stripped of its explosive reactive armour but otherwise has been left untouched. Another example of recycling is this T-62 Model 1972, which had been destroyed near the Thawrah Industrial Facility by the Free Syrian Army back in 2013. 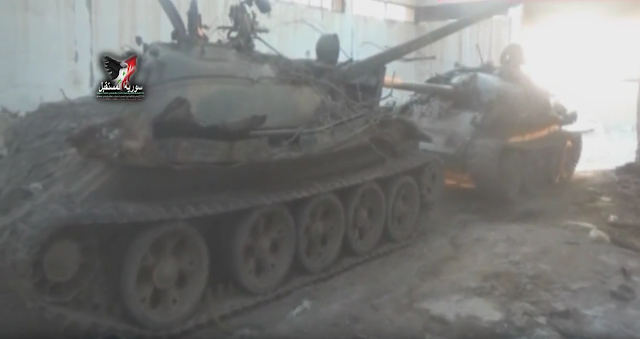 This tank would be sighted again during the first capture of the facility by regime forces in June 2016 and encountered for a second time during the second capture of 'The Workshop'. Both sightings revealed the absence of its lamps, infrared searchlight and the TSh-2B-41 gunner sight. The transportation of Islamic State tanks throughout Syria and Iraq always occurred via heavy-duty trucks, one of which ('603') can be seen below with a T-72 'Ural' on its trailer captured after a succesful raid in Wilayat Hama. 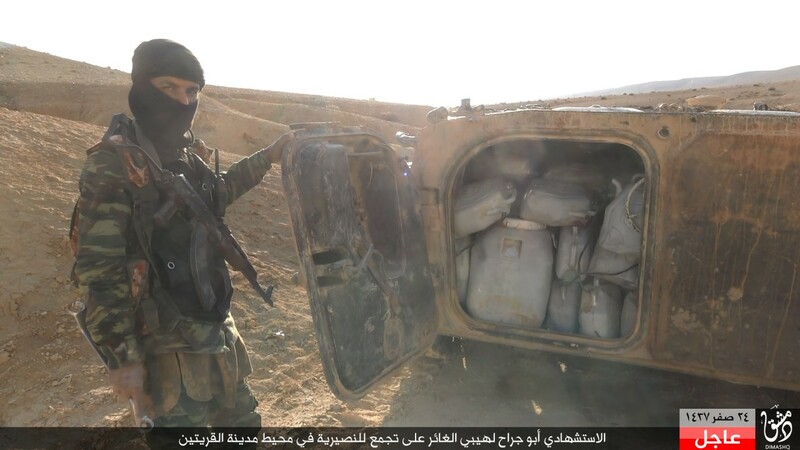 As regime forces are notorious for leaving equipment, vehicles or sometimes even complete warehouses full of ammunition behind, the Islamic State made frequent use of heavy-duty transports to haul ghaneema (spoils of war) back to its heartland. 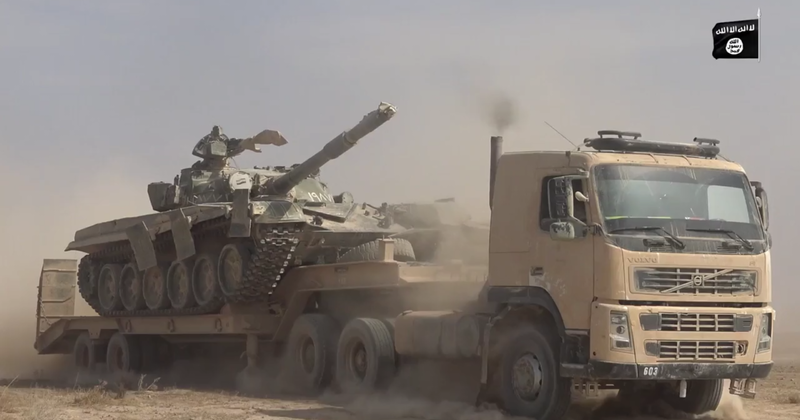 These trucks, being largely indistinguishable from civilian trucks apart from their deadly load, have rarely been targeted, the example below which carried a T-62 model being an exception. 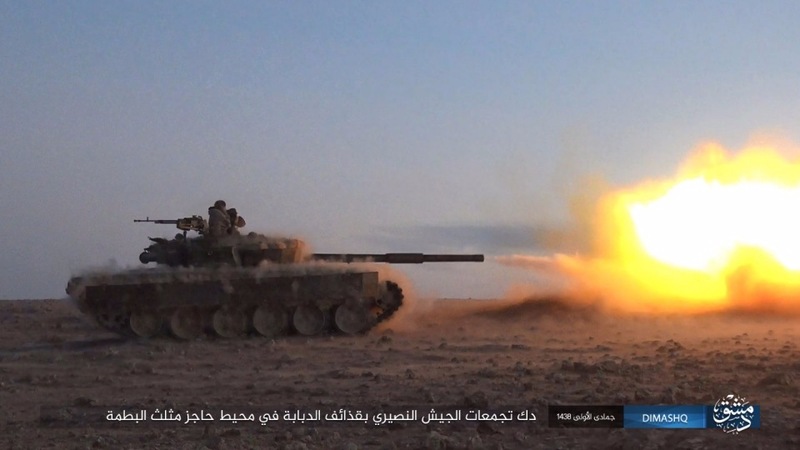 This is also the reason the USAF frequently targets weaponry captured by the Islamic State: to prevent its fighters from having a chance to move the 'ghaneema' away from the frontline, which in Tadmur also included seven tanks taken over by the Islamic State and subsequently stored in the airbase's Hardened Aircraft Shelters. Inaction by the SyAAF and Russian Air Force would have resulted in them swiftly being hauled off on heavy-duty trucks, a crucial mistake which lays bare some of the glaring shortcomings that plague these air forces in the Syrian Civil War. Ultimately, they would have made their way to 'The Workshop' for overhauling, upgrading and further distribution elsewhere in Syria. Prior to delivery to its operators, armoured fighting vehicles overhauled and/or upgraded by 'The Workshop' would receive markings indicating the vehicle had been overhauled by this facility. These markings usually consisted of black squares (up to three of which applied on a vehicle) reading: الدولة الإسلامية - 'Islamic State', جيش الخلافة - 'The Caliphate Army' (Jaish al-Khilafa), followed by a unique serial number. This marking can be seen in the image below. 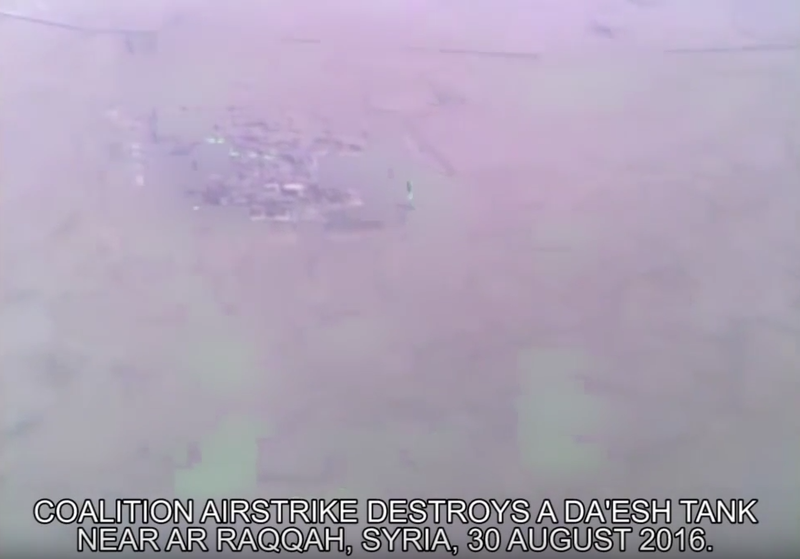 Several variations of these markings have been noted over the past several years, replacing Islamic State's previous short-lived 9xx designation system. The Othman bin Affan Division and the Abi Obaida bin al-Jarrah Division are known to use their own designation system, '101', '701' and '506' have been noted so far. These markings initially led to some to conclude that the black square was exclusive to 'The Caliphate Army', a so-called Islamic State elite unit mostly consisting of battle-hardened foreign fighters (known as 'The Platoon of Special Tasks' in this article). 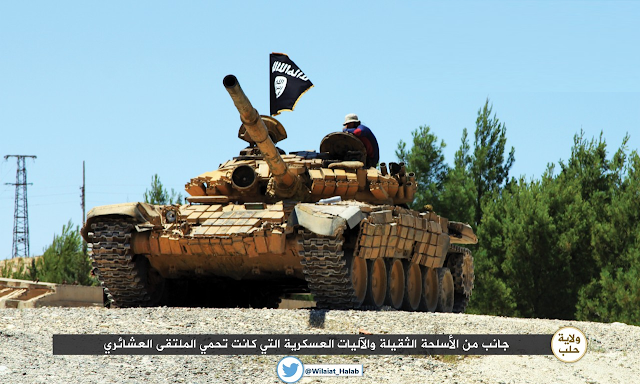 Although the Islamic State does apply unit markings on some its vehicles mostly in Iraq but also in Syria, it is extremely likely that the black square represented nothing more than a plaquette indicating this tank had been overhauled by 'The Workshop'. 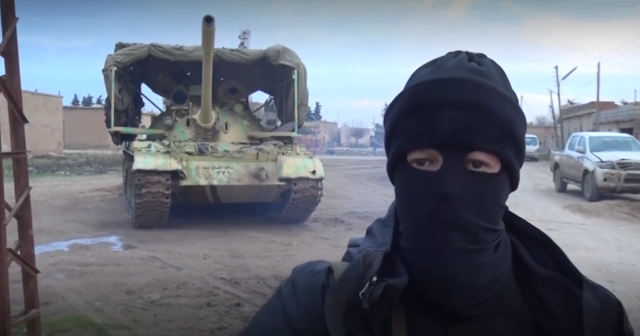 'The Caliphate Army' in turn likely refers to the whole of the Islamic State's military structure. More interestingly, the markings would allow counting and tracking the armoured fighting vehicles upgraded by the 'The Workshop'. Below is a list of known serials applied to various types of armoured fighting vehicles. Notable is the presence of only three T-72s in this list, most of which never received the black square for reasons that remain as of yet unknown. While the numbering system looks pretty straightforward, with each vehicle category receiving its own first digit, its application was complicated by several factors. Foremost, no distinction between AFV and VBIED was made, meaning that a vehicle type's serial number is exclusive to the chassis of the vehicle. 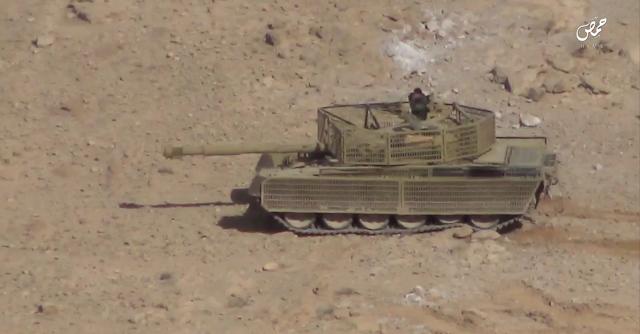 That is until the first sighting of Toyota Land Cruisers with a BMP-1 turret, which also received 2xx serials of the BMP-1. It also remains unknown if overhauled and upgraded AFVs without the black square were given their own serial number or were not included in the designation system. Although initially applied on most vehicles overhauled by 'The Workshop', these markings sometimes became invisible after the fitting of additional armour and appears to have been completely abandoned on later iterations of upgrades of main battle tanks. Other vehicles continued to wear the black square throughout their career in Syria, sometimes worn out and barely visible as on the ZSU-23 below. In an attempt to elucidate the armour upgrades performed by 'The Workshop', this article will cover the main upgrade programmes along with interesting varations of these, which makes for an extremely long list of armoured fighting vehicles. In addition to the vehicles covered in this article, many more variations of each upgrade programme have existed over the past several years. Indeed, while some of the upgrade programmes were standardised, no vehicle upgraded by 'The Workshop' was ever exactly the same. A perfect example of this is T-72 'Ural' '311', which was overhauled and upgraded by 'The Workshop' no less than three times during its career. This tank was the personal mount of Abu Hamza, which would regularly photograph and be photographed with the tank both at 'The Workshop' and in the field. The image below shows the tank during its second overhaul, with additional armour and supports for the multi-spectral camouflage already having been installed. Below is '311' again in the final stages of its second upgrade: the tank has been repainted and received additional armour protection and linings for the addition of camouflage on the front and rear of the tank. The black squares are not yet present in the first image, but already have been applied in the second and third pictures. 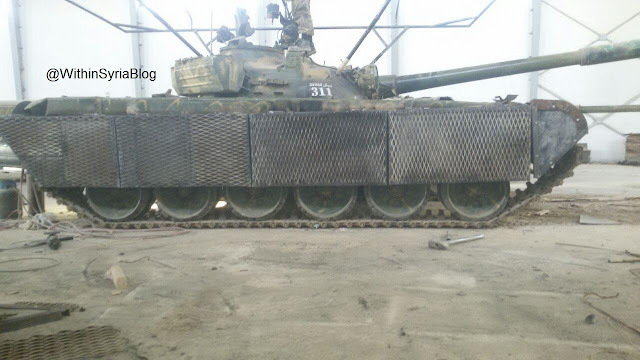 A T-55A and a T-72AV are also in the process of upgrading in the largest building of 'The Workshop'. The Czechoslovak Praga V3S truck on the right is believed to have acted as a tool workshop. The armour arrangement on this tank is typical of earlier upgrade programmes by 'The Workshop', featuring slat armour on either side of the tank and around the turret, with the former having been applied directly over armour plates with only little spacing in between. The armour plates can easily be replaced after having sustained combat damage, which would be a feature of several upgraded tanks. Additional features include a layer of rubber just above the side skirts of the tank and three Kontakt-1 ERA blocks scavenged from a T-72AV protecting the gun manlet. Also of interest is the placement of slat armour above the rear part of the tracks, which serves little to no purpose protecting the tank but is a nice touch nonetheless. Despite having received a boost in its armour protection, the armour arrangement of this tank is less than ideal and difficult to produce and install due to the unique parts it is comprised of. Unsurprisingly, this armour arrangement would later be replaced by a more conventional layout. T-72 '311' is however a tribute to the craftsmanship of 'The Workshop', carefully overhauled with an almost redundant attention to detail. The same tank after the addition of multi-spectral camouflage on the turret, which is not yet present on the front and sides of the tank. The presence of the thick cords around the turret seriously complicates the use of the tank's optics, the view of which is now seriously diminished. 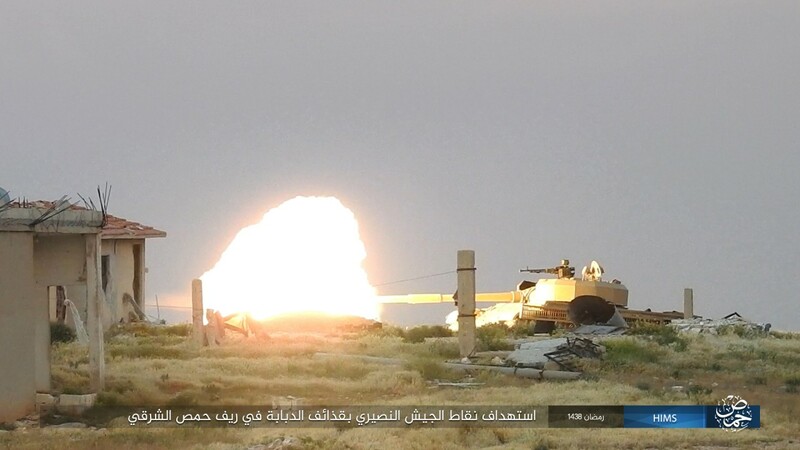 Although this reduces the T-72 'Ural's' already abysmal accuracy even further, it is unlikely that this posed a major issue to the Islamic State, which would operate many of its up-armoured T-72 'Ural's' with a part of their optics blocked by additional armour. Although '311' is likely to have seen combat after its second overhaul, little is known on its operations throughout late 2014 and early-to-mid 2015. 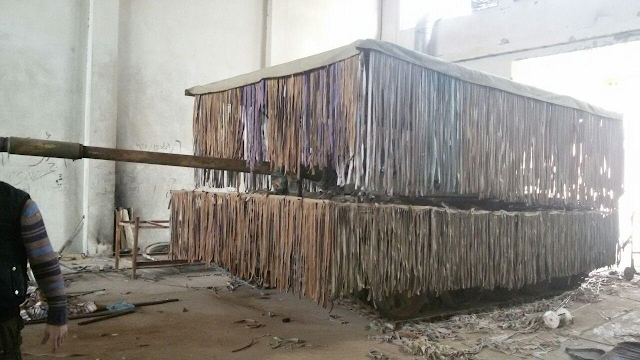 The installing of multi-spectral camouflage hints at possible deployments to areas with heavy activity of coalition aircraft, but despite frequent postings of propaganda videos depicting Islamic State units on the offensive here, this tank was never featured in any of them. 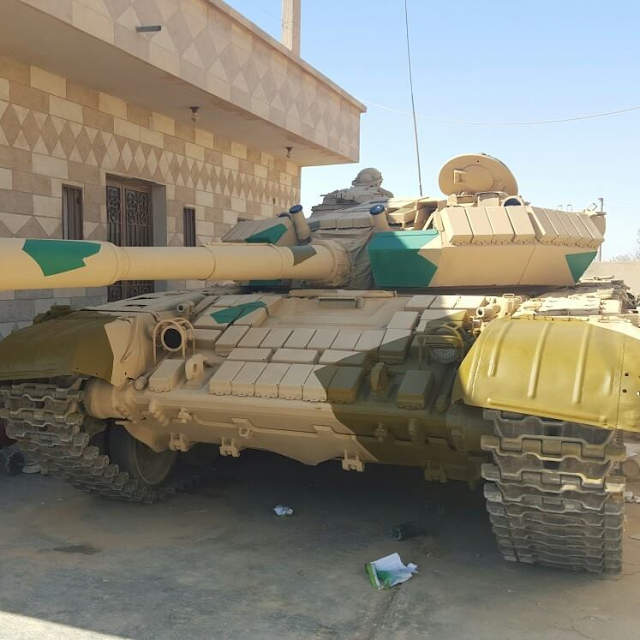 Despite its apparent absence in Islamic State media releases, T-72 '311' would be upgraded for the third time by 'The Workshop' during mid-2015. This upgrade included several changes to the tank's armour arrangement, most notably the replacement of the armour panels on either side of the tank by two larger panels, each consisting of slat armour and a layer of what is presumed to be rubber, while the slat armour installed around the turret was heightened to provide better protection to this part of the tank. 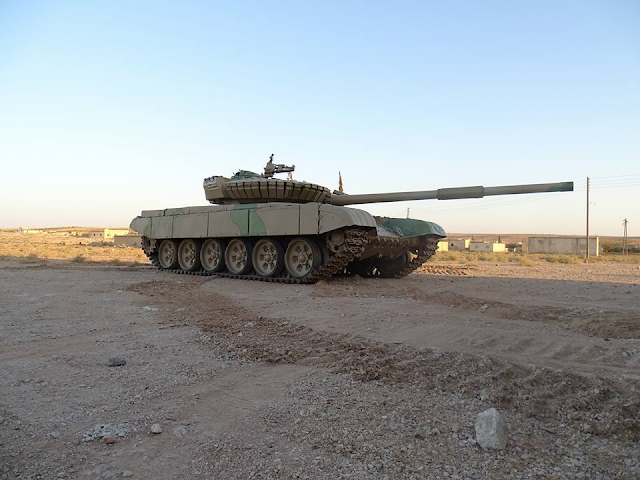 Shortly after what would later prove to be the tank's last visit to 'The Workshop', '311' was deployed to Kweres in early August 2015 in preparation for the largest offensive that would be launched at the airbase since it was besieged in December 2012. 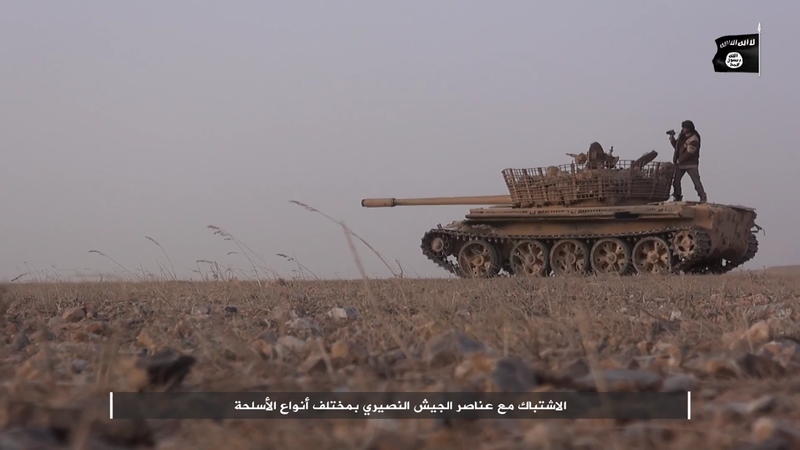 The 'Tank Battalion' had already engaged the defenders of Kweres on several occasions, which successfully fought off several attacks launched by various rebel factions and the Islamic State since 2012. While the rebels proved incapable of seriously contesting the airbase, renewed efforts made by the Islamic State were meant to end Kweres' resilience once and for all. Having successfully fought off several large attacks while under siege for just under three years at that time, the garrison defending Kweres was not going to give up without a fight however. Despite lacking any armour or artillery support and under heavy bombardment by the Islamic State, the defences of the airbase were optimised against any intruder that dared to cross the large swaths of open land separating Kweres airbase from Islamic State-held territory. While going into detail on the defensive positions of Kweres is beyond the scope of this article, their strength mainly comes down to successful use of the airbase's Hardened Aircraft Shelters (HAS), many of which were turned into true fortresses. Trying to capture one would prove to be an extremely arduous task, and the fact that the Islamic State never managed to advance beyond the HAS' is a testimony to their strength. Unfortunately for the Islamic State, these HAS' had to be overcome in order to capture the airbase. As the flat terrain surrounding the airbase would quickly see waves of Islamic State fighter being mowed down by the defenders, the 'Platoons of Special Tasks' made heavy use of armour to safely transport the infantry during the storming of the HAS'. A total of two mechanized assaults would be carried out during the August 2015 offensive, each remarkably similar in execution and outcome. 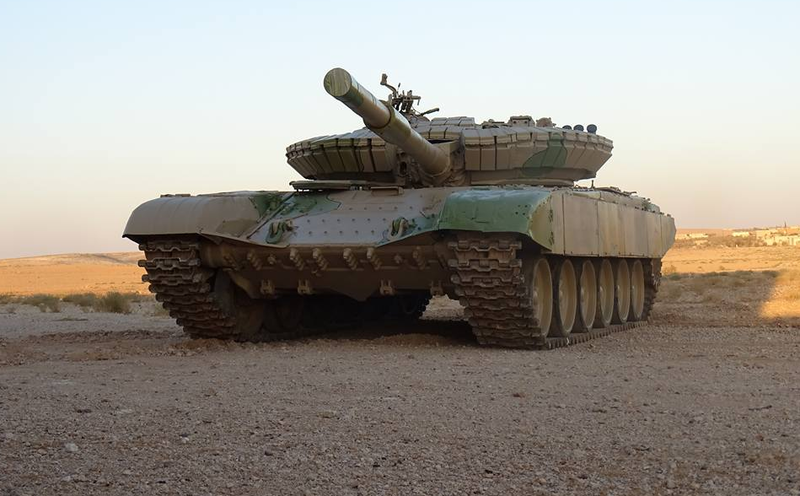 The first assault would occur on the 10th of August 2015, involving Abu Hamza's T-72 '311' and BMP-1 '208', whose objective was to advance to Kweres' Eastern-most HAS to drop off the fighters that would later storm the heavily fortified position. 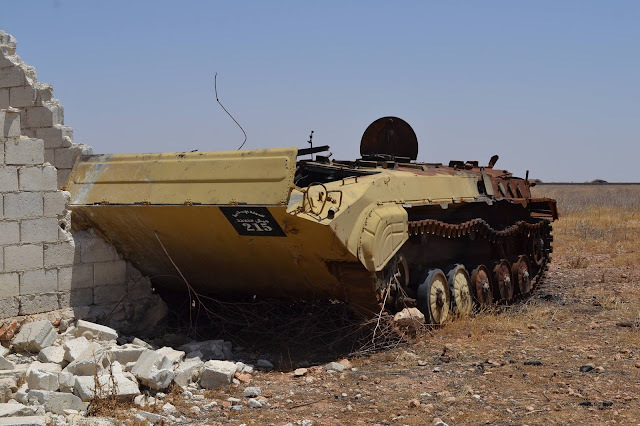 If this attack would have had any chance of succeeding, the defenders of the HAS' hiding in trenches would have had to be suppressed to allow the Islamic State fighters dismounting the BMP-1 to safely reach cover, from where they could make their way closer to the HAS. It is at this exact moment that the inexperience of the crew operating in such an environment came to light, which would have drastic consequences for the attackers. 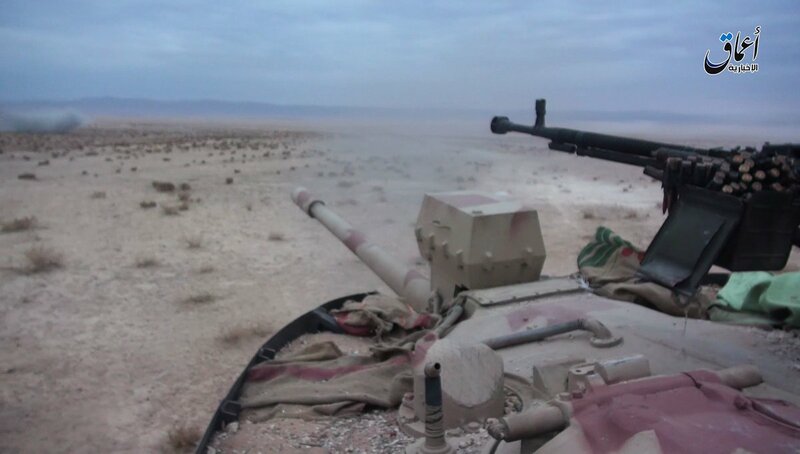 Instead of positioning itself behind the BMP-1 that would allow for a wide field of view and the necessary gun elevation to suppress the defenders of the HAS, Abu Hamza's T-72 overtook the BMP-1 and positioned itself behind a berm from where it lacked the gun elevation to hit the defenders of the HAS', and the field of view to fire on other positions which were now blocked by the berm. 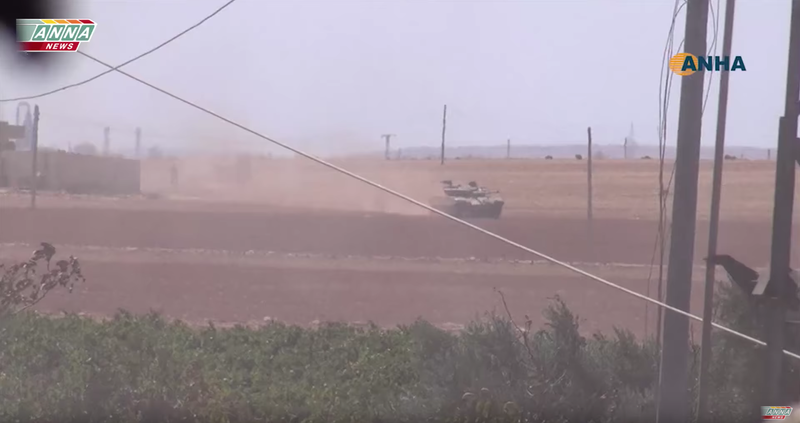 Without any covering fire from Abu Hamza's T-72, the Islamic State fighters dismounting the BMP-1 were quickly mowed down as they ran for cover towards the berm. The BMP-1 carrying the fighters was subsequently also hit, with a single shot hitting the slat armour on the right side of the vehicle but likely not penetrating the hull armour. The fate of the crew is likely to have been the same as the fighters storming the HAS: shot after they exited the vehicle. 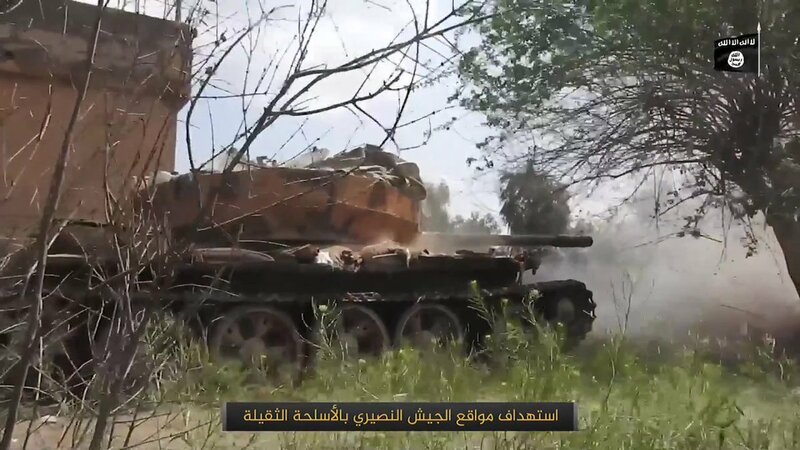 While it remains unknown if Abu Hamza's T-72 was also hit by the defenders, it appears he and his crew abandoned the tank in an attempt to escape the carnage unfolding around them. With nowhere to run to for safety, Abu Hamza was an easy target and was killed as well. Although failing in his objective to capture Kweres' Eastern-most HAS, his death would provide a wealth of knowledge and images after government soldiers managed to get access to his phone and shared the many images on it with journalists, leading to their exposure on the internet. 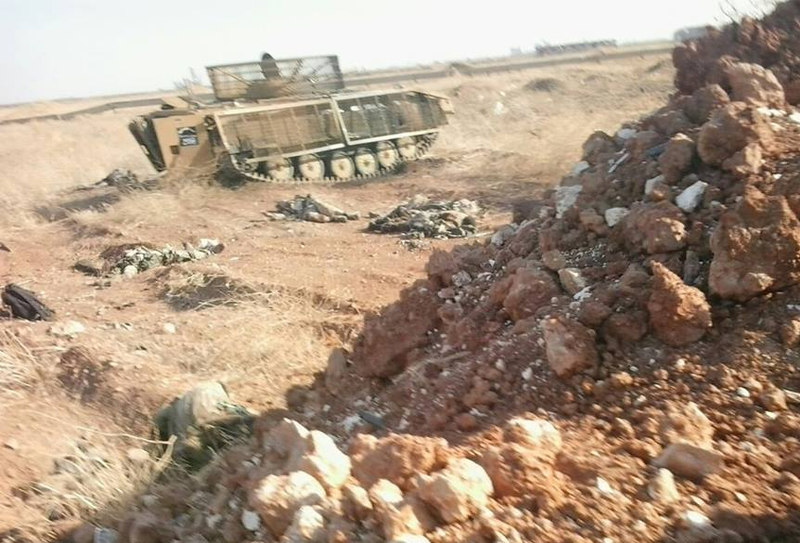 The image below clearly reveals the massacre that took place during the assault, with several bodies littered around the abandoned BMP-1. The penetration hole on the BMP-1 is clearly visible, which must have either disabled the vehicle or caused the crew to panick and flee. Also of interest is the additional layer of armour on the rear doors of the vehicle, which also happen to act as the BMP-1's fuel tanks. 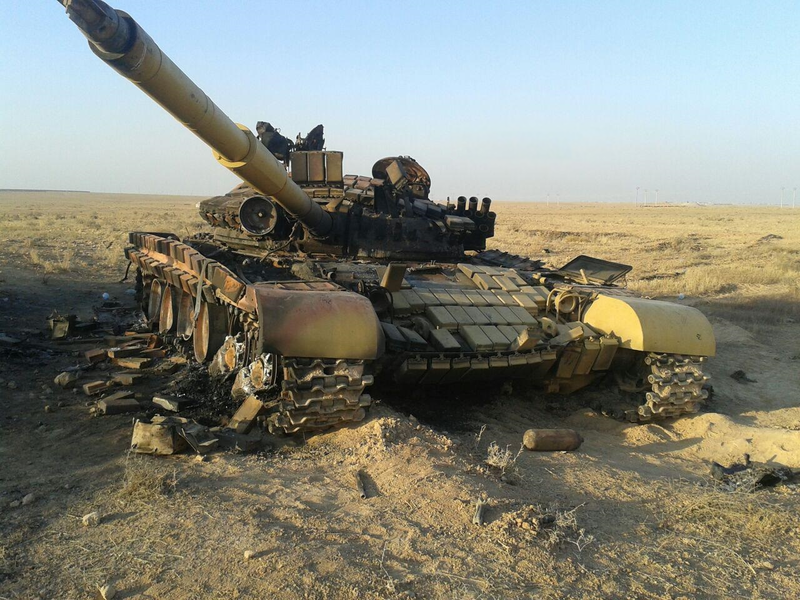 Despite the fact that T-72 '311' was captured intact, photographs taken at a later date would show the tank completely burnt-out. Several bodies were also moved around the scene, and can be compared with the images above taken shortly after the attack. While the reasons for this remain unknown, it might have something to do with the fact that several journalists would visit the airbase in the months that followed, and this rearranged scene might have made for a more dramatic picture. 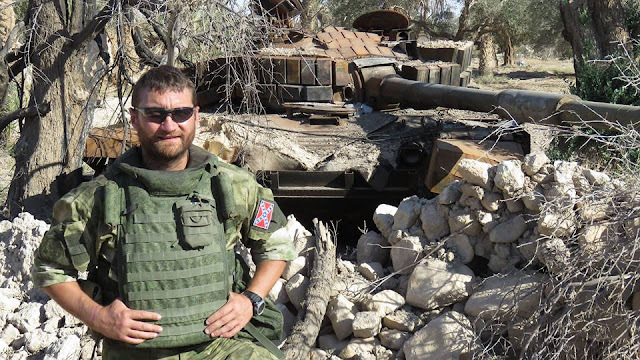 Alternatively, the site might have been used for target practice, possibly explaining the T-72's state. While the BMP-1 was removed from the scene at a later date, the T-72 remains present here to this day. 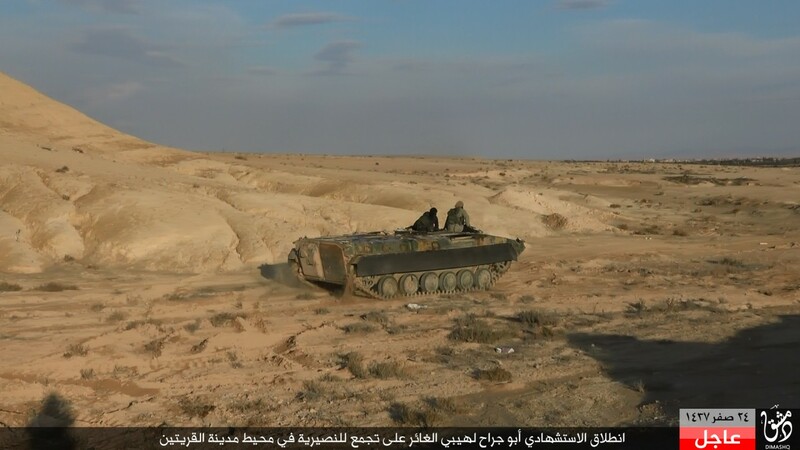 This complete failure apparently did not deter the Islamic State from carrying out their second mechanised assault however, this time involving T-55 '319' and BMP-1 '206'. 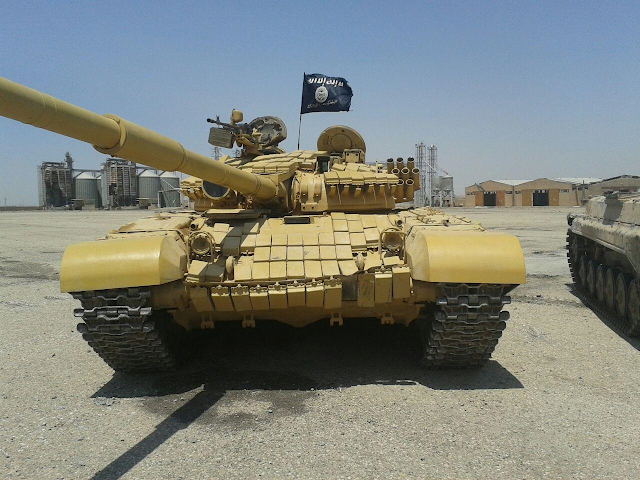 T-55 '319' is perhaps one of the most iconic tanks to have served with the Islamic State: while the tank has no special external features that distinguish it from other T-55s, it featured and (occasionally still does) in articles covering the Islamic State due to its role in the parade celebrating the proclamation of the caliphate on the 30th of June 2014 in Raqqa. 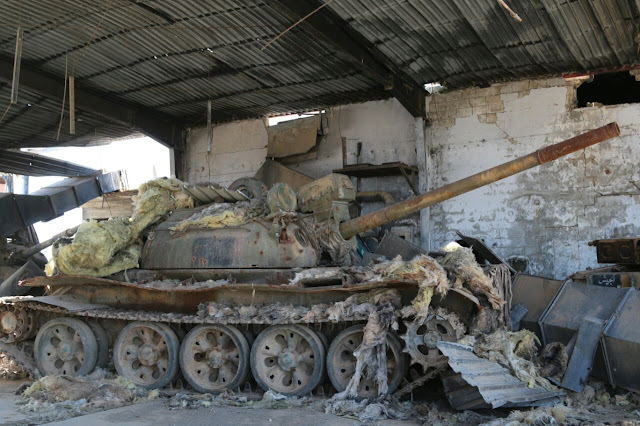 This badly battered T-55A is one of the many Syrian T-55s to have been upgraded with a North Korean laser rangefinder (LRF) and wind-sensor during the late seventies and early eighties. This large upgrade programme saw hundreds of T-55A receive a North Korean designed LRF, wind-sensors and 14.5mm KPV heavy-machine guns. It is unlikely however that many factions operating these North Korean upgraded examples in the Syrian Civil War make use of these laser rangefinders, which would require training or past experience with the system to operate. Before being deployed to Kweres airbase, this tank underwent significant modifications at 'The Workshop' in anticipation of its deployment to the battlefield. Most notable is its highly impressive array of slat armour which covers a significant part of the tank, including its sides and a significantly spaced area surrounding the turret. In order to preserve the tank's mobility, the slat armour on the sides is spaced very closely to the rubber behind them, in part negating their effectiveness. Additionally, and as is the case on many tanks similarly upgraded by 'The Workshop' the slat armour is likely to seriously impede the tank's situational awareness by obstructing its optics, a sacrifice the Islamic State appears to be more than willing to make. The only compromise in the slat armour was to enable the use of the coaxial 7.62mm PKT, for which a small cutout was made. Also of interest is the large container at the rear of the tank, likely used for storing equipment and to hold additional DIY armour which could come in handy considering the T-55's vulnerable rear. Apparently taking no lessons from the failed attack involving Abu Hamza's T-72, this T-55 would participate in the second attack that would unfold itself in roughly the same way as the first. 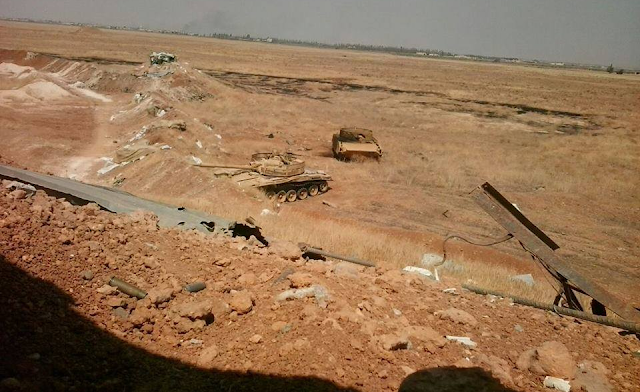 Instead of positioning itself in a behind the BMP-1 from where it could support the dismounted infantry, the T-55 literally ploughed itself into the berm, which was clearly up to the task of preventing any enemy vehicles from passing this obstacle. Having little space to manoeuvre after this catastrophic mistake, the T-55 appeared to have subsequently been hit but not penetrated. 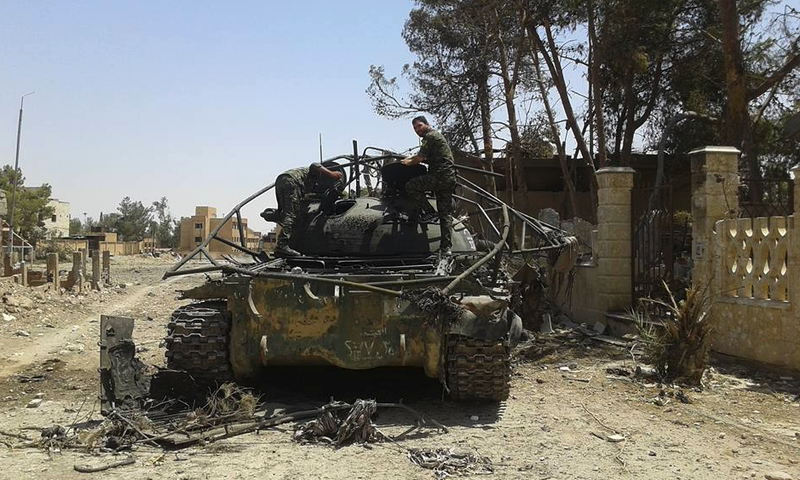 The crew of the BMP-1 is believed to have abandoned their still functioning vehicle immediately thereafter. The 100mm D-10T cannon of the T-55 was penetrated by what is likely to have been an RPG, achieving a mission kill on the tank after which it appears to have been abandoned. The fact that the tank was otherwise still operational is proven by the fact that it appears to have moved and turned its turret on its own multiple times afterwards, with the damage to its main gun solely responsible for taking the entire vehicle out of combat. 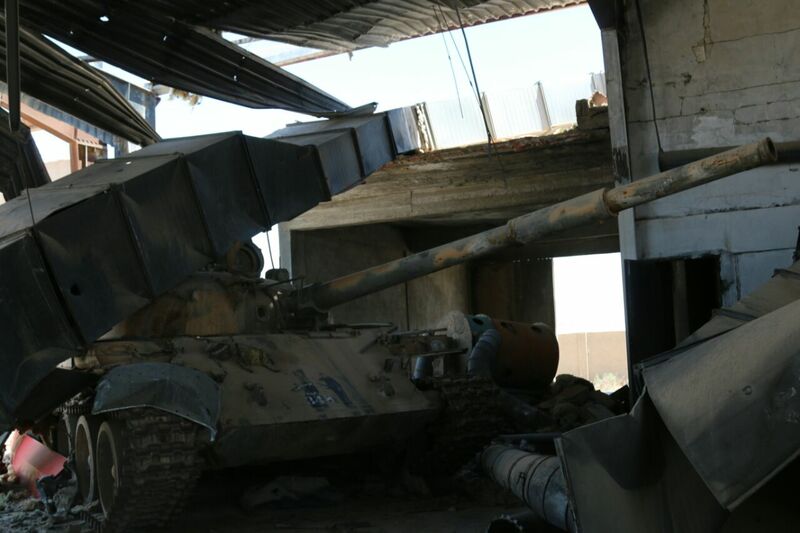 Both the T-55A and BMP-1 would later be moved inside the perimeter of the airbase, allowing for closer inspection of both vehicles. The slat armour on the T-55's turret had already partially come off at this point, likely caused by regime forces themselves. 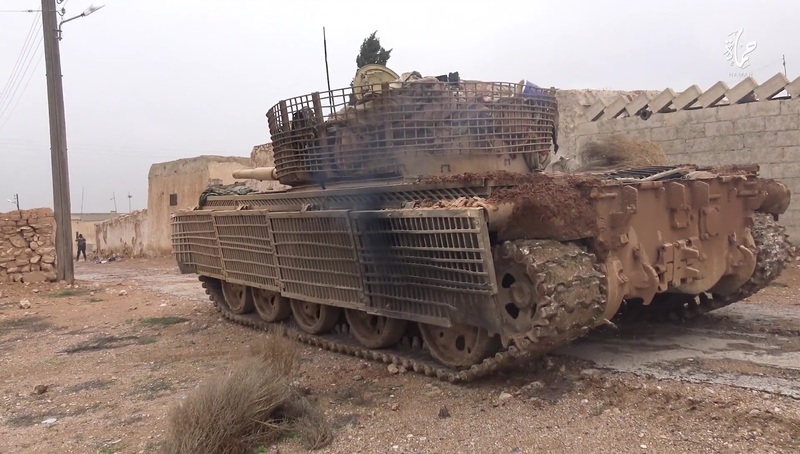 Although BMP-1 '206' comes equipped with the attachments for additional armour on the rear doors of the vehicle, the armour was not present during the attack. While the offensive aimed at capturing Kweres would continue for several more days, slowly winding down throughout the end of August, the Islamic State's goal of capturing Kweres had to be given up for the time being, and would later be completely abandoned after regime forces launched their own offensive with the aim of ending the siege of Kweres airbase. 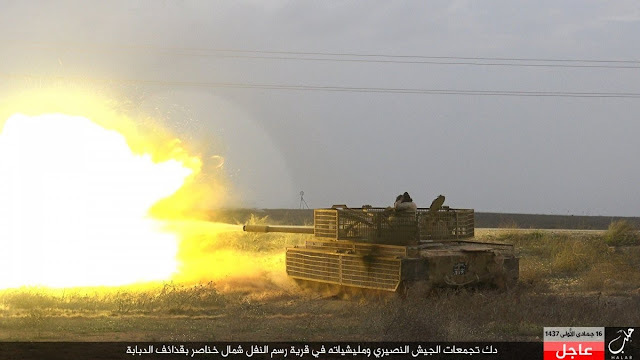 Now suddenly on the defence, these engagements were to see the involvement of many more upgraded Islamic State tanks. The heavy fighting around the perimeter of Kweres airbase resulted in the loss of several upgraded BMP-1s, two of which ('206' and '208') would later enter service with government forces. Ironically, the defenders of the airbase previously lacked any kind of armour, and the abandoned BMP-1s on the defenders' doorstep must surely have been a welcome addition to their arsenal. 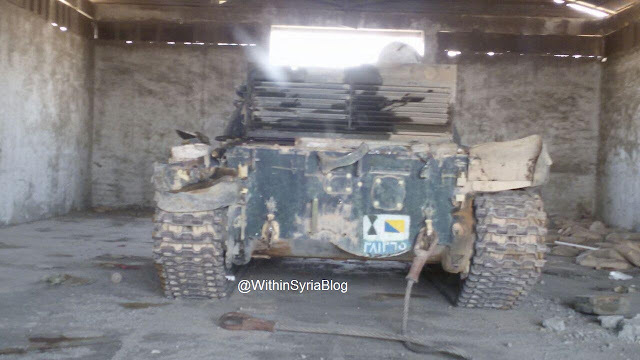 While the slat-armoured T-55 was seemingly also captured intact, the damage it received to its cannon prevented further use by regime forces. While this disastrous attempt at capturing Kweres saw the loss of several upgraded armoured fighting vehicles with ultimately absolutely no gains (and even adverse ones) made, 'The Workshop' would continue to upgrade several armoured fighting vehicles along the same lines as the examples lost at Kweres. Arguably the most impressive looking of all was T-72AV '334', which received slat armour in addition to the explosive reactive armour already present on the turret and front of the tank. As the presence of the ERA left no place for the markings of 'The Workshop', a steel plate was attached to the front of the tank displaying جيش الخلافة - 'The Caliphate Army' followed by its serial number. This practise was abandoned later all together, likely because it was seen as a waste of time. 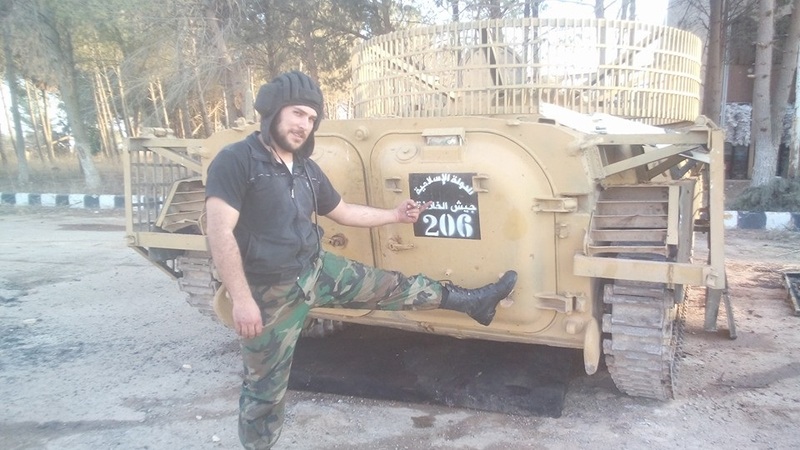 Incidentally, it appears that '334' was the source of the explosive reactive armour found on the gun manlet of Abu Hamza's T-72 '311', which clearly did not save him in combat. 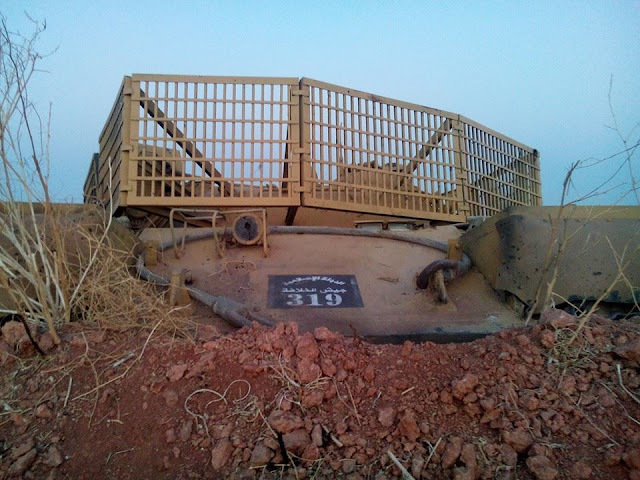 The eventual fate and area of operations of this tank remains unknown. A significant number of vehicles would eventually receive this type of slat armour, the manufacturing process of which clearly became standardised with several sub-variants. Although the effectiveness of this armour arrangement will likely remain unknown, it is likely that it proved effective against shaped-charge projectiles such as RPGs and possibly ATGMs. Unfortunately for the Islamic State, these weapons would prove to be the least of their problems after the commencement of airstrikes by the Coalition. 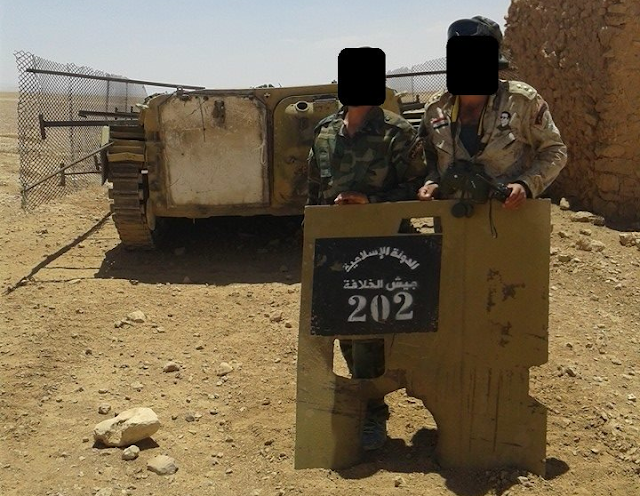 A subvariant of this upgrade programme carried a different type of slat armour arrangement, which appears to be more similar to the armour placement seen on Abu Hamza's T-72 'Ural'. This particular tank is slated to receive multi-spectral camouflage around its turret, the supports for which are already present during this stage of construction. Although certainly looking impressive, the slat armour has been installed over the 'metal mattress' with only little spacing in between. Similarly, whether the metal mud guards in the front of the tracks are truly effective against projectiles is doubtful. A look at BMP-1 '213' after completion of its overhaul, upgrade and repainting in 'The Workshop'. 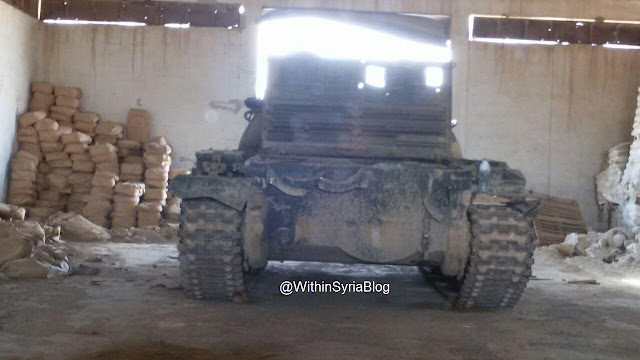 This image gives us a great look at the attachments of the additional armour panels on the sides of the vehicles. It is likely that the installation methods differed greatly between vehicles, as some armoured panels remained attached to the vehicle even after being hit, while others appear to have fallen off before the vehicle in question ever even saw combat. The exact same example would later be seen in Deir ez-Zor, where it had been destroyed by regime forces while trying to advance closer to the city. It is likely that the vehicle suffered an ammunition explosion as the turret is detached from the hull of the vehicle. While the installation of slat armour on the sides and turret was obviously not sufficient to prevent this particular example from being destroyed, the same armour arrangement is known to have stopped RPGs fired against it on several occasions. While the placement of explosive reactive armour on the hull of the BMP-1 would seem to be a simpler method of increasing the armour protection of the vehicle, the BMP's paper thin armour would actually make this method counterproductive as the explosion of Kontakt-1 ERA would shatter it upon being hit, further reinforcing fragmentation of the blast projected against the hull armour. 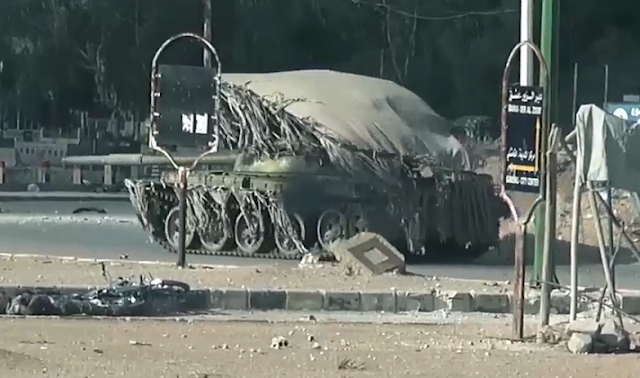 Despite this effect, several factions in the Syrian Civil War have tried reinforcing the BMP-1's armour with explosive reactive armour on the hull, sometimes with disastrous results. 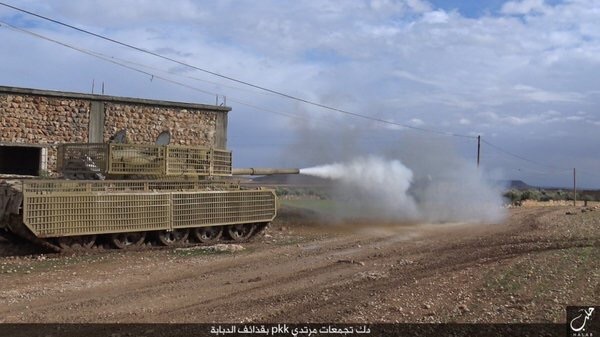 In addition to increasing the armour protection of several types of armoured fighting vehicles, 'The Workshop' also attempted to create solutions for the targeting of Islamic State armour by Coalition aircraft, which began since the latter launched its aerial campaign over Syria in September 2014. The Battle for Kobanî, where Coalition airpower played a decisive role in the defence of the city, made painfully clear the vulnerability of Islamic State forces to aircraft armed with precision guided munitions. Left defenceless against fast jets and unmanned aerial vehicles (UAV) circling overhead, the Islamic State's only viable option was to decrease the chances of detection of its forces, leading to interesting adaptations on the battlefield. An example is the production on several types of camouflage uniforms with an aluminium lining to prevent looking infrared (FLIR) targeting pods from picking up the heat source of the soldier. While these methods are relatively straightforward and easy to implement, the camouflaging of an object as large as a tank required a wholly different method, as clearly evidenced below and referenced earlier in this article. The suspended rope-like components that make up the camouflage are believed to be leather strips, and have a similar working as the camouflage uniforms mentioned above. 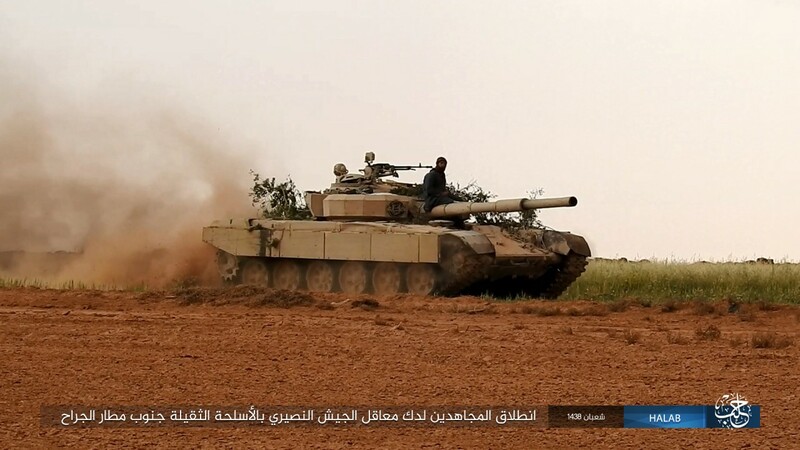 Unsurprisingly, nearly all of the tanks upgraded with multi-spectral camouflage would be deployed to Wilayat al-Barakah (al-Hasakah governorate), where the Islamic State was on the offensive against not only government forces but mainly the YPG. The latter could count on heavy Coalition air support, which would play a vital role in stopping the Islamic State's advance in this region. 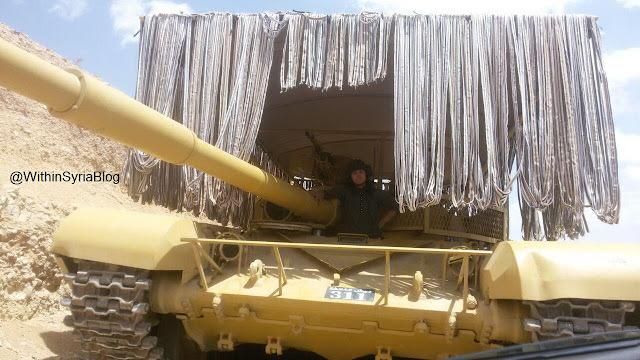 The T-55 seen below, with its camouflage nets still in travel position, is one of the examples to have been deployed to the al-Hasakah governorate, where it would later be seen in 'Lion of the Battlefield 2'. 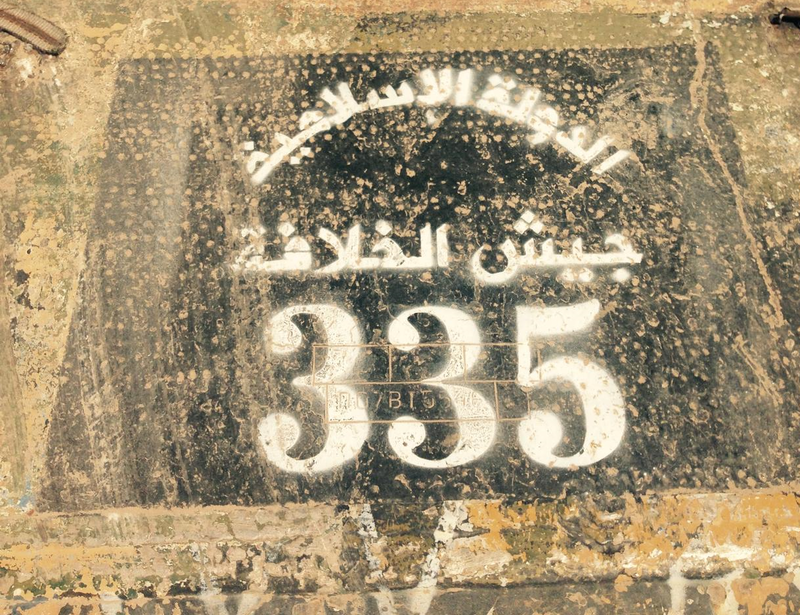 The markings on this vehicle have been applied in a crude manner, reading: جيش الخلافة - 'The Caliphate Army' '334'. 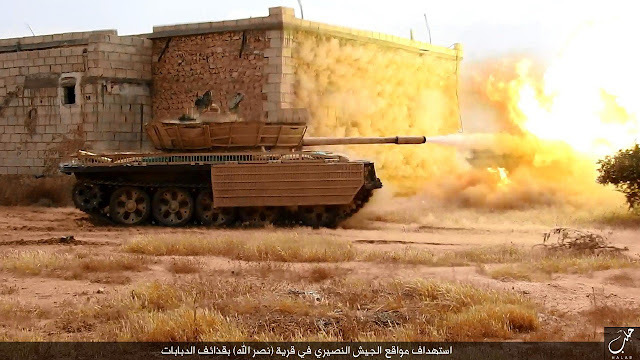 Similar to other Islamic State armour upgrades, the effectiveness of the multi-spectral camouflage at deceiving Coalition airpower remains largely unknown. 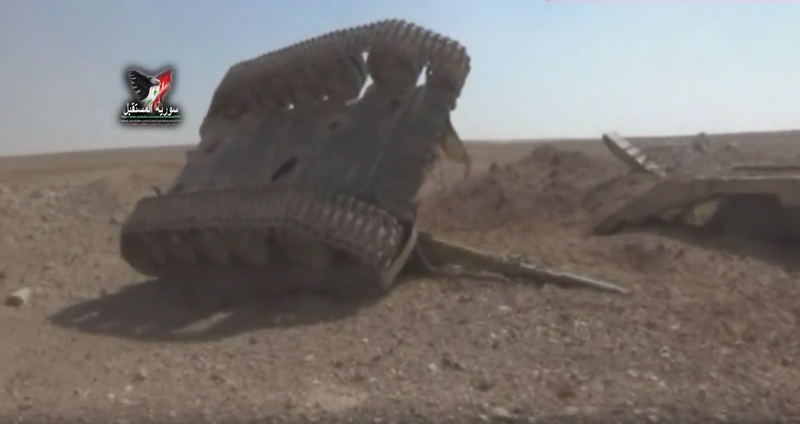 However, as no tank upgraded with this type of camouflage has ever been featured being targeted in footage of Coalition airstrikes, or has been seen destroyed by a presumed airstrike on the ground in Syria, it could indeed have proved effective at deceiving Coalition aircraft and thus avoiding detection. 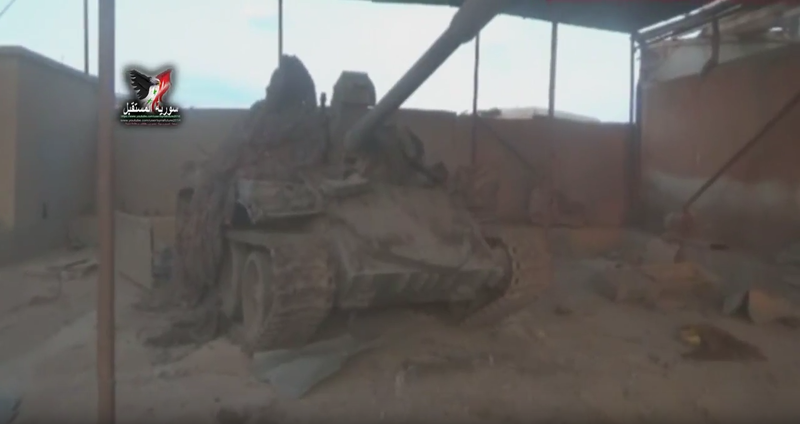 The limited footage that exists of the camouflaged tanks revealed that the construction and the strips themselves were highly susceptible to wear and tear, as is clearly evidenced on the T-62 below. 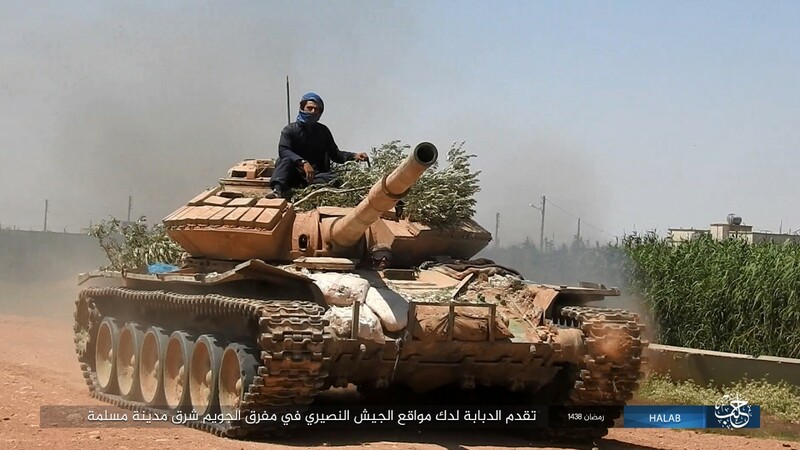 This particular T-62 was featured in the propaganda video 'The Glory of Jihad', which covered the Islamic State's attempt at infiltrating and capturing the city of al-Hasakah. It is unlikely that the battered camouflage arrangement in the second image still contributed much to deceiving Coalition airpower. The same tank after having been captured by the YPG in al-Hasakah, July 2015. T-62 '335' became trapped in the city after the YPG and regime forces surrounded the remaining Islamic State forces still left in the city, ultimately leading to the liberation of al-Hasakah on the 1st of August 2015. The wreck of T-62 '335' would be extensively documented, allowing for a better look at the construction previously holding the camouflage nets. The tank itself had already been disabled at this time, revealing extensive damage to its engine and rear of the turret. 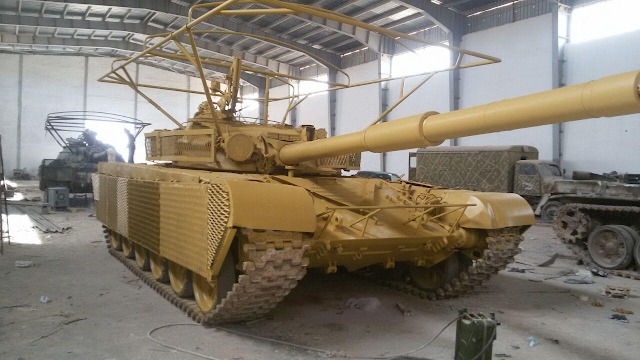 Abu Hamza would also photograph several T-62s while undergoing installation of the multi-spectral camouflage in 'The Workshop'. 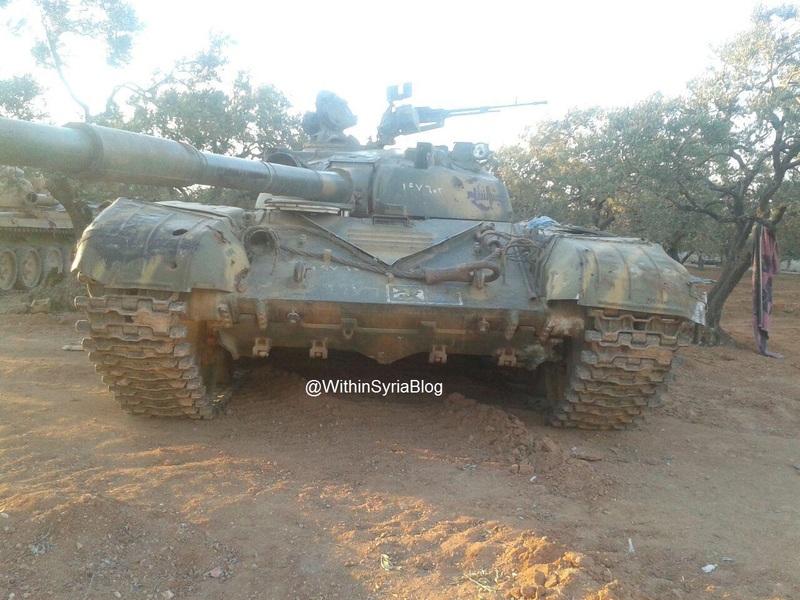 The T-62 seen directly below would later become '335' before it was hit and abandoned in al-Hasakah (above). 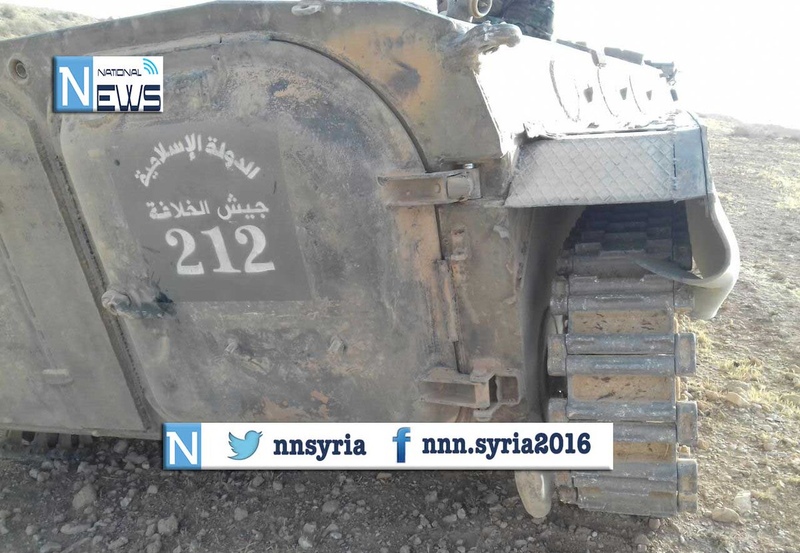 While the markings applied by 'The Workshop' allowed for easy tracking of Islamic State armour as they moved throughout Syria, the original Syrian Arab Army markings still left in place on several of the tanks could sometimes also provide valuable clues on the origins of the tanks. 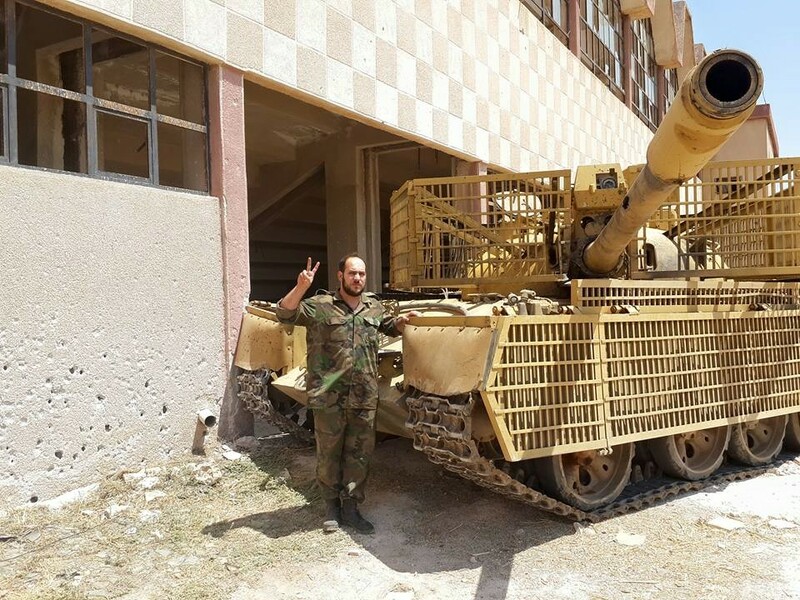 This became especially imperative after the capture of Brigade 93 on the 7th of August 2014, which presented the Islamic State with at least thirty T-55s and more than a dozen artillery pieces, amounting to the largest heavy-arms haul of the Syrian Civil War. 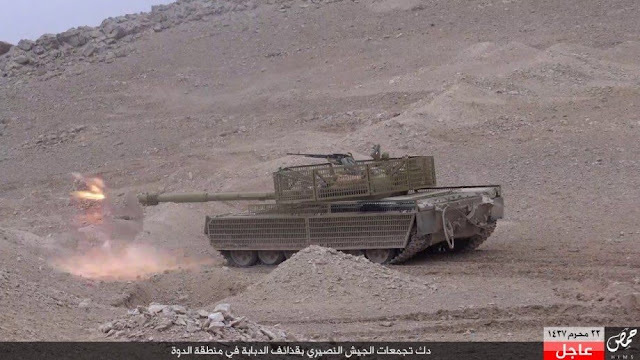 Arms hauls like this and others such as the capture of al-Qaryatayn in August 2015, providing the Islamic State with a further dozen T-62s and T-55s, would allow 'The Workshop' to continuously overhaul and upgrade a seemingly endless amount of armoured fighting vehicles. The upgrading of AFVs with increased armour protection meanwhile continued at a comparably fast pace, with large numbers of vehicles receiving a wide variety of armour upgrades. The quality of many of these upgrades sharpy declined during this period, this in sharp contrast to some of the earlier works of 'The Workshop' seen above. 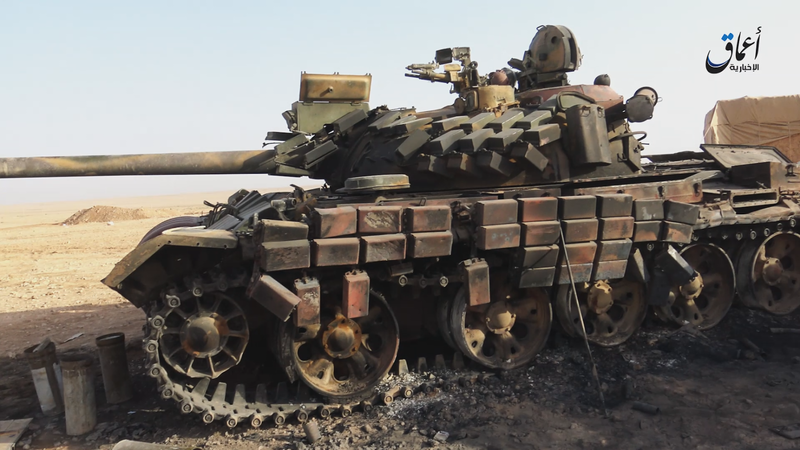 The T-72 seen below is a perfect example of this, with the extensive slat armour arrangement previously seen now replaced by sandbags around the turret and a shoddy-looking slat armour arrangement on the side of the tank. 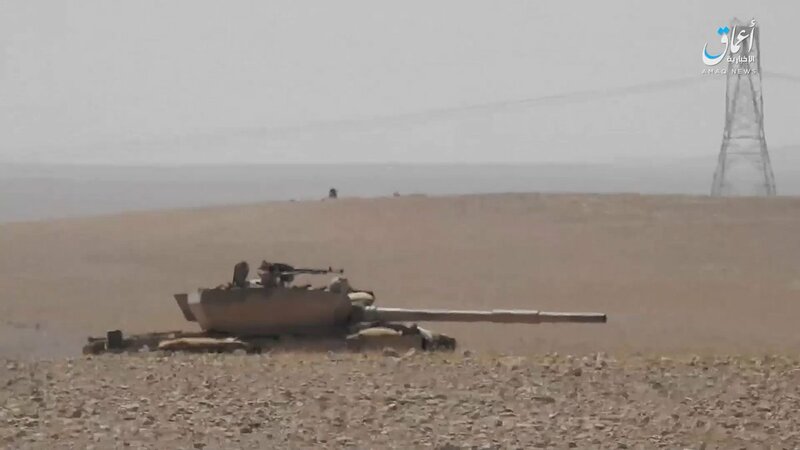 This particular tank was deployed to the area surrounding Kweres airbase, where Islamic State fighters were now engaged in holding the perimeter after the siege was lifted in November 2015. The first text bar reads: استهداف تجمعات الجيش النصيري بقذائف الدبابات غربي مطار كويرس - ''Targeting gatherings of Nusayri [Derogatory: Alawite] army west of Kweres airbase with tank shells'' while the second text bar reads: التصدي للطيران الروسي بالأسلحة الرشاشة غربي مطار كويرس - ''Fending off Russian airplanes with machine guns west of Kweres airbase.''. 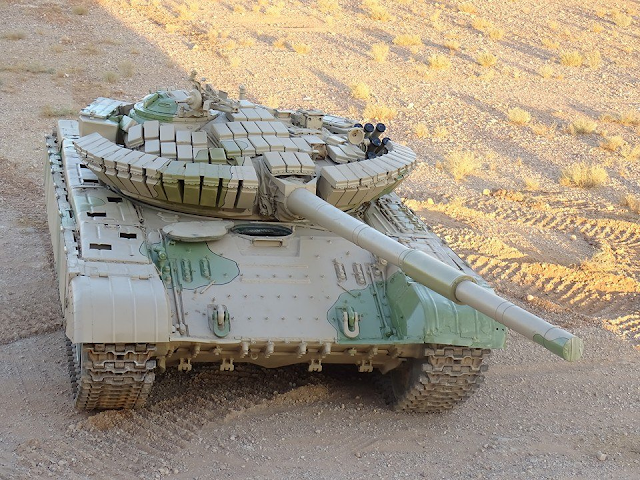 Upgraded along the lines of the earlier upgrade programme, several tanks would also receive similar slat armour fittings on the turret and sides of the tank. The extensive slat armour arrangement around the turret was abandoned around the same time, being replaced with a much simpler installation of metal bars that could also hold sandbags or various other materials in order to further reinforce the protection of the turret. The side skirts on this tank are of the same design as seen on some of the extensively modified AFVs above, albeit of a noticably worse quality. The horizontal bars have been unevenly welded on the frame, which further adds to the vehicle DIY (Do It Yourself) look. The thin strip of slat armour installed in between the turret and the slat armour on the sides looks especially fragile, and clearly hasn't been constructed properly. Further examples mainly differed in the layour of their turret armour, which was different on almost every tank. The usual arrangement consisted of the aforementioned installation of metal bars for stowage of sandbags or various materials. This is also evident on the three tanks below, each bearing traces of an upgrade along the path of the extensive slat armour programmes seen earlier. The single armour block still present on the T-55 with a North Korean LRF is especially curious for its use of slat armour, which has again been applied directly over another layer of armour, reducing its chances of actually stopping a shaped charge hit. 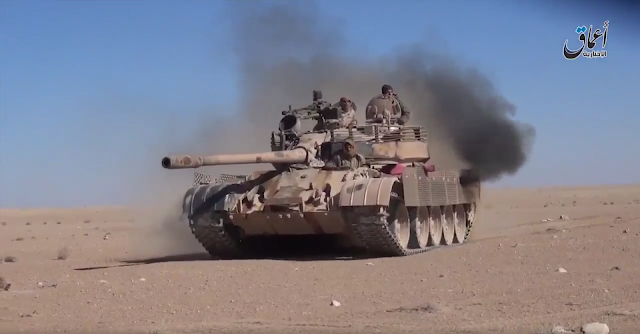 Large numbers of tanks upgraded by 'The Workshop' during 2015 would survive well into 2017, such as the T-55 operating in Wilayat Halab seen below. 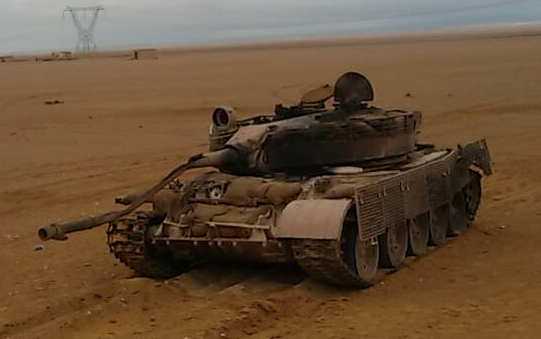 Much of the additional armour fittings on this tank appear to have fallen off, a logical result of months or sometimes years of fighting without being overhauled by 'The Workshop' again. 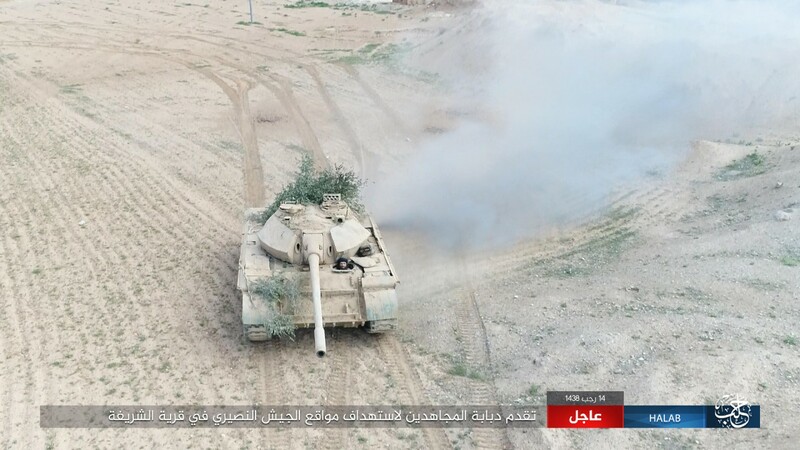 Indeed, while earlier periods saw tanks returning to 'The Workshop' on several occasions, the gradual decrease in the Islamic State's tank park prevented this from happening at later stages during the war. Apart from overhauling and upgrading various types of armoured fighting vehicles for future use on the battlefield, 'The Workshop' also began converting large numbers of AFVs to the role of vehicle-borne improvised explosive device (VBIED). In true Islamic State fashion, many offensives commence with the use of VBIEDs (which can be considered the Islamic State's morbid equivalent of an airstrike), usually consisting of a truck or an up-armoured 4x4. These suicide vehicles are not only effective in their destructive power, but even more so as a psychological weapon. 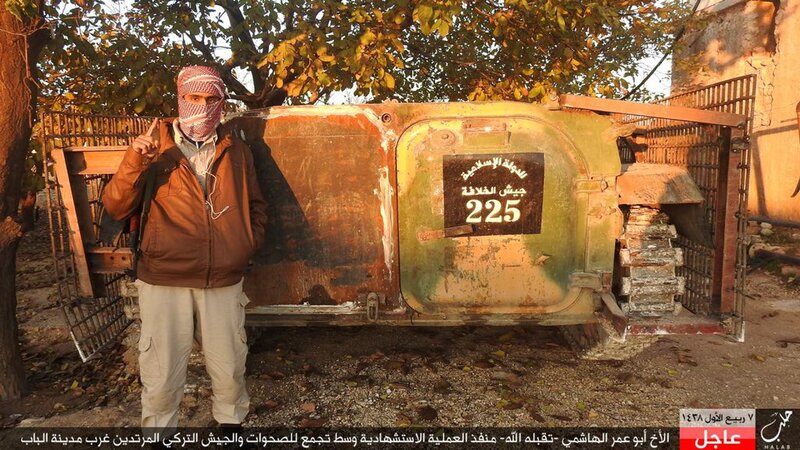 The Islamic State's efforts at producing VBIEDs did not remain limited to civilian vehicles however, and increasing numbers of AFVs were converted to this role since 2015. 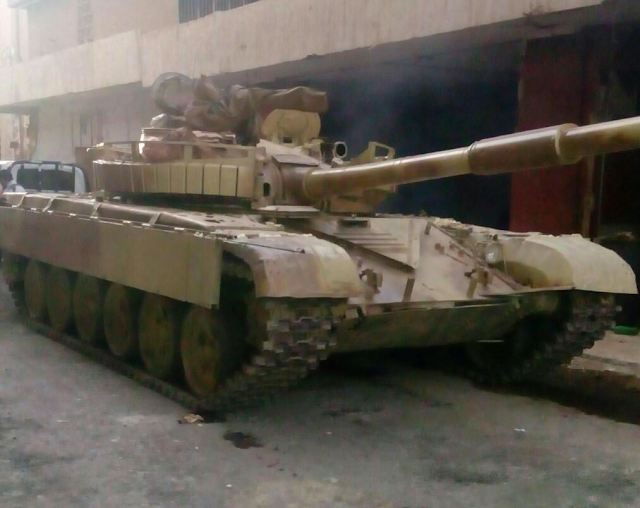 'The Workshop' likely followed the example of Islamic State forces in Deir ez-Zor, where tanks and bulldozers were used as early as 2014 as a platform for VBIEDs in an effort to flush the remaining regime forces out of Deir ez-Zor's heavily fortified city centre, often to devastating effect. 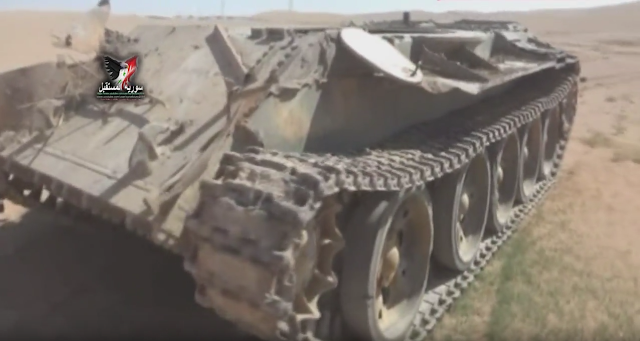 Two VBIEDs based on a BMP-1 and 2S1 were also employed in the Battle for Mennegh in 2013, where the Islamic State's use of VBIEDs proved decisive in the capture of the heliport. 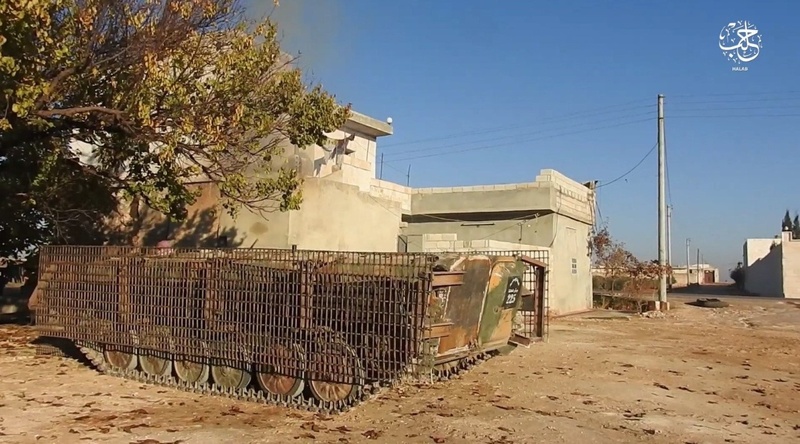 Many of the VBIEDs produced by 'The Workshop' were based on the BMP-1, which provided the driver with increased protection and mobility over conventional vehicles. 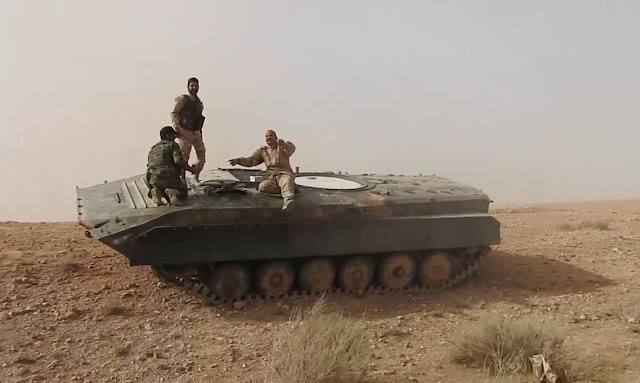 While one could argue that using precious BMP-1s for the role of VBIED would be a waste of resources, the BMP-1's paper thin armour and unimpressive armament makes it of limited use in today's conflict. While some unconverted BMP-1s have seen action in Wilayat Halab (Aleppo) and Wilayat al-Khayr (Deir ez-Zor), their absence has been noted on nearly every other front. 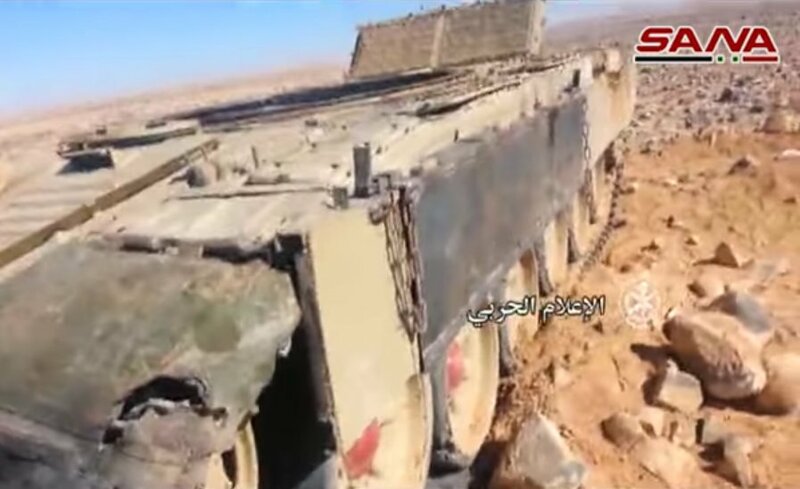 Arguably the most dreadful instances of these BMP-1 VBIEDs being used occurred near al-Qaryatayn, located in between Damascus and Tadmur. This town was heavily contested between regime forces and the Islamic State, which originally took control over the town on the 5th of August 2015. 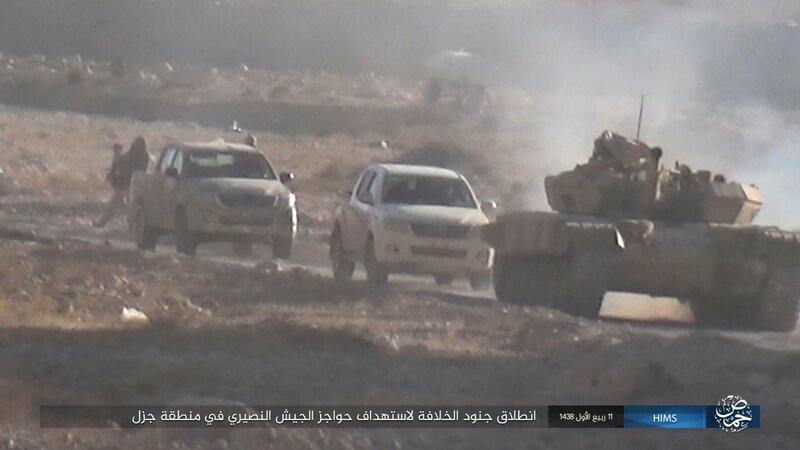 A government offensive launched in March 2016 sought to regain control over al-Qaryatayn, but quickly ran into Islamic State forces defending the town, which deployed several VBIEDs during its defence. 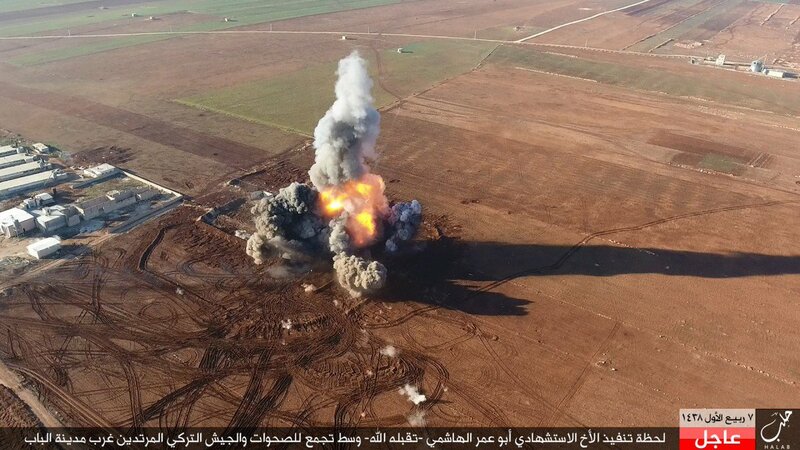 Apart from exploiting the chaos raging around al-Qaryatayn, the Islamic State found perfect use for its VBIEDs against positions of the Free Syrian Army and Turkish Army advancing on al-Bab. 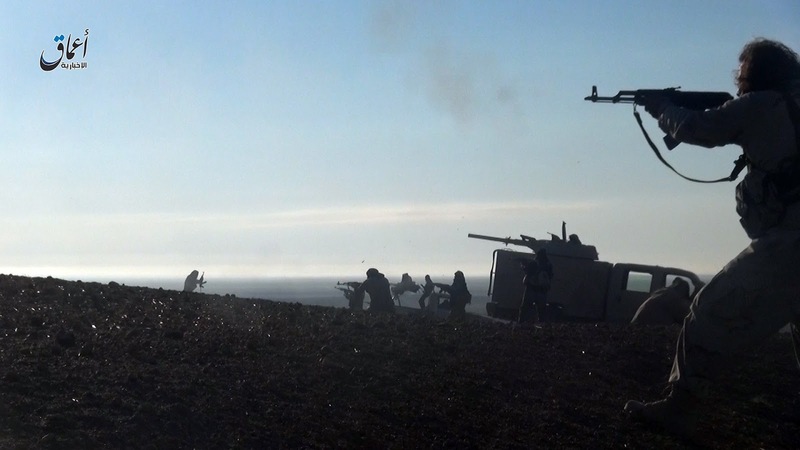 The slow advances made by the Free Syrian Army forced the Turkish Army to take up positions vunerable to Islamic State ATGM and VBIED attacks, a fact the fighters of the Islamic State knew all to well. Although several tank-based VBIEDs with the markings of 'The Workshop' would also be used throughout Syria, it is believed that most of these VBIEDs were actually converted to the role of VBIED in the field, not by 'The Workshop'. 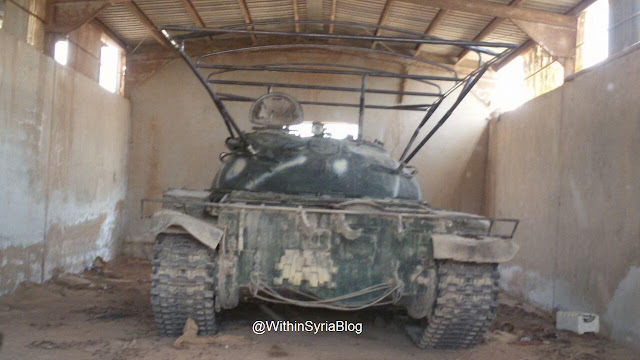 An example is T-55 '363' operating in Wilayat al-Khayr (Deir ez-Zor) seen below, which had its turret removed in order to allow for a larger payload to be installed in the space left vacant. The tank's resulting low profile is also advantageous in avoiding incoming RPGs, increasing the chance the VBIED makes it to its target. The explosion of the vehicle can be seen here (at the 3:26 mark). Likely still waiting for a target of opportunity, T-62 '347' would later be seen through the targeting pod of a Coalition aircraft before being blown to smithereens by an airstrike. The resulting explosion was so powerful that it not only completely destroyed the vehicle, but also disintegrated any evidence that a tank was ever there. Incidentally, the turret of '347' would later be found in an Islamic State field workshop in Northern Aleppo along with the turret of T-55 '324', which was likely also converted to a VBIED, and a captured M1114 belonging to the Abi Obaida bin Al-Jarrah Division. Islamic State fighters surrounding Seen airbase had meanwhile attemped to use the world's first T-72-based VBIED, which however failed to detonate its payload and was captured by government forces defending the area surrounding the airbase. Despite having taken up positions so close to Seen airbase's runway its fighters could see aircraft take off, the Islamic State never managed to gain enough momentum to launch a serious offensive on this airbase. This particular T-72 had been donned with side skirts that would later become standard on nearly all T-72s upgraded by 'The Workshop'. 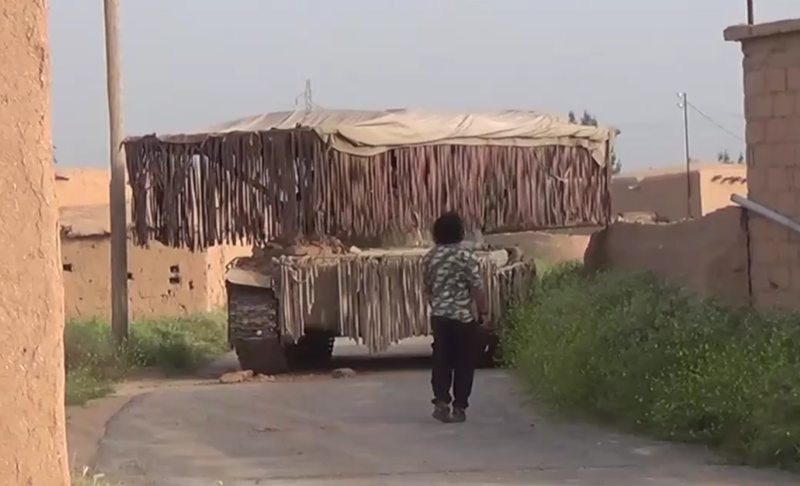 Interestingly, a single BTR-50 would also be used in the role of VBIED in Deir ez-Zor. Although a portion of the once significant fleet of BTR-50s might still survive in storage until this day, this vehicle has remained almost completely absent in the Syrian Civil War. This particular example is likely to have been found at one of the many Syrian Arab Army bases captured by the Islamic State throughout 2014, after which it was sent to 'The Workshop' for an overhaul and conversion to a VBIED. 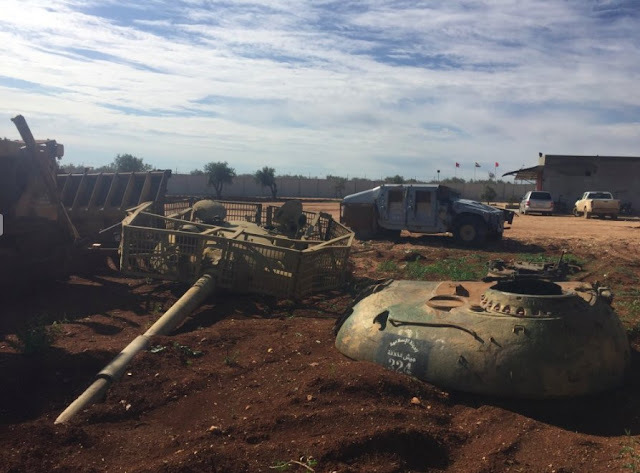 The conversion of BMP-1s to the role of VBIED resulted in a steady flow of turrets of the BMP-1s that were removed from the vehicles prior to their deployment. These turrets appear to have been cannabilised during earlier conversions, but later some were adapted for emplacement on a range of civilian vehicles such as the infamous Toyota Land Cruiser. The turret and crew compartment are modular, meaning they can be installed on different types of vehicles. 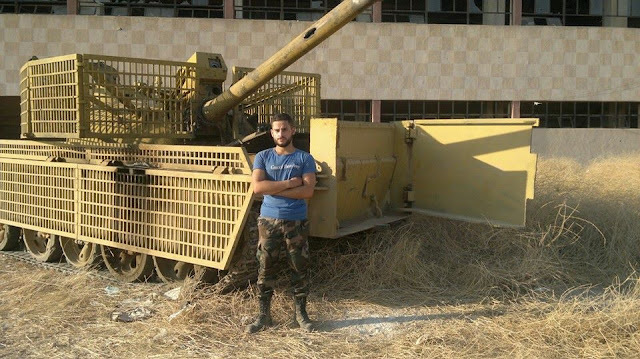 At least three of such heavily armed technicals are known to have been completed by 'The Workshop', which have mainly seen use in and around Deir ez-Zor. However, one example has also been sighted in action against the Turkish Army in Wilayat Halab, where curiously enough the vehicle's 73mm 2A28 cannon was used (20:59) in the role of artillery. These vehicles pack a serious punch for their size, and can even be armed with Malyutka anti-tank guided missiles. 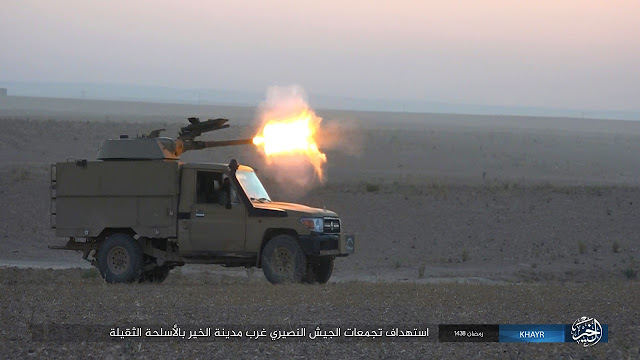 In addition to deploying these vehicles in Syria, at least one of these modular turrets '231' ended up with the Islamic State in Iraq, where it was subsequently mounted on a U.S. Ford F-350 in Wilayat Ninawa. 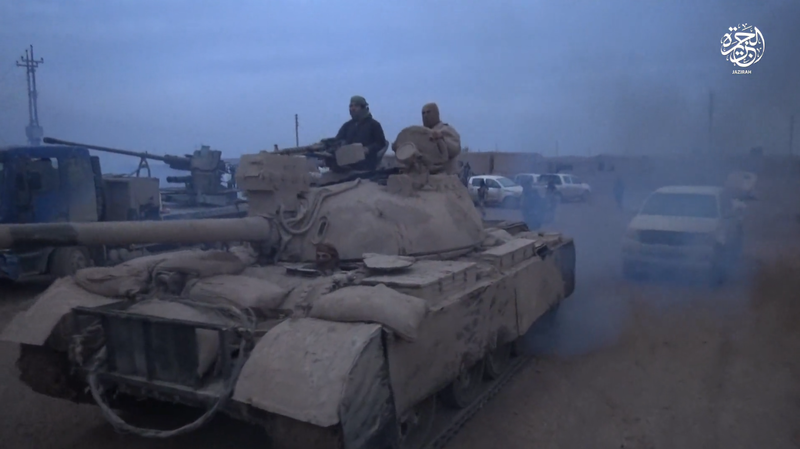 It was later seen participating in several offensives in this Wilayat, which also saw the rare use of tanks by the Islamic State in Iraq. This included the use of an up-armoured T-55 with a North Korean laser rangefinder supplied from Syria. 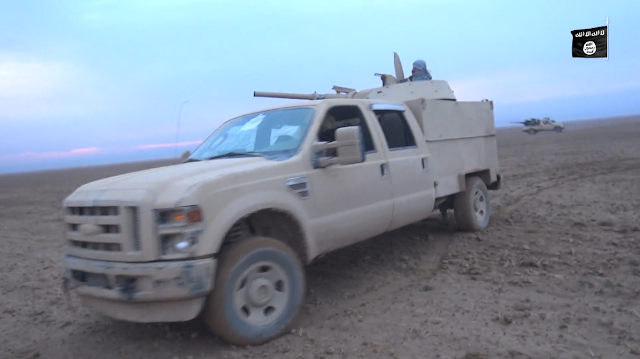 The fact that these vehicles could operate in Iraq at all is a testament to the fact that the Islamic State managed to attain nearly unlimited freedom of movement in the territories it held despite the air forces aspiring to prevent precisely that. Although 'The Workshop's' influence reached all the way to Iraq, the facility would come under direct threat at home for the first time in June 2016, the first serious setback for the until then still undetected facility. 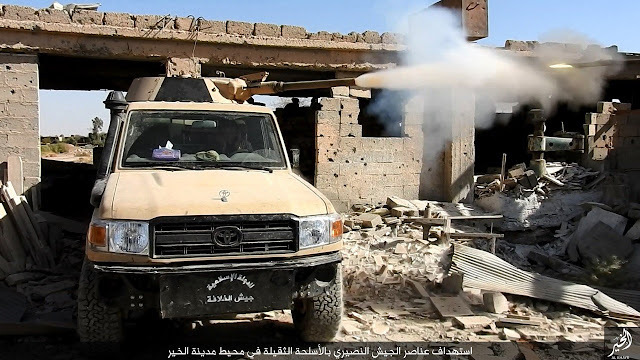 The Western flank of the Islamic State's heartland of Raqqa and Tabqa, also responsible for the protection of 'The Workshop', was only lightly defended owing to the flat terrain of the region, which left defensive positions vulnerable to both air and ground atttacks. 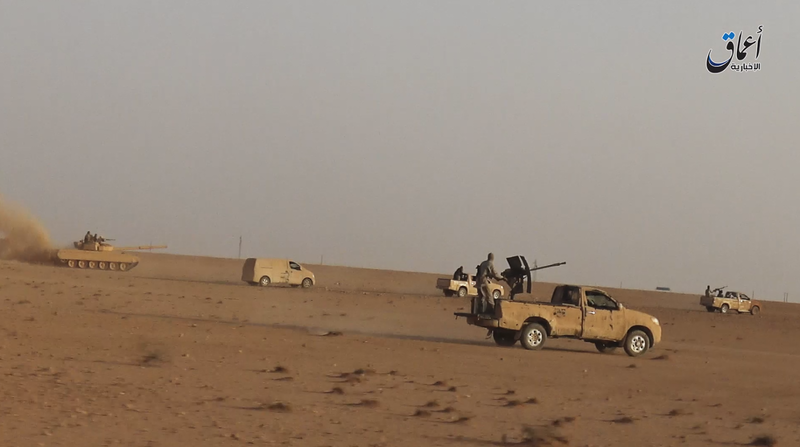 Although regime forces would successfully advance along the desert road closer to Tabqa, ultimately leading to the capture of 'The Workshop', the Islamic State made several efforts to slow their advance down to allow for the arrival of reinforcements that could stop and possibly reverse at least some of the advances previously made. Three BMP-1 VBIEDs were also destined to take part in one of these attempts, comprising BMP-1 '202', '212' and '222'. 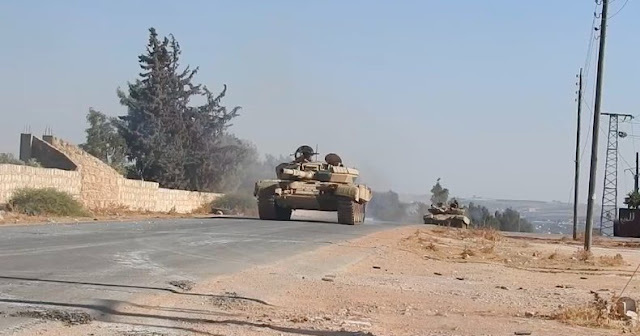 Although all three would succeed in temporarily slowing the regime's advance down, this was purely due to the fact that its forces had to neutralise the VBIED threat first. The flat terrain, the abundance of tanks and the frontal assault employed made the task of detonating the VBIED close to regime forces nigh on impossible, and all three would be captured intact. 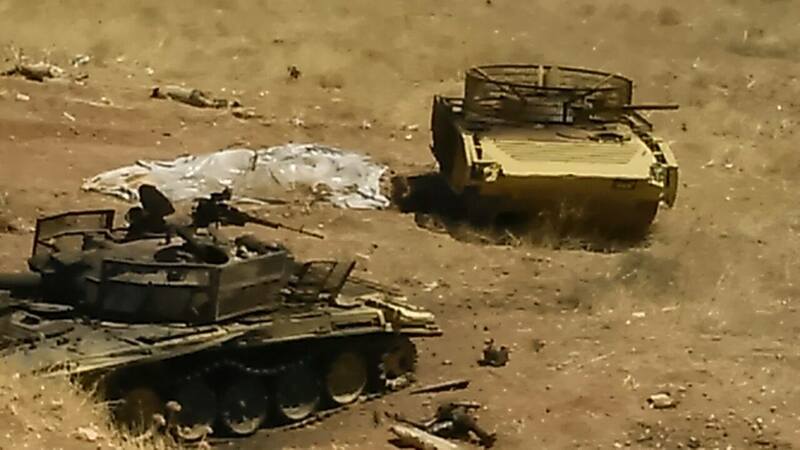 BMP-1 '202' appeared to have taken a serious hit, as evidenced by the metal armour plate seen above. 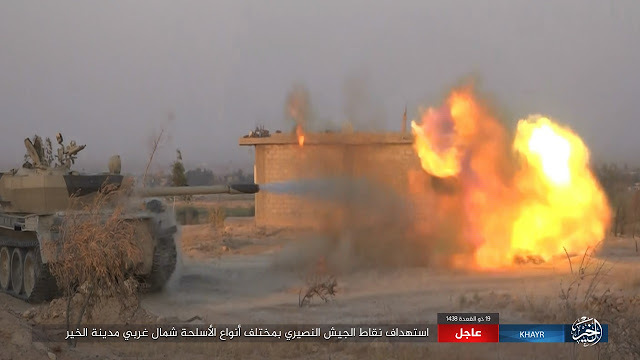 While the Islamic State's subsequent counterattack dissuaded regime forces from making further efforts at advancing in this region for more than a year, the Islamic State was now heavily engaged with government forces advancing around Kweres airbase. 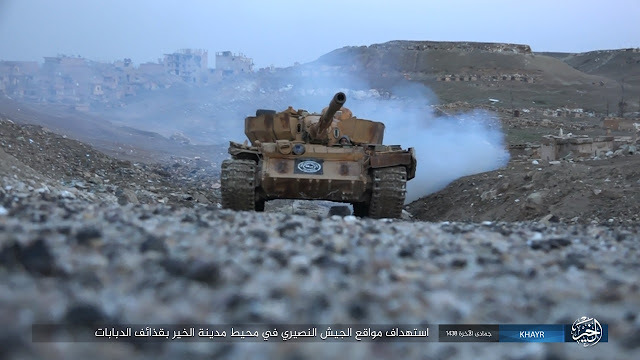 Gradually losing territory around the city of Aleppo itself, and having lost the initiative to capture Kweres, the Islamic State quickly found itself on the defence throughout Wilayat Halab. 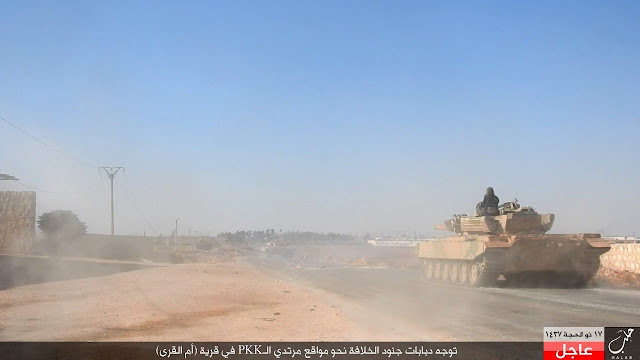 The large advances made by the SDF and Free Syrian Army supported by Turkey in the same region would also see regular appearances of Islamic State armour. Operating very little in terms of armour and anti-tank guided missiles (ATGMs), the Syrian Democratic Forces mostly relied on short range anti-tank weapons and Coalition airpower for the destruction of Islamic State vehicles and defensive positions. The Free Syrian Army advancing on al-Bab could also rely on airpower in addition to Turkish Leopard 2s and M60T Sabras, several of which were captured and destroyed by the Islamic State. In return, Turkish Army tanks are believed to have been responsible for the destruction of at least two Islamic State tanks around al-Bab. Despite the deployment of thousands of tanks by different factions, tank to tank fighting remains an extremely rare occurrence during the Syrian Civil War. 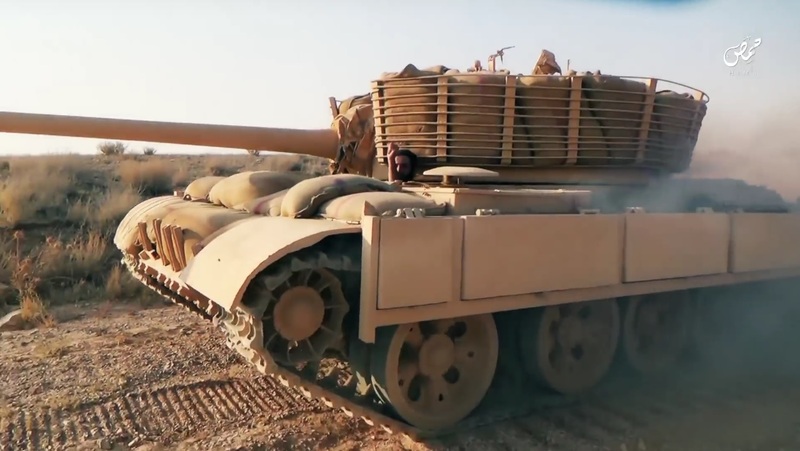 An entirely different type of modification to Islamic State armour appeared in late 2016 on a T-55 operating in Wilayat al-Barakah, as seen in the Islamic State propaganda video 'Lion of the Battlefield 4'. This upgrade uses armour plates on the sides and turret of the tank to increase its chances of stopping a round similar to how slat armour would. In the case of the turret the armour plates are spaced widely and filled up with gravel or sand for additional protection. Although this conversion provides slightly better protection than the slat armour upgrade, the downside is increased weight leading to somewhat less mobility. For this T-55, which ordinarily has no sideskirts, the upgrade has the added benefit of addressing this shortcoming in an unusually well-engineered manner, the professionality of which seems to go well beyond mere DIY. This exact same tank would later be seen operating in Wilayat al-Khayr, now camouflaged to better blend in with the terrain of Deir ez-Zor. 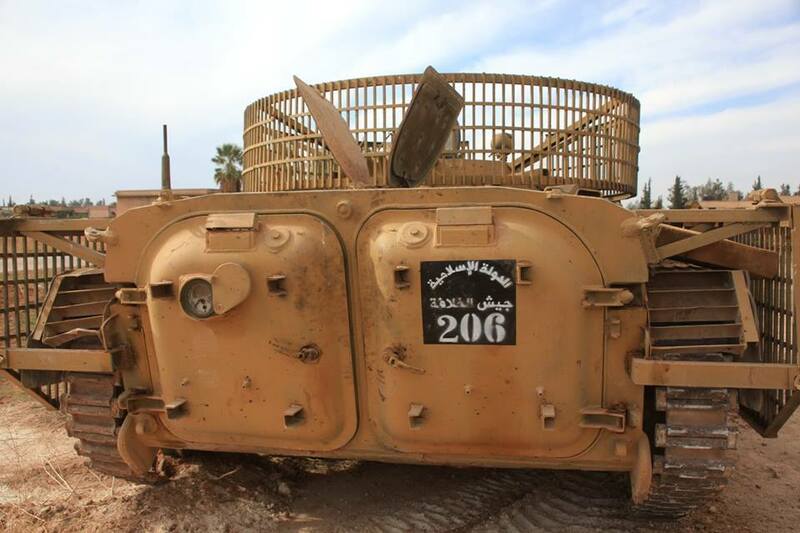 The square on the front of the vehicle reads: فرقة الزبير بن العوام ورشة المجنزرات - Zubayr ibn al-Awam Division - Workshop of the Tracked [vehicles]. 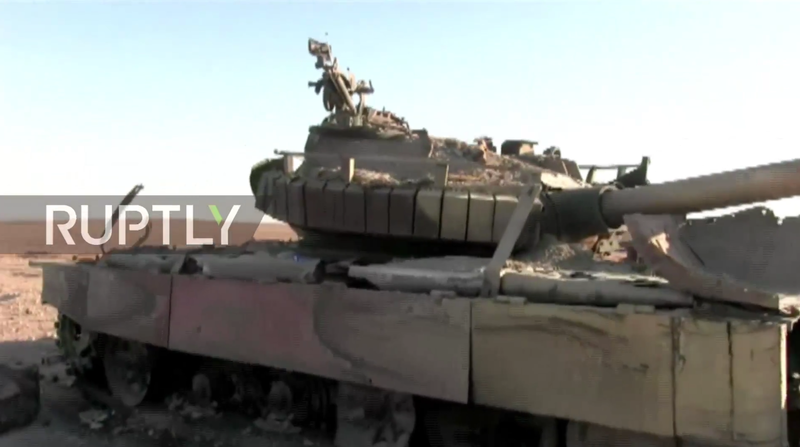 It is likely that this tank was transferred from the Hasakah Governorate to Deir ez-Zor after a string of defeats ended the Islamic State's hopes of eliminating the remaining YPG and regime presence here. 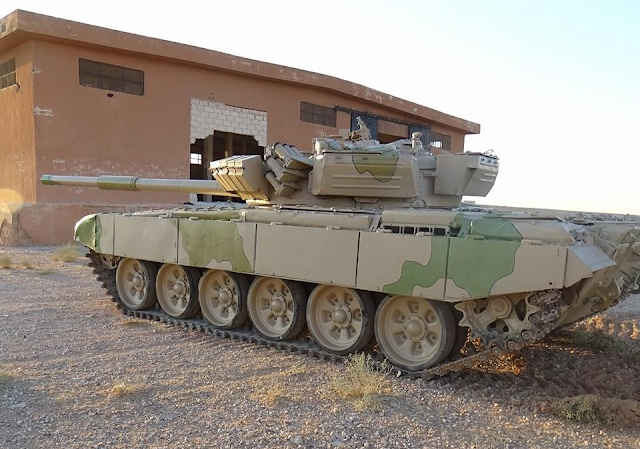 The first product of this new upgrade programme had already been seen participating in the counteroffensive near Tabqa on the 21st of June 2016 as a part of the 'Platoons of Special Tasks' sent out to halt and reverse the government forces advances previously made. This slick design incorporates an armour belt filled with gravel or sand around its turret and sets of armour plates bolted onto the already existing sideskirts. The crew of this tank would later permanently add sandbags to the turret and glacis plate in the hopes of slightly increasing armour protection. 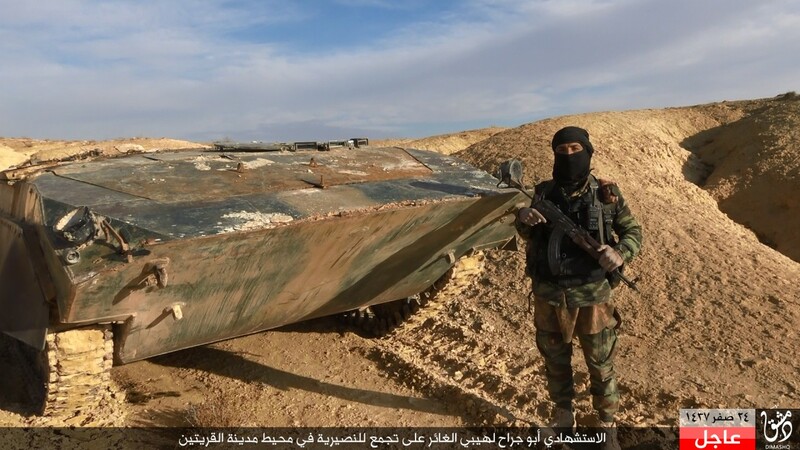 Although most Islamic State tanks ended up being deployed throughout the whole of the Islamic State-held territory in Syria, this tank could be exclusively seen operating against regime forces in Syria's desert environments, for which it received a well-matching sand dune paintjob. 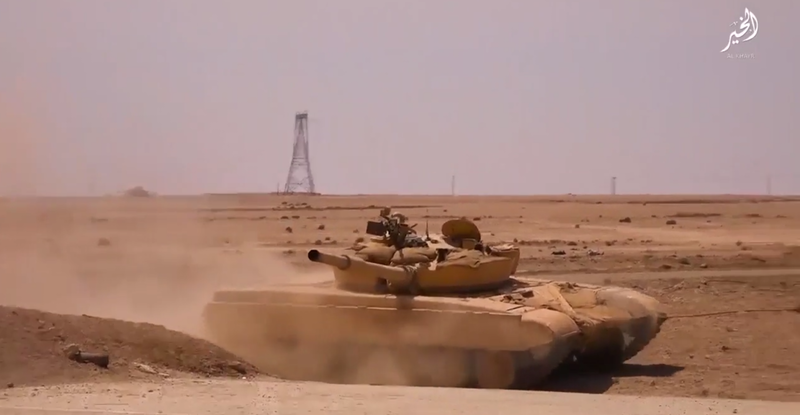 After its deployment to Tabqa, the exact same tank would later reappear in Wilayat Homs, where it could be seen operating in the Islamic State propaganda video 'The Clear Victory'. A slightly different variation of the tank displayed above would later be seen in Wilayat Dimashq, showing the upgrade was performed on more than one tank. 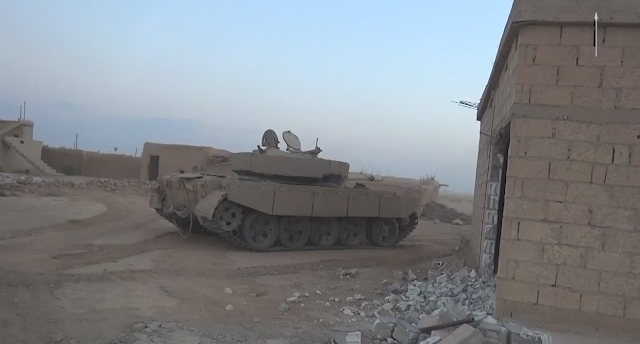 The last sighting of this tank occured in October 2016 just outside of Deir ez-Zor, where the tank featured in 'Support from God, and imminent victory (5)' along with two other up-armoured T-72s. The footage includes the arrival of this particular tank by a heavy-duty truck, confirming it had deployed to Wilayat al-Khayr specifically to take part in the offensive, after which it was likely redeployed again to another theatre of operations. The tank has not been sighted since, and has likely fallen victim to Coalition or Russian air power. This armour arrangement would serve as the basic template for a series of very meticulously converted tanks with slick appearances and an obviously much more carefully deliberated layout. Although most converted tanks are T-72s, the upgrades performed on each are different and applied in just a single instance, making each and every design unique. 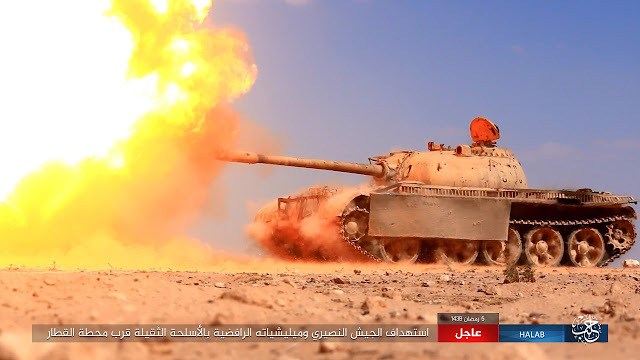 Each iteration introduces its own improvements over the last however, suggesting an increasingly sophisticated approach towards upgrading the Islamic State's remaining tank force, as well as a hithero unprecedented amount of time and resources spent on individual vehicles. 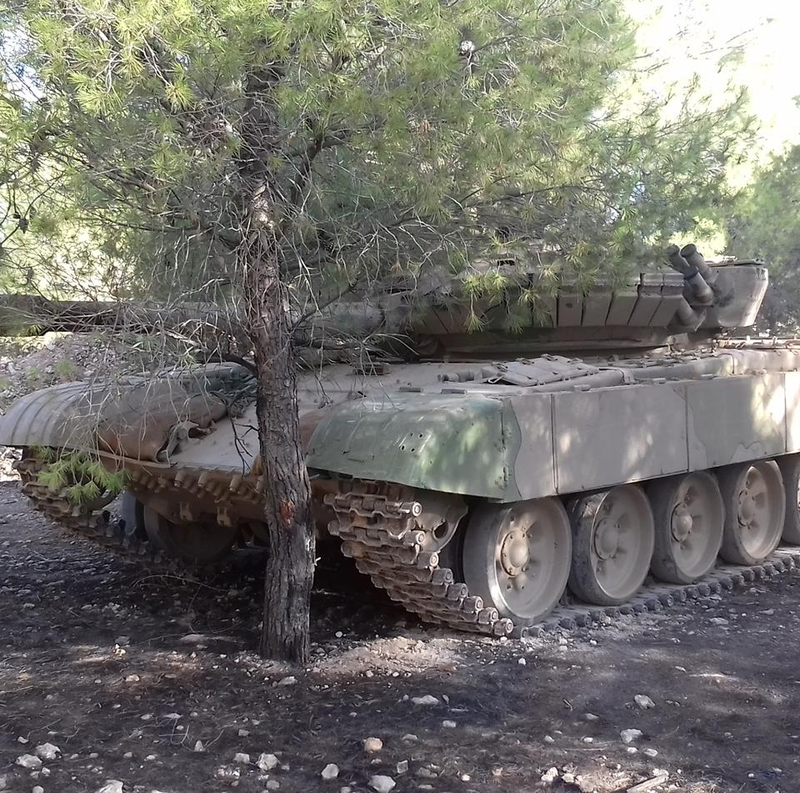 A prime example is this neatly upgraded T-72AV, the first of the upgraded tanks to receive an elaborate camouflage pattern, clearly reflecting the care invested in the upgrade as a whole (the misplaced tow hooks constituting an oversight that the author is willing to forgive). This is affirmed by the meticulously repaired mud guards which alongside details such as the holes cut in the tool boxes – to allow for filling them with additional materials for armour – attest to the precise approach undertaken by the Islamic State engineers working on the project. This is also apparent in the main feature of the upgrade; a belt of armour likely filled with gravel or sand closely fitted to the turret. While the angle of the newly installed ERA on the armour belt and the presence of ERA on top of the turret but not on the glacis of the tank might seem strange, it is likely related to the increased threat of Coalition air power, which the crew hoped to counter by adding ERA tiles oriented towards the sky. Despite the highly serialised outlook of the tank, which one would sooner expect to see as the result of an indigenous project of an ex-Soviet republic, a closer look reveals the loss of some of the tank's functionality. Aside from blocked optics and missing IR searchlight, a notable example of this is the smoke grenade dischargers, which due to the placement of the newly installed armour belt would now strike the tank itself when fired. As Islamic State fighters are unlikely to make frequent use of such features anyway, the decision to forgo them is sensible. 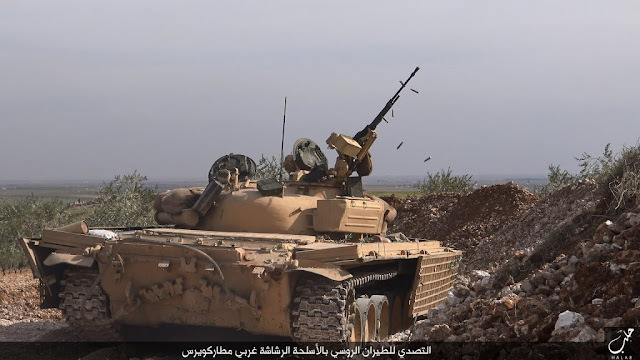 This same tank was sighted in action twice; during an Islamic State offensive near the town of Um al-Qira it participated in the assault on the town along with another upgraded T-72. Incidentally, this tank was filmed from both the side of the Islamic State and the defending SDF during the offensive. The text bar reads: توجه دبابات جنود الخلافة نحو مواقع مرتدي ال PKK في قرية (أم القرى) - ''Tanks of the Caliphate soldiers rolling towards the positions of the PKK apostates in the village of Um Al-Qira.'' The tank also took part in the Tadmur offensive in December 2016. 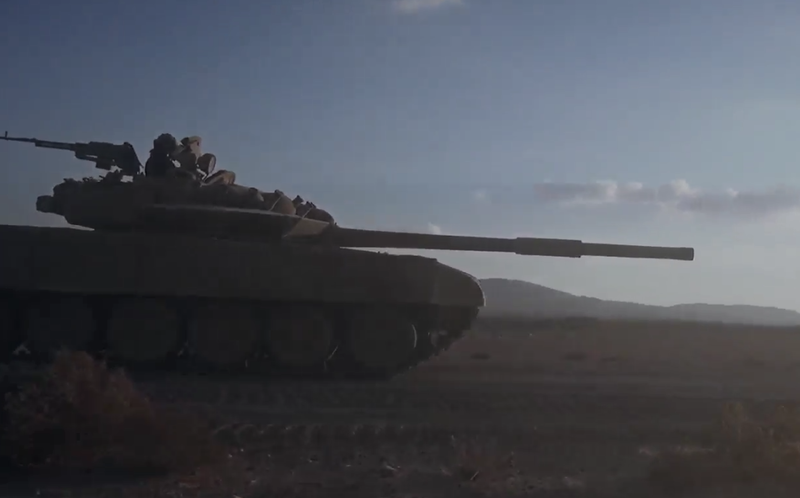 Featuring a completely redesigned arrangement of Kontakt-1 ERA blocks on its armour belt, this modified T-72AV was also seen in action near Tadmur in December 2016. 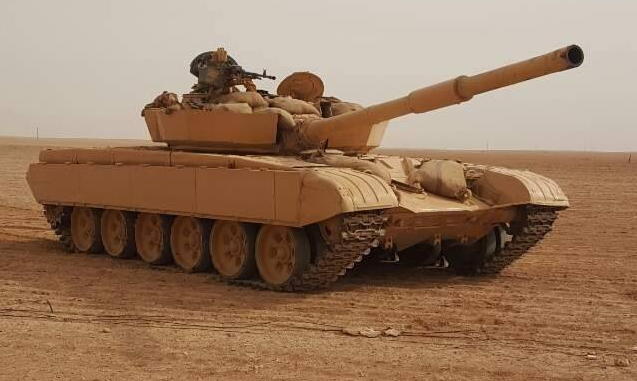 The appropriately chosen camouflage pattern of the tank, the unusual array of ERA tiles and the well-designed side skirts could lead one to believe it concerns a more modern T-72 or T-90 variant, far from the creation of a terrorist group embroiled in close to half a decade of war. 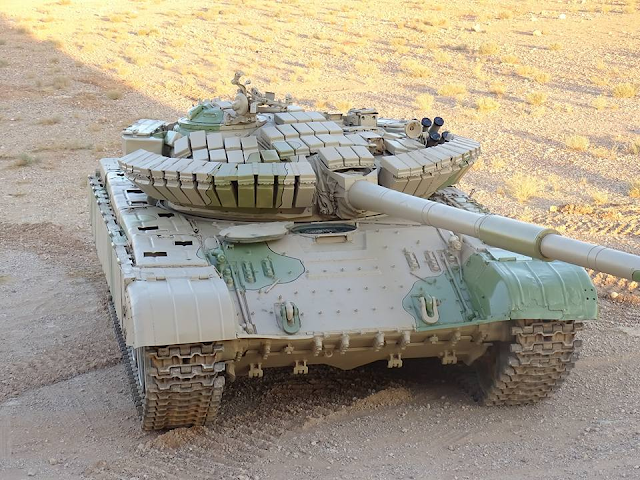 While the modified T-72 above has no ERA on its front glacis plate this variant does, which is likely directly related to the amount of explosive reactive armour available at the time of upgrading. 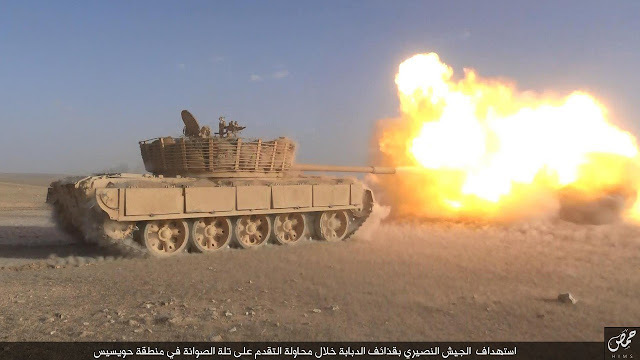 The second Tadmur offensive, arguably the Islamic State's last large conventional show of strength, saw the involvement of a large number of armoured fighting vehicles upgraded by 'The Workshop' amassed from Islamic State-held territory to take part in the offensive. 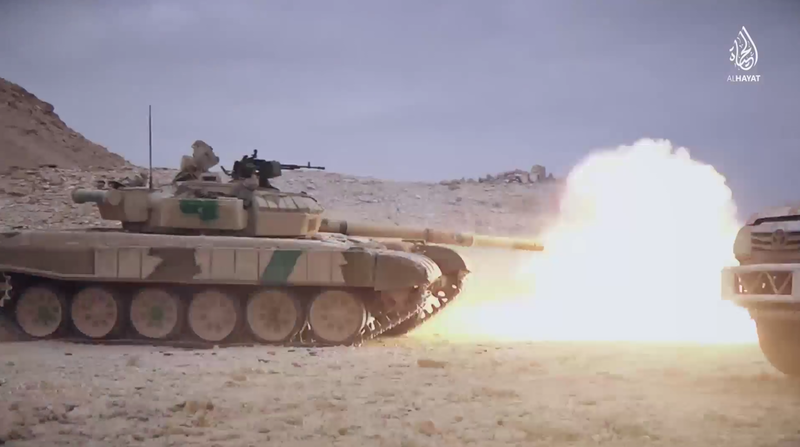 An example of which is the T-72 below, which appears to have received an angled armour belt with several smoke grenade launchers installed on top. Arguably the most impressive looking product coming from the Islamic State is also one that is unusually often sighted in propaganda material. Ironically, it has nonetheless eluded attention mostly due to the quality of the footage it has thus far been shown in, a problem that is fully addressed by the images below. This tank stands out for its attractive 'Splinter camouflage' (the efficacy of which is doubtful on this tank however), which has so far only been sighted on one other tank, as well as the extremely neatly aligned composition of its armour upgrades and ERA tiles. The obviously high level of attention to detail expresses itself in cutouts made for the optics, the preservation and relocation of two smoke grenade dischargers next to the main gun dust cover and holes made in the tool boxes above the tracks for aforementioned reasons. Like its converted siblings, it features a belt of armour filled with gravel around the turret as well as reinforced sideskirts. The ERA placement on this armour once again differs however, with specific attention diverted to the front glacis plate, turret roof and only the upper side of the turret armour belt, as opposed to the generous rows of ERA on the previous two examples. 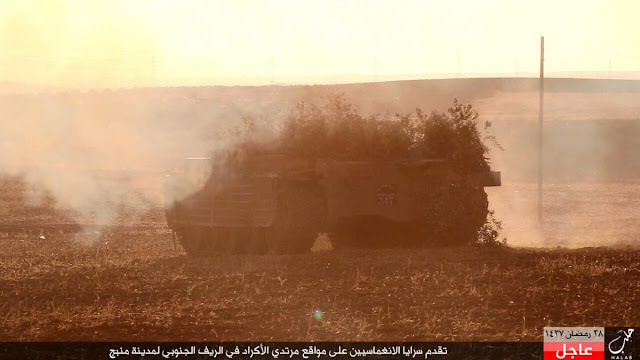 All in all, the fancy camouflage, detailed upgrades and impressive armour modifications make this tank a truly unexpected sight amongst the battered vehicles usually encountered with the Islamic State. 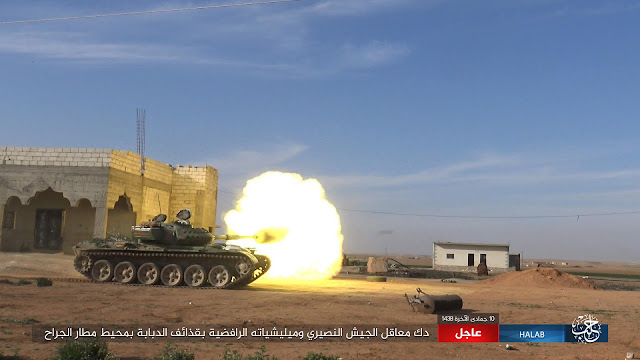 This tank was seen in the same convoy as one of the upgraded T-72s already mentioned above near Um al-Qira, this would be the first of three sightings of the tanks in action. It was again seen during the Tadmur offensive leading a convoy of Islamic State vehicles, likely belonging to one of the 'Platoons of Special Tasks' who took part in the offensive. 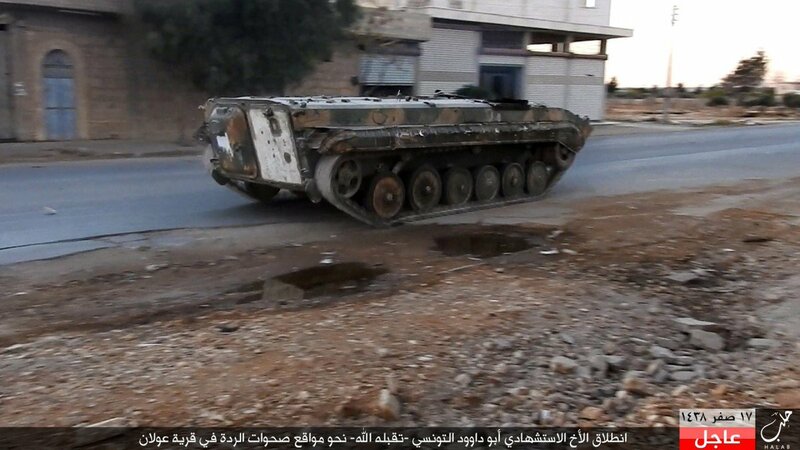 This nowadays rare display of Islamic State strength in Syria eventually resulted in the capture of the city on the 11th of December 2016. However, failing to push further to T4 airbase, as well as lacking the troops to defend the area, government forces recaptured the area on the 2nd of March 2017. 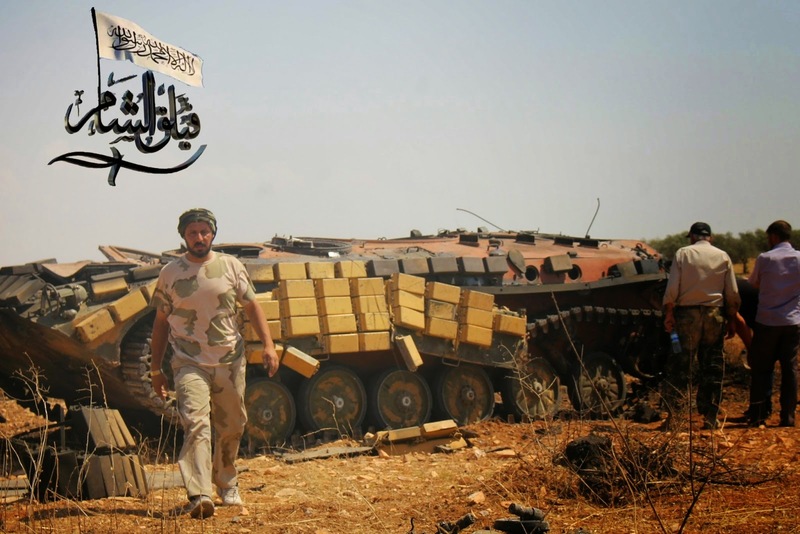 The text bar reads: انطلاق جنود الخلافة لاستهداف حواجز الجيش النصيري في منطقة جزل - ''Soldiers of the Caliphate on their way to hit checkpoints of the Nusayri [Derogatory: Alawite] army in Jazl area.'' 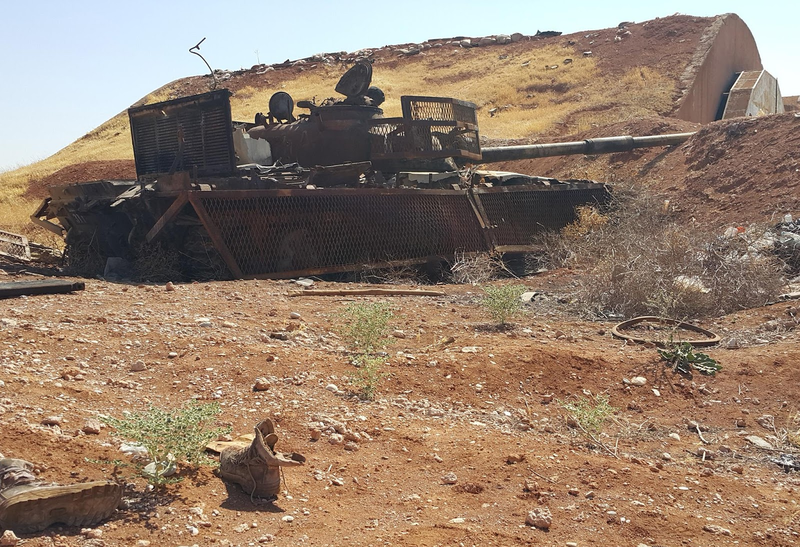 The last sighting of the tank occurred near Salamiya, Hama Governorate, where its frequent combat use had left it with a battered exterior, soldiering on despite the obvious wear the unabating struggle for control over Syria has inflicted it with. In addition to these impressive looking designs, 'The Workshop' produced several additional subvariants, each boasting a different layout of explosive reactive armour around the turret. Although likely roughly equal in terms of protection, these tanks are arguably less impressive in their looks, and don't appear to have received the same share of attention as the slick designs showcased above. Interestingly, the example below appears to have received additional armour plating on its lower glacis plates to marginally increase its chances of survival when hit here. Two similarly upgraded tanks would later show up after having been destroyed by Russian Air Force assets near Arak, Homs Governorate. Rapidly losing its remaining territory throughout Syria, the Islamic State committed large numbers of troops and AFVs in a desperate attempt to hold off regime forces advancing to the besieged city of Deir ez-Zor. Having no suitable anti-aircraft weaponry whatsoever, many tanks subsequently fell victim to Russian attack helicopters operating in the area. 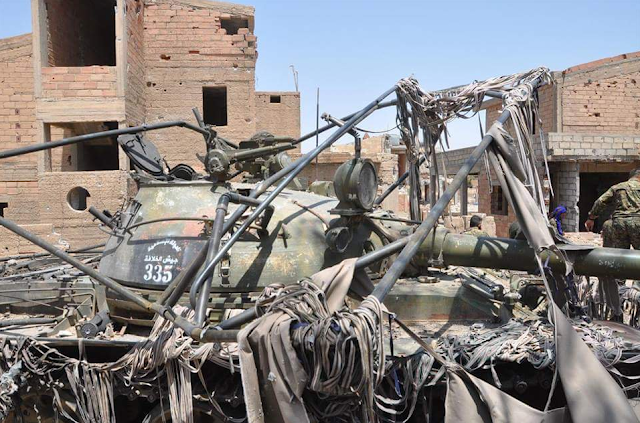 The sad remains of both T-72s nonetheless give an interesting look into the contents of the armour belt wrapped around their turrets, which confirms the earlier notion that gravel or sand was used as a filler. 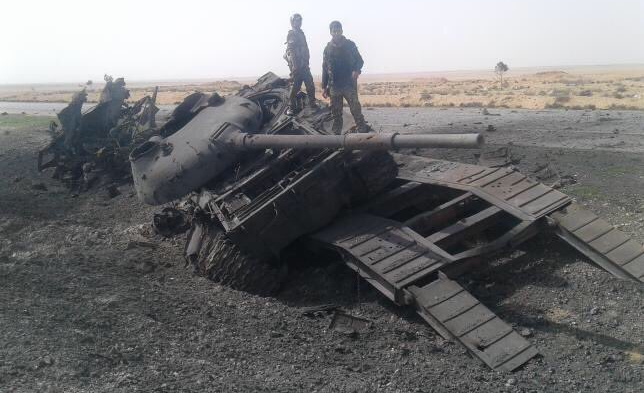 The hit that destroyed the first T-72 appears to have knocked the ERA-rich armour belt loose from the turret, showing the sturdiness of engineering left something to be desired. The upgrade of several tanks, mostly T-55s and T-62s, with less advanced armour packages continued for as long as 'The Workshop' remained active. 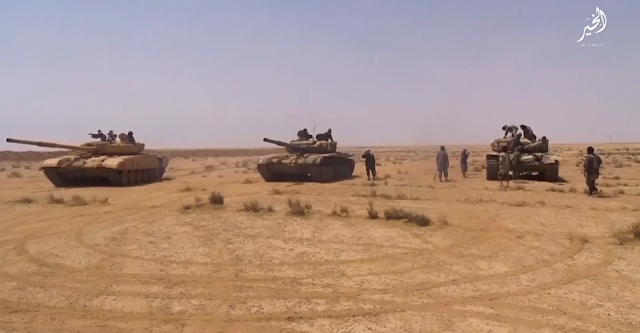 Interestingly, none of these tanks received any explosive reactive armour, which appears to have been exclusively used for installation on the aforementioned T-72s. The quality of these upgrades differs on each of these examples, likely dependent on the amount of recources and time that happened to be available during its stay at 'The Workshop'. 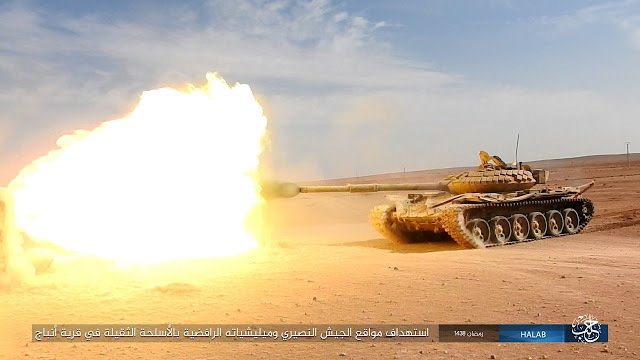 One of these tanks would suffer a catastrophic failure of its main gun in the Syrian desert, tearing much of the barrel apart and rendering it completely useless for future use. To no one's surprise, this tank was subsequently abandoned. While the cause of this failure is unknown, it is certain that many tanks still operating in the Syrian Civil War are badly worn out and likely in need of a replacement of their gun barrels, which are made to only fire a certain number of rounds before installation of a new one is required. Another variant was seen with a curious layout of side skirts, which appears to consist of individual armoured panels bolted on to the side of the tank. These panels could allow for easier replacement after a hit has taken one out, but above all this construction appears to be tougher than the other variants of side skirts seen before. The turret armour on this tank is less innovative however, merely consisting of a metal slat armour frame reinforced by sandbags for a marginal improvement in protection. 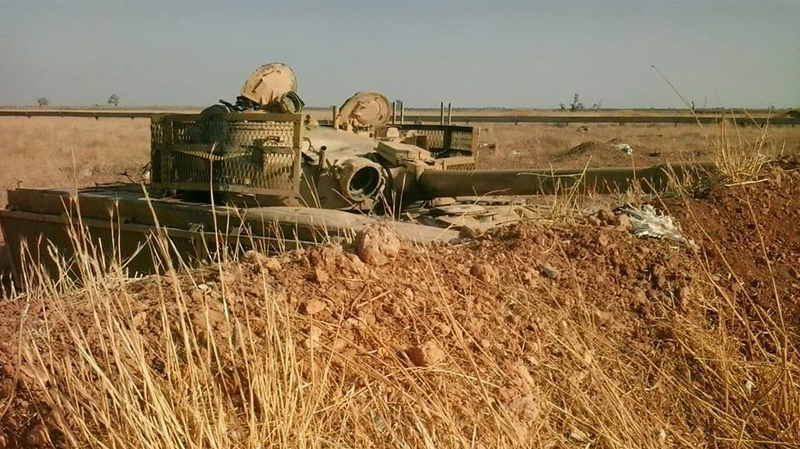 While the eventual fate of most of these upgraded tanks unfortunately remains unknown, the final resting place of one of them was clearly shown after it had deployed to Wilayat Halab initially in a bid to halt the advances made by government forces around Kweres airbase, as seen in the first image blow. 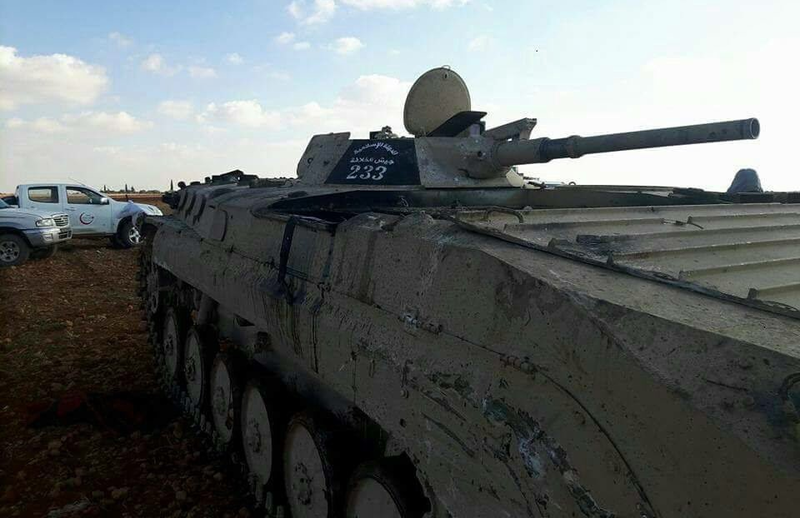 The text bar reads: جانب من الهجوم على مواقع الجيش النصيري بين قريتي المفكر وعقارب الصافي - غنم دبابة نوع T-55 - ''Scene from the attack on the positions of the Nusayri [Derogatory: Alawite] army between the villages of Mufakkar and Aqarib Al-Safi. 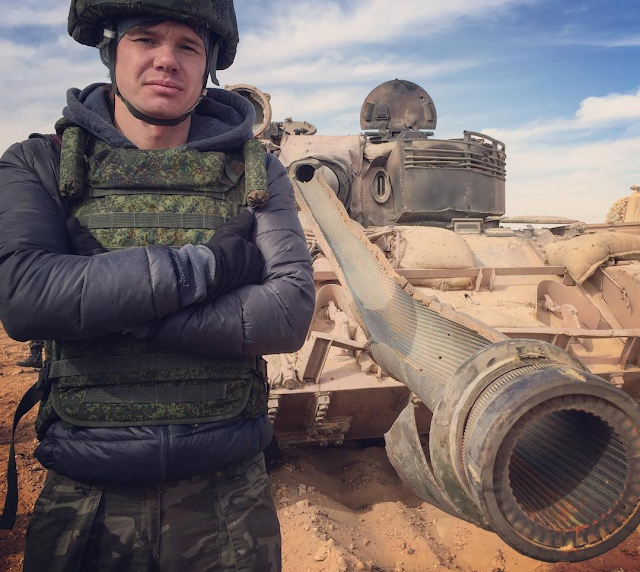 A T-55 tank was captured.'' 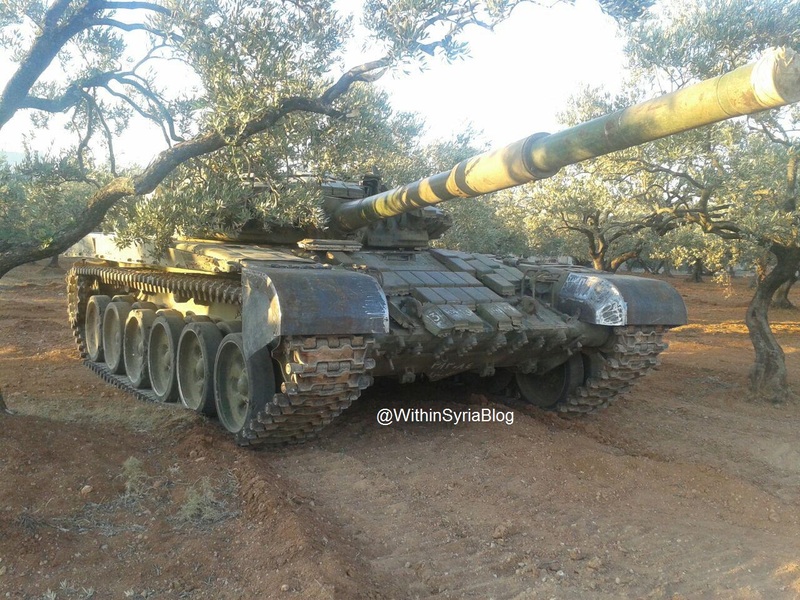 It apparently redeployed to al-Bab some time later, and would later be destroyed by the Turkish Army around al-Bab. The penultimate upgrade produced in meaningful numbers continued with the earlier concept of an armour belt wrapped around its turret, but this time somewhat of a bulkier and thus likely somewhat tougher appearance. This type of upgrade commenced in 2017 and has only been seen on three tanks before 'The Workshop' was overrun by government forces, ending the prospect of seeing more of these tanks roaming around on the battlefield. The final tanks upgraded by 'The Workshop' represented a hodgepodge of designs mirroring earlier armour upgrades in general layout but of lesser quality and presumably efficacy. On the examples seen below, the armour around the turret appears to consist of simple welded metal plates, again filled with sand or concrete. ERA was added to the turret roof and upper glacis plate whenever available, but often also omitted. 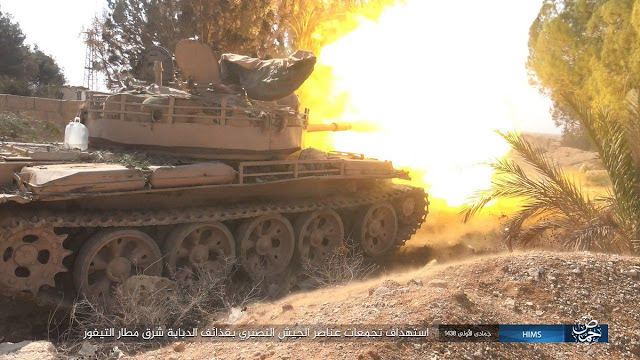 Additionally, the same reinforcement of the side skirts seen on previously upgraded tanks is apparent, which in the case of the second image below evidently did not protect the tank as it was captured by regime forces after a hit from the side knocked out its engine. 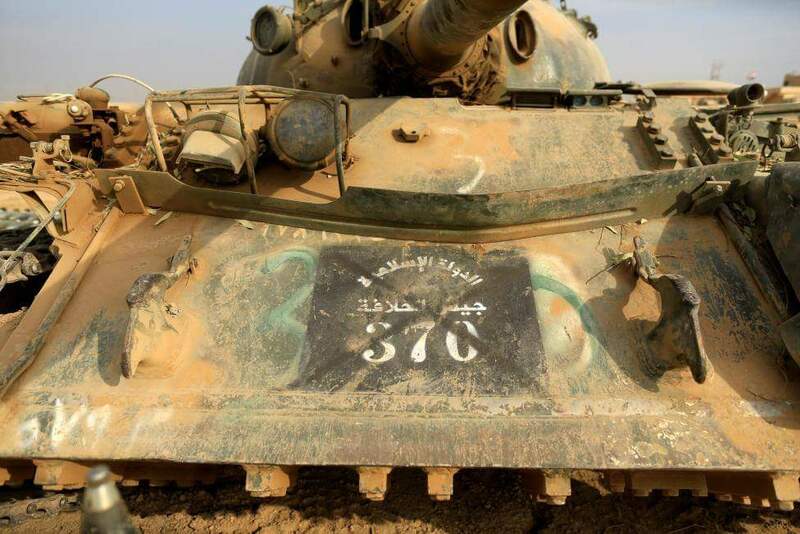 On the T-72s below, the seal displayed on the turret armour reads: فرقة عثمان بن عفان ديوان الجند - البلقاء - 'Othman bin Affan Division - The Soldiers' Office - Al-Balqaa'. It is believed three or four tanks have been converted in this manner, before the last stage of designs 'The Workshop' would output appeared. Another example would receive a similar arrangement of turret armour in addition to slat armour protecting the sides of the tank previously seen on earlier conversions undertaken by 'The Workshop'. The text bar reads: استهداف نقاط الجيش النصيري بقذائف الدبابة في ريف حمص الشرقي - ''Hitting positions of the Nusayri [Derogatory: Alawite] army in eastern rural Homs with tank shells.'' This tank was later destroyed by government forces in Eastern Hama, which allowed for a better look at its familiar slat armour arrangement. These last converted tanks retained the rough outline of the armour upgrades mentioned before, but executed far more poorly, featuring crudely shaped armour plating around the turret and often omitting the reinforced side skirts entirely. As the turret armour was now completely open from the top its contents and thickness can be readily identified: sand and gravel, as witnessed by the image below of an upgraded T-55 with North Korean LRF (also note the ammunition for the DShK lazily dumped into its box, preventing its proper use). These final upgrades performed by 'The Workshop' were spotted on roughly half a dozen tanks of a variety of types, some of which deployed in Wilayat al-Khayr, a city which the Islamic State still hopes to capture to give it a strategic stronghold from which to drag out the conflict as long as possible. 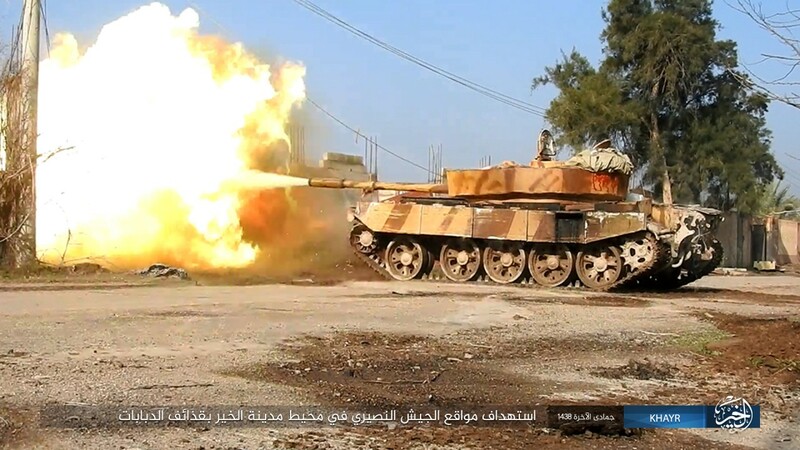 Now that its foremost conversion factories have been captured, it's unlikely we'll see a further evolution of designs before the Islamic State is vanquished in Syria. As the Islamic State's end in its current form is rapidly approaching, the wrecks of its once so impressive upgrades litter the battlefields in ever greater numbers. 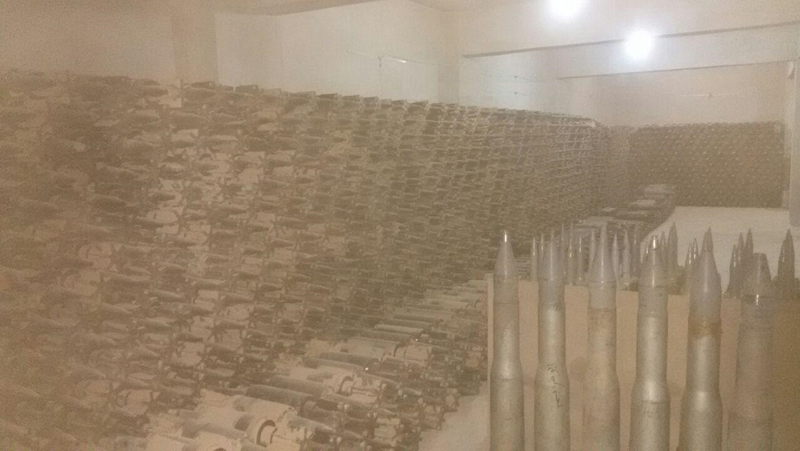 In one instance, the SDF would encounter a warehouse full of Islamic State armour near Tabqa, which had already been hit by Coalition aircraft. 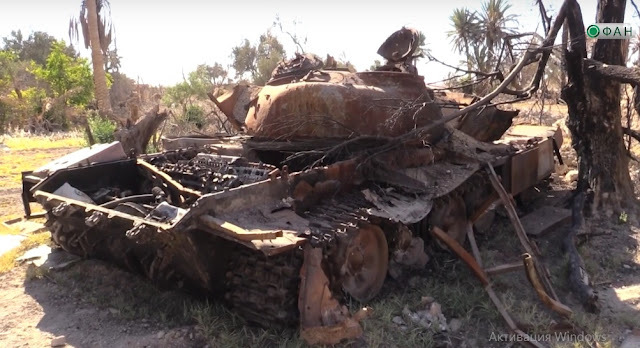 Likely used as a base by the 'Platoons of Special Tasks', it contained three T-62s, two T-55s and a turretless BMP-1, some of which showing signs they had been overhauled at 'The Workshop'. Further captures included another warehouse full of Islamic State armour near Uqayribat in September 2017, revealing several mostly badly-damaged tanks awaiting repair or conversion to VBIEDs and a similar structure in Ayyash, Deir ez-Zor. Interestingly, the latter contained a 9P122 ATGM carrier that had also been overhauled by 'The Workshop', receiving the serial '100'. Footage of 'The Workshop' itself showcased the remnants of what once was a large operation, now only evidenced by countless bombed out wrecks and vehicle parts waiting in vain for their repair which never came. Nevertheless, the impressive scale of 'The Workshop' is undeniable, reaching far beyond mere DIY and venturing well into a professionally organised and managed upgrade programme, much more advanced than what most other rebel factions in the Syrian War could muster. Although the tanks themselves were rarely used in a role where their (upgraded) armour could actually be used effectively, with many of the fanciest examples simply obliterated by enemy air power, 'The Workshop's' effect on the war cannot be underestimated. Aside from the scores of uparmoured tanks which demonstrated the ingenuity and resourcefulness of engineers working for the Islamic State, the hordes of VBIEDs for which it was also responsible may have changed the way warfare is conducted forever. Through close to half a decade of gruelling warfare and continuous aerial bombardment this threat is now finally its way to being subdued, once again transforming the Islamic State from a state of terror capable of waging open conventional warfare to a terrorist group in hiding. Beyond the path of destruction and suffering it leaves in its wake, in time only the rusting husks of its bombed out armour creations will be left to attest it had ever existed, scarring the Middle Eastern landscape like it has scarred its population. Special thanks to Hassan Hassani, Abu Nuggie, Within Syria and Morant Mathieu. Best article ever for " the workshop "
If you knew the location of this workshop a long time ago, why didn't you communicate it to the Coalition, Russia or the SAA? Is the logistical efficiency advantage of such centralization worth the increased risk ? How much maintainance & upgrade cannot happen in smaller stealthier workshops ? Couldn't the IS organizational skills have supported distributed operations with mobile technical teams and scattered stocks ? That was a hell of an article. Well worth the wait I say. Great as usual. 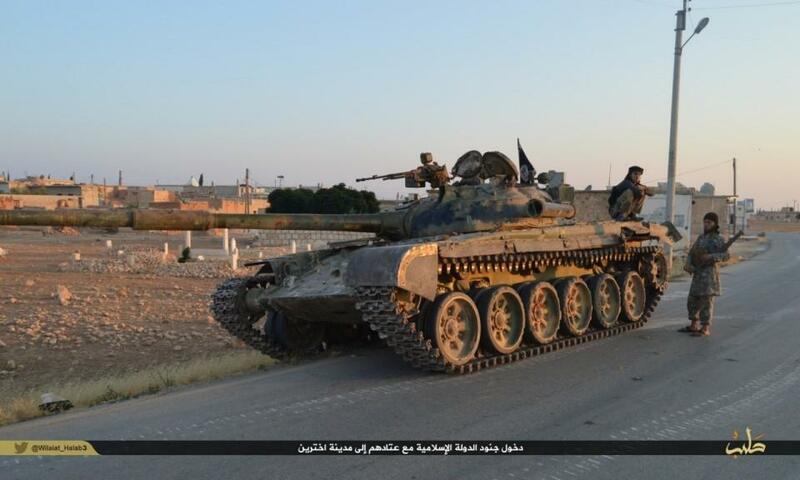 Will you be writing anything about the recent Syrian offensive against Islamic State? That's been going very well from what i've seen. You've caught us at the point where we'll be making a departure from writing on the Syrian/Iraqi conflict until further notice, so there won't be any article on Deir ez-Zor I'm afraid. I look forward to your future work though! Check our Twitter for updates on operations and successes of the SyAA and allies! love the in depth you go on these articles! Now that the war could be over whats next for Oryx? Great article. I believe there are a few IS published images of T-55 SVBIEDs from DeZ from Dec 2015. If the armor systems were effective it comes to show how improvisation and especially in a state perceptually changing war is a cheap solution.